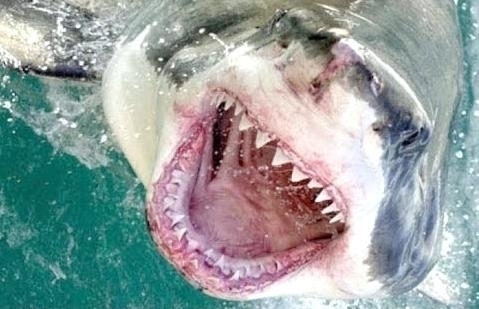 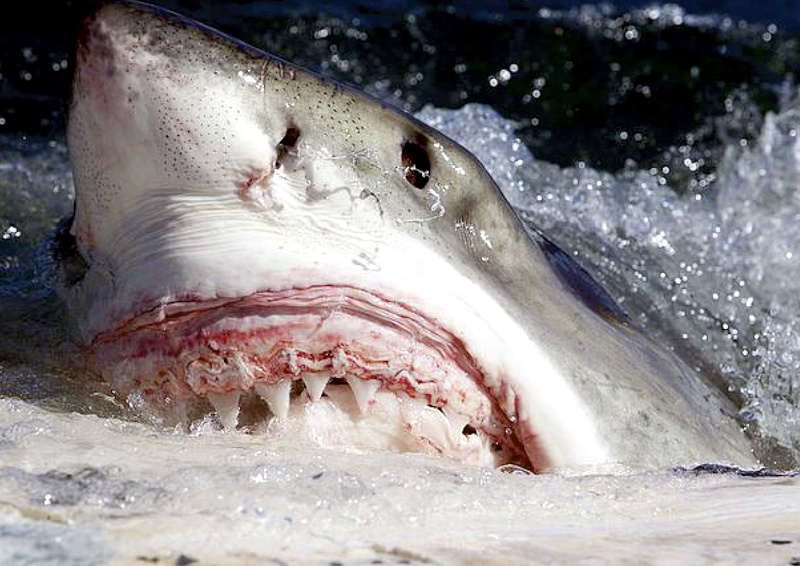 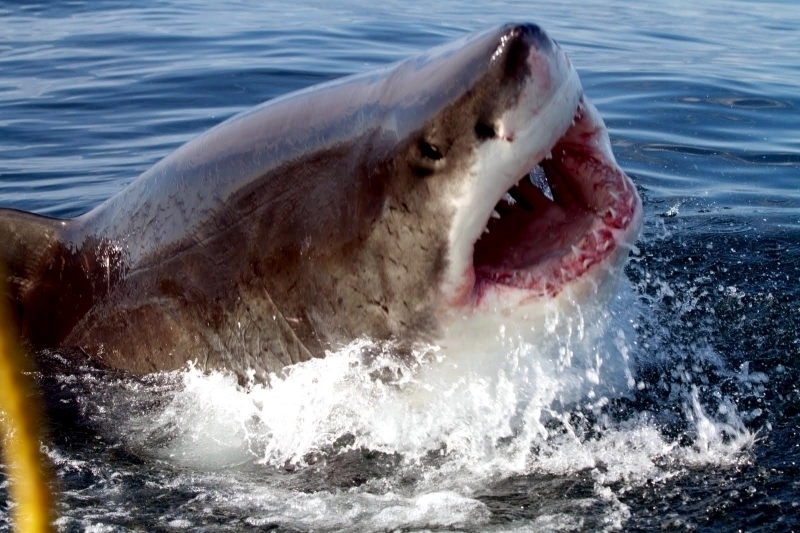 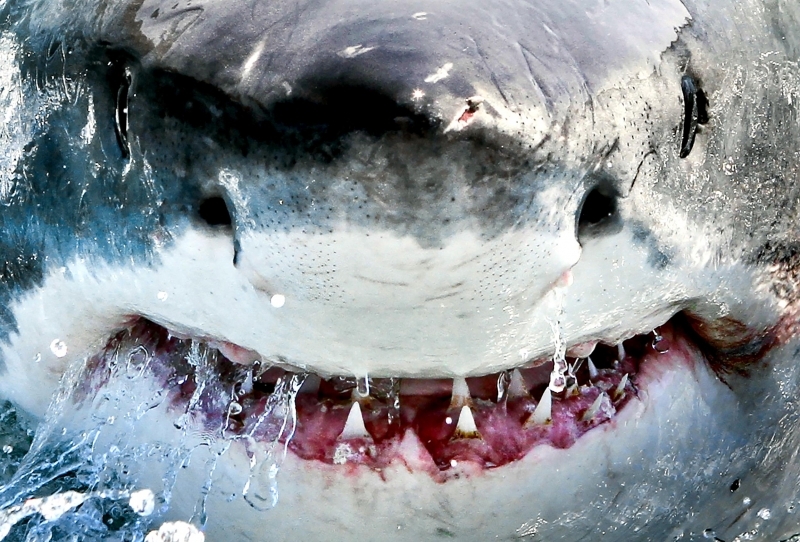 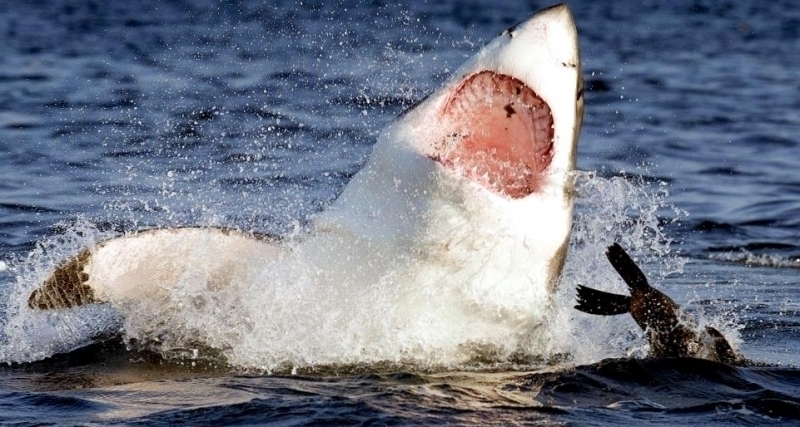 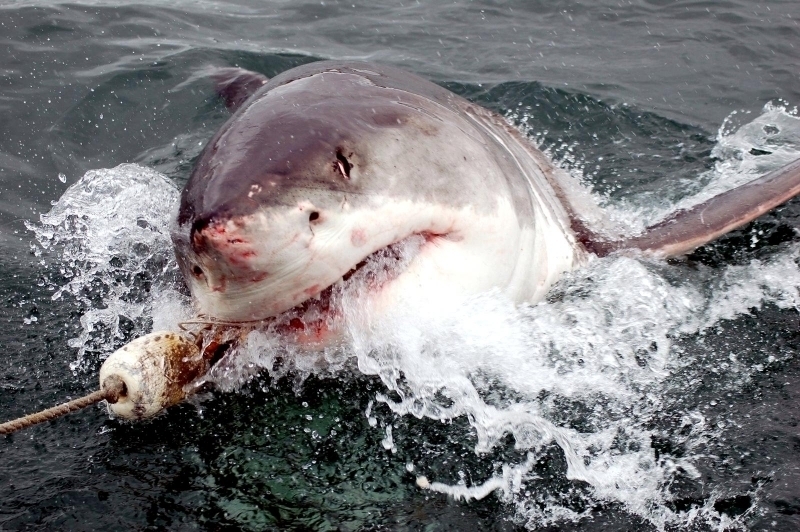 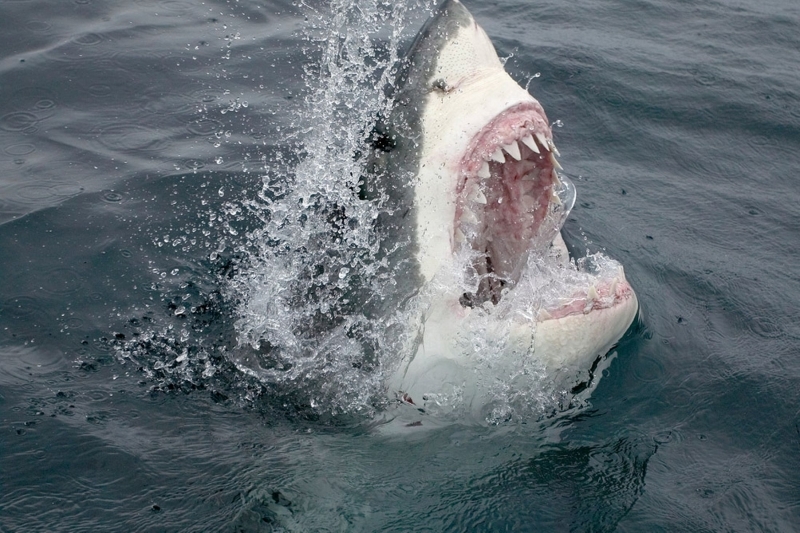 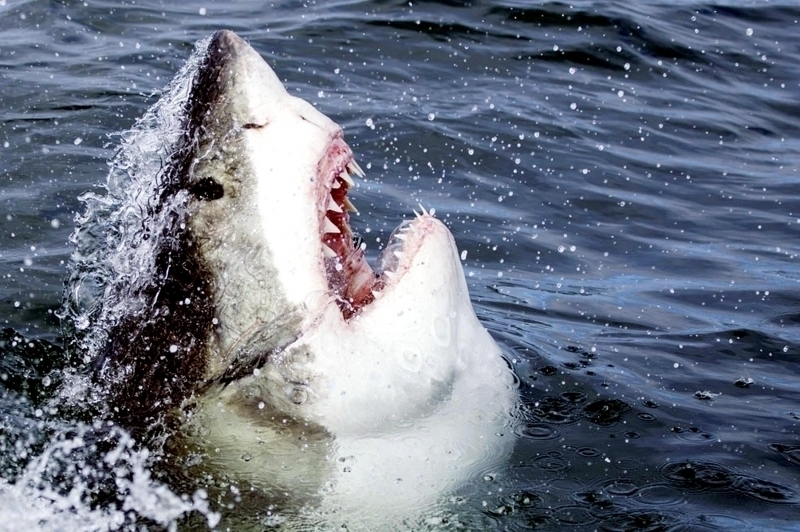 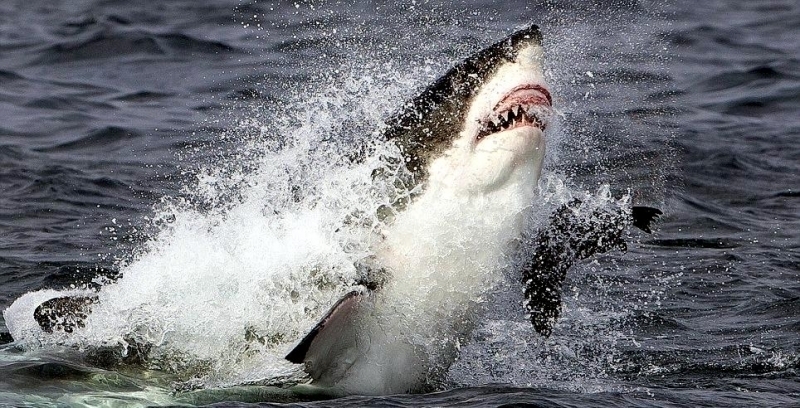 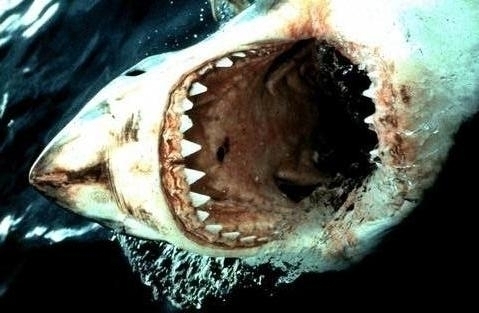 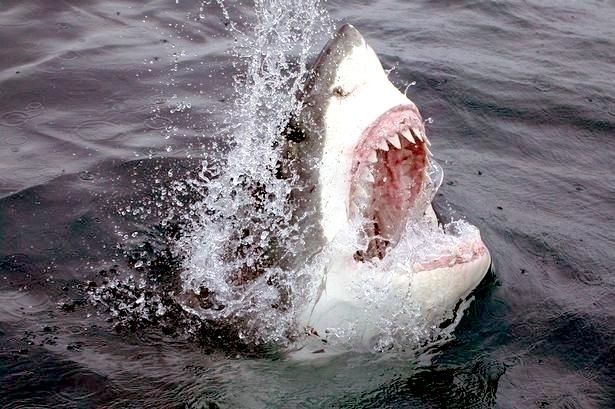 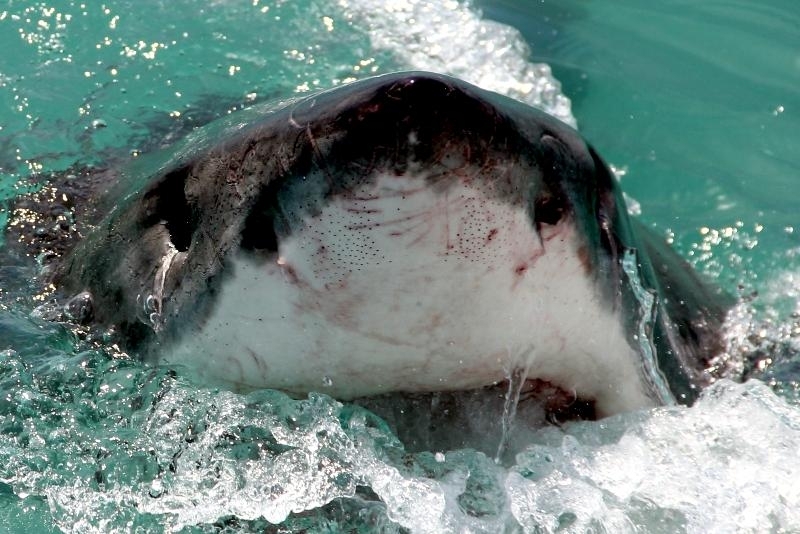 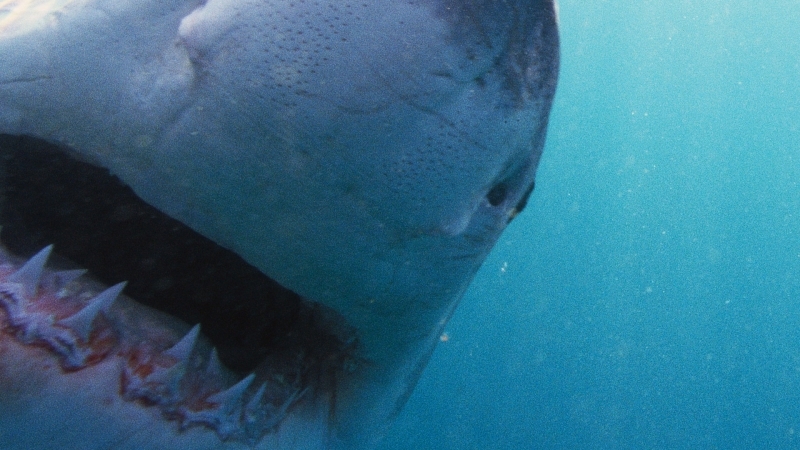 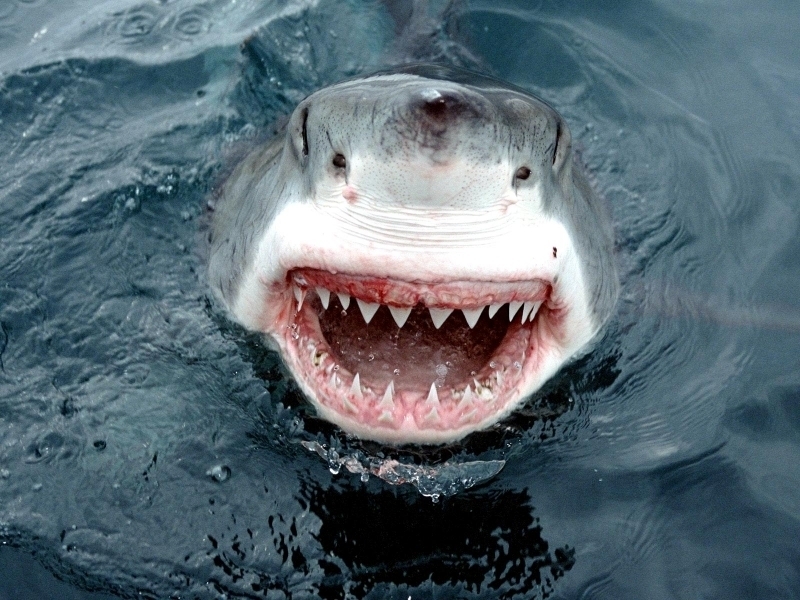 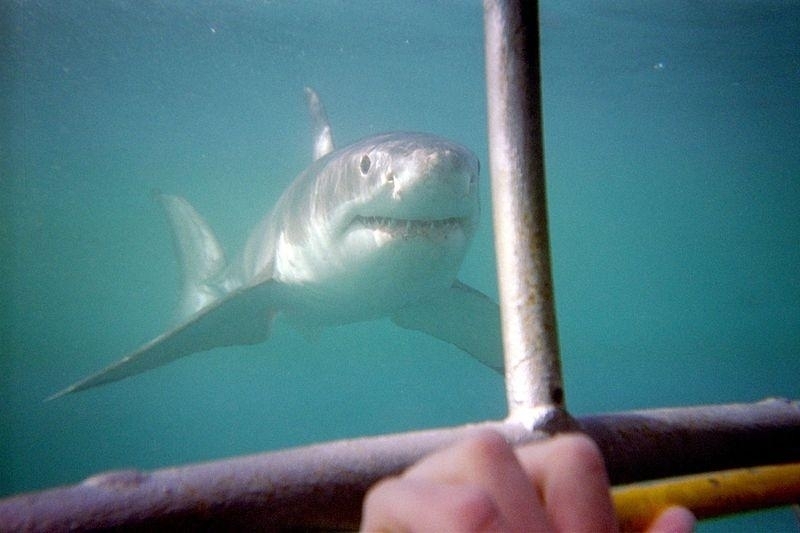 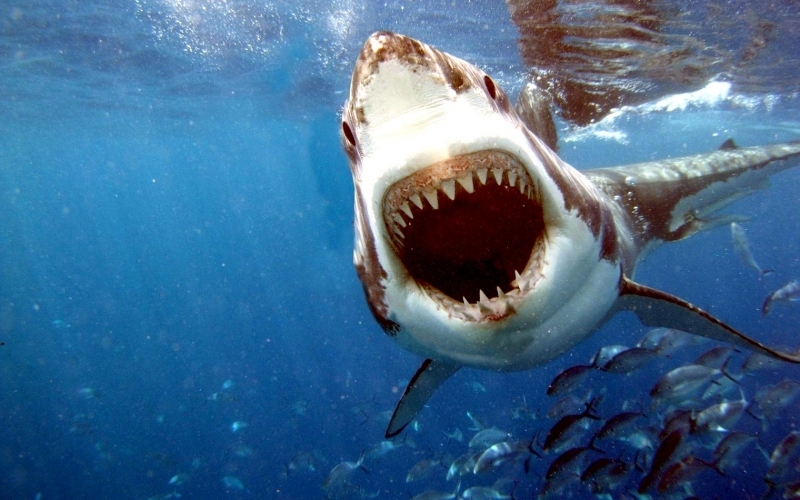 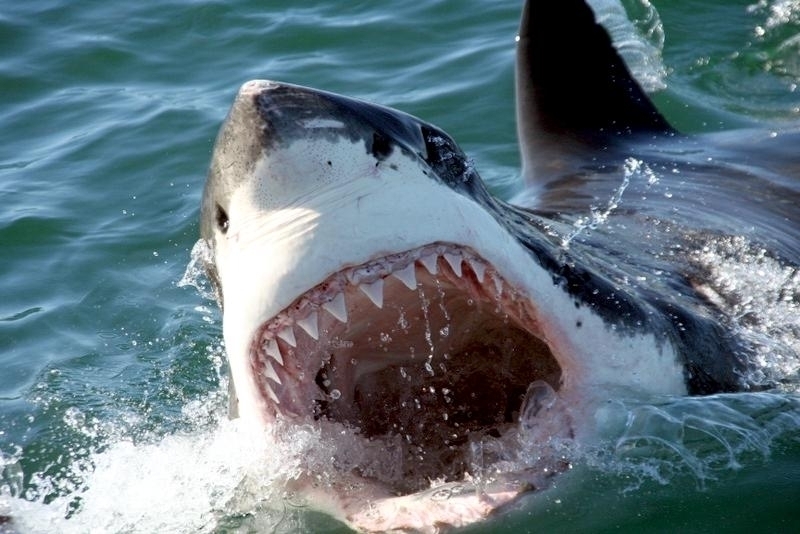 Few creatures strike more fear in humans than the Great White Shark. 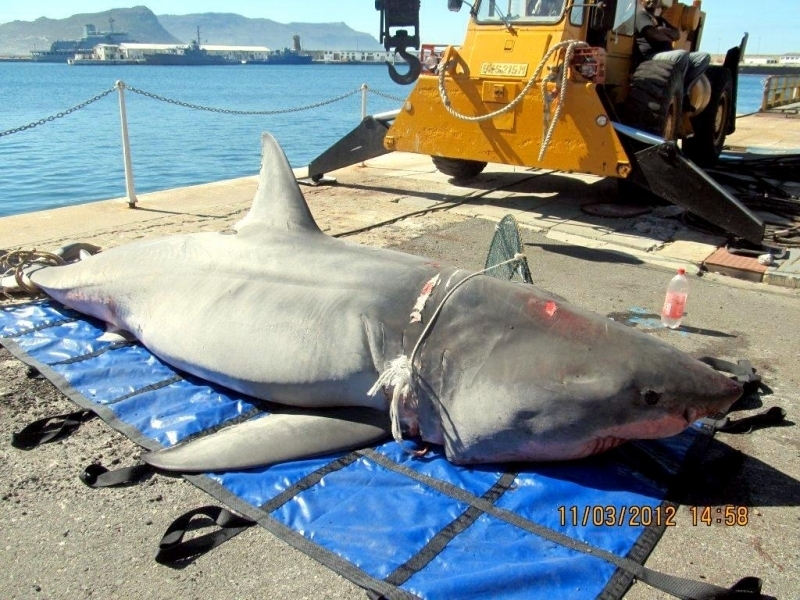 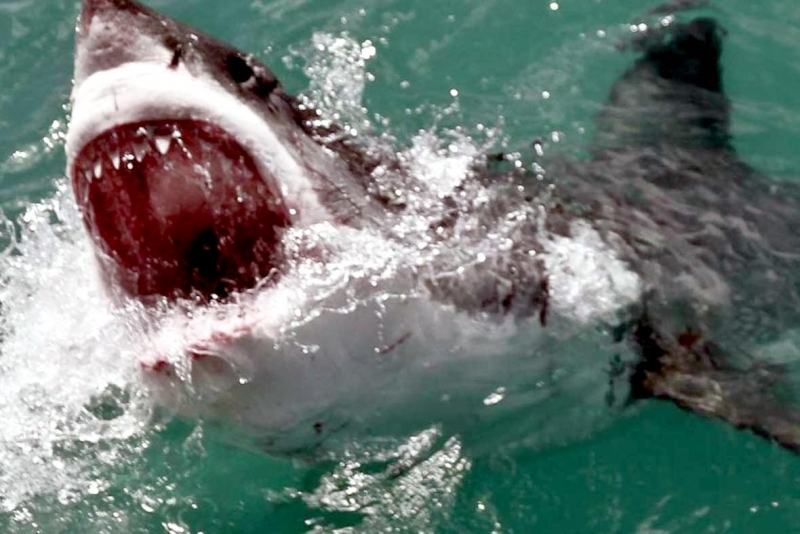 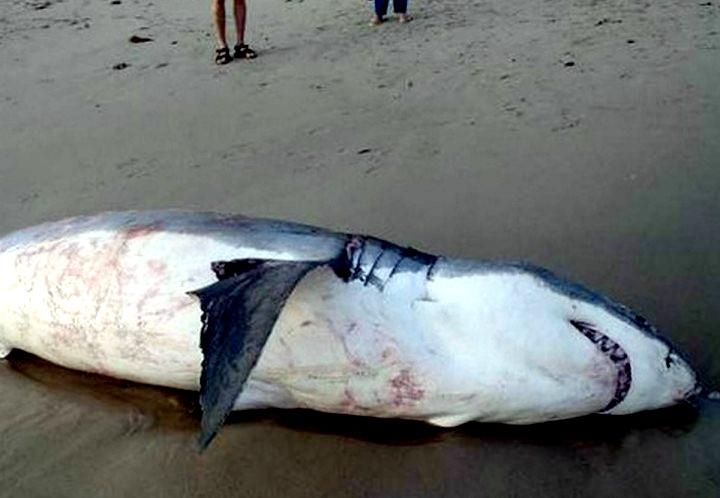 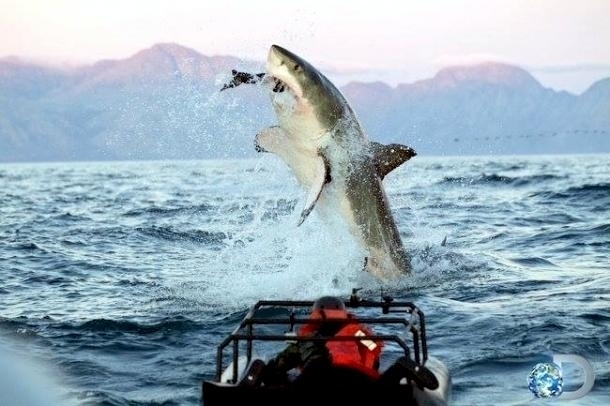 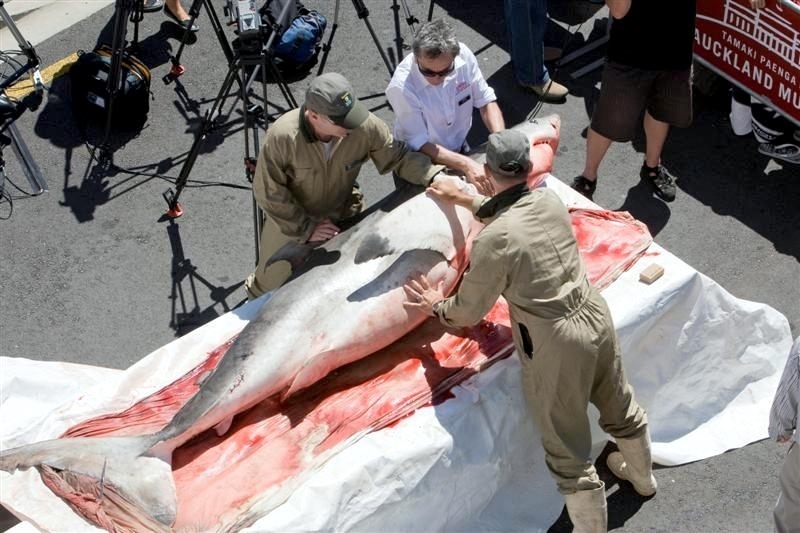 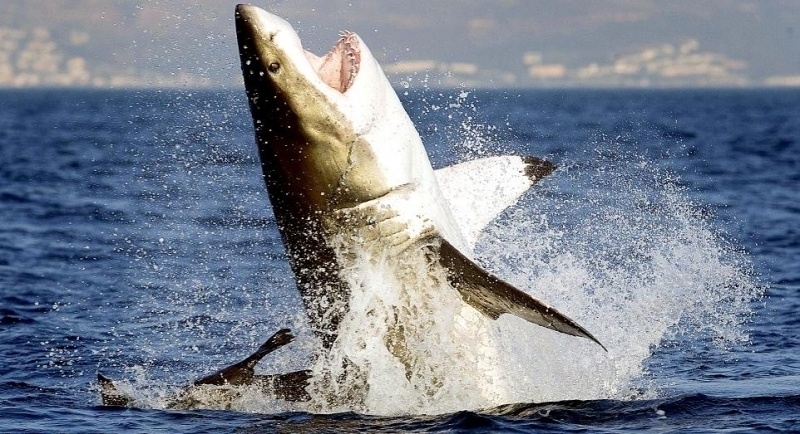 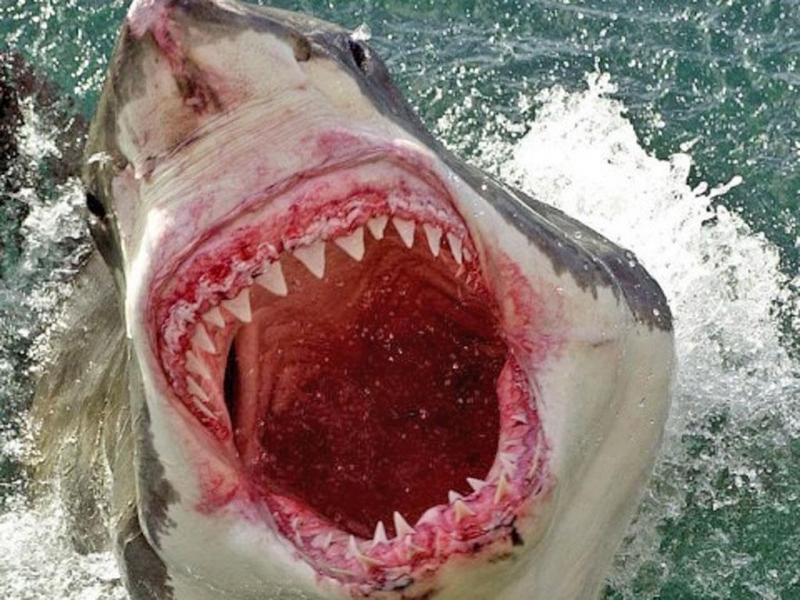 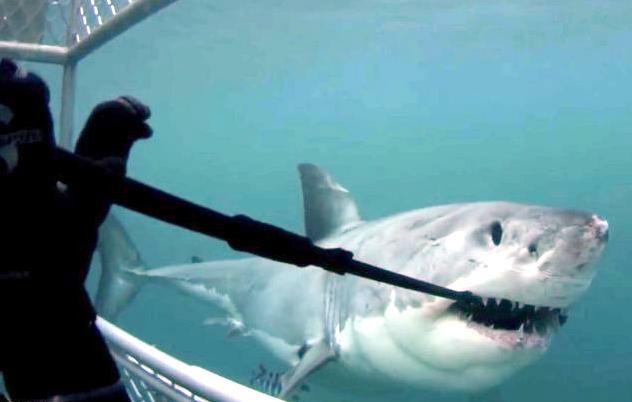 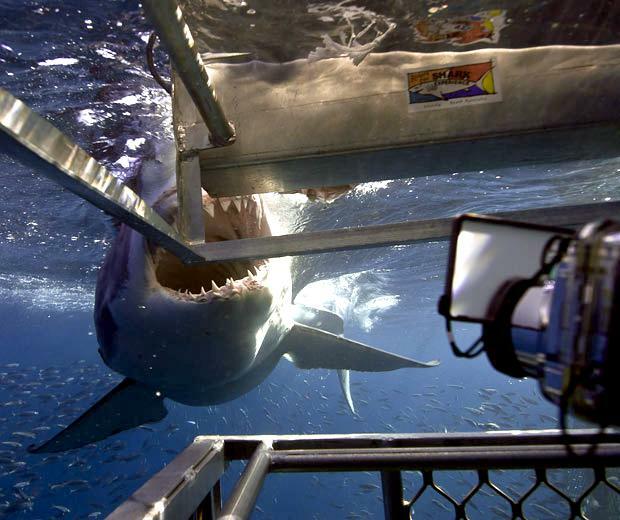 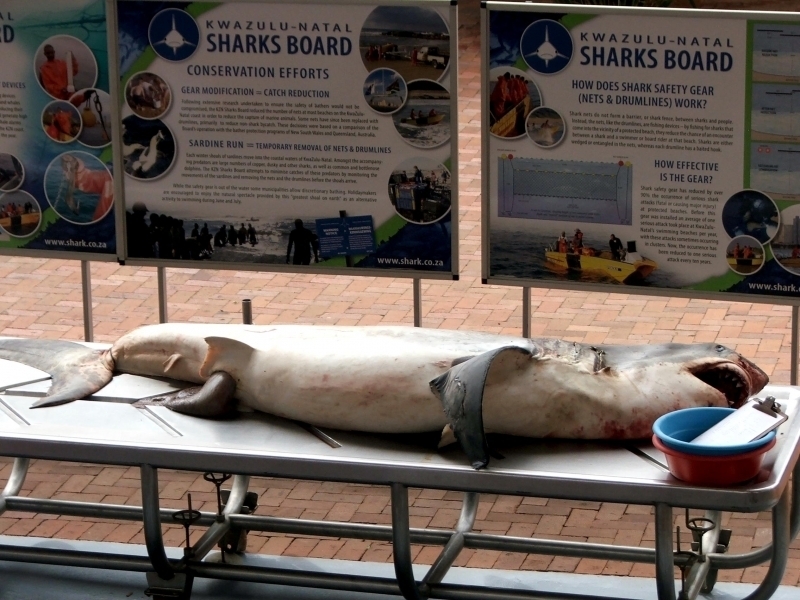 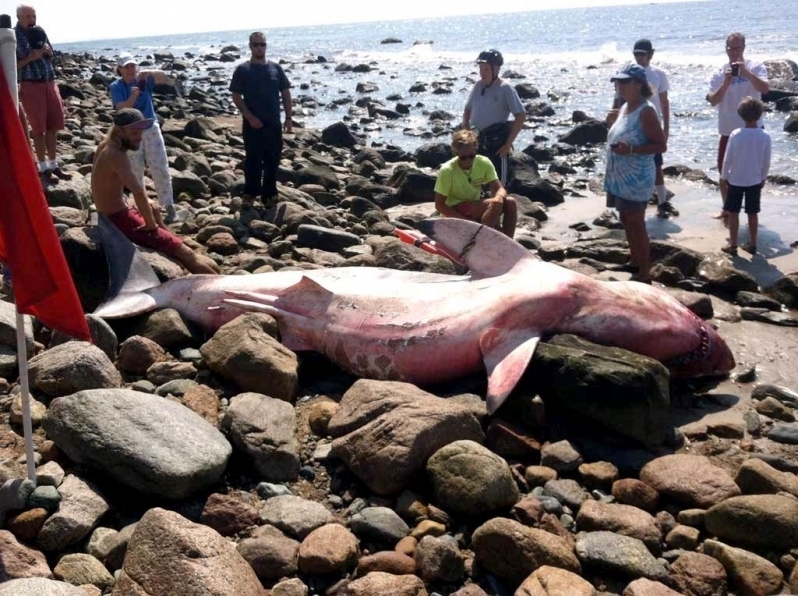 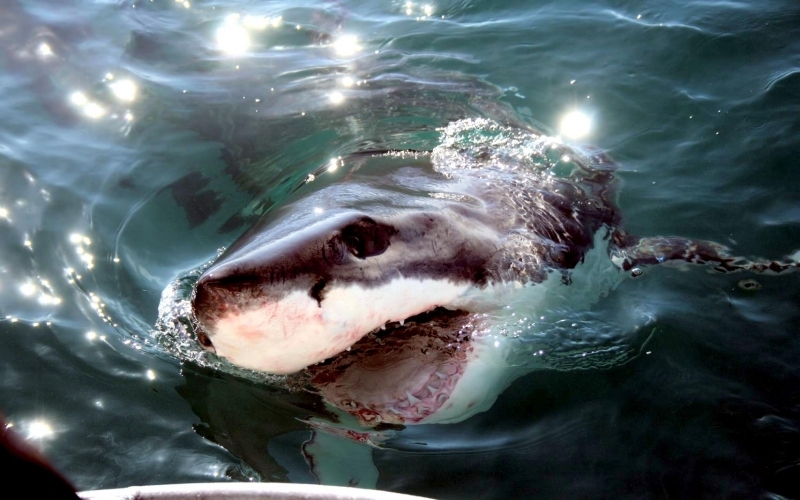 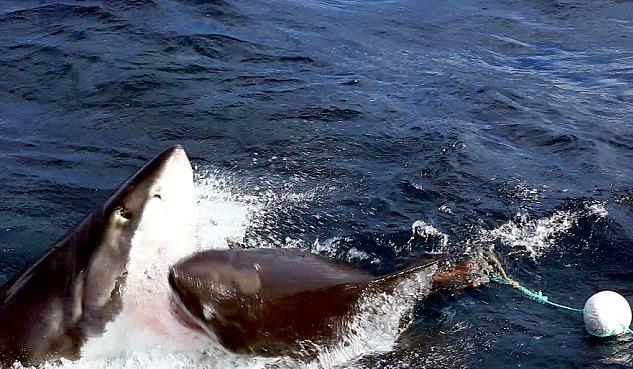 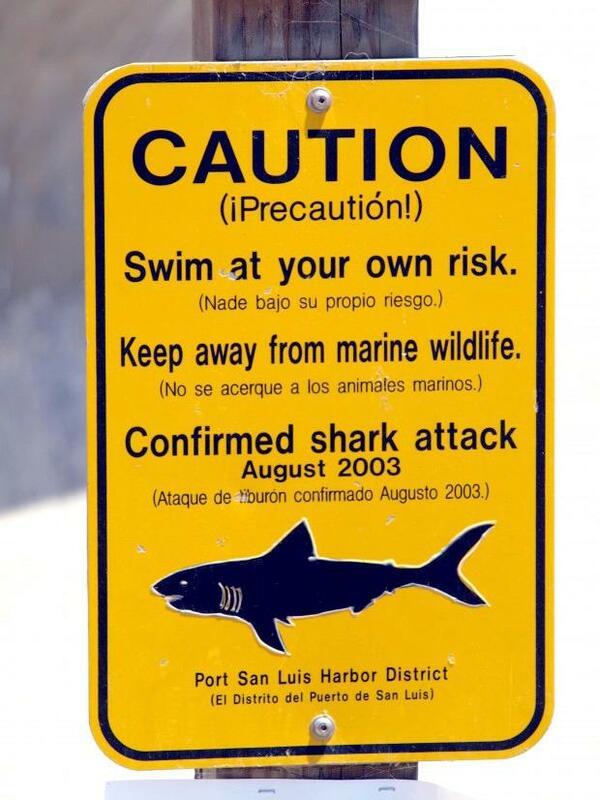 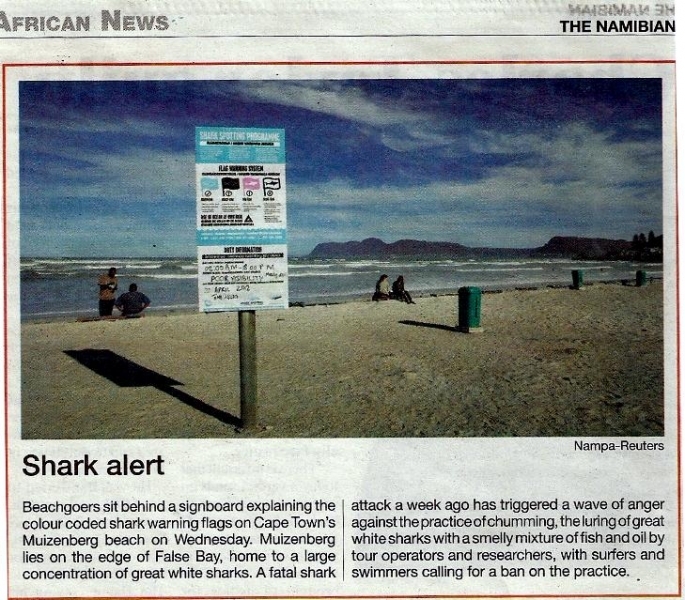 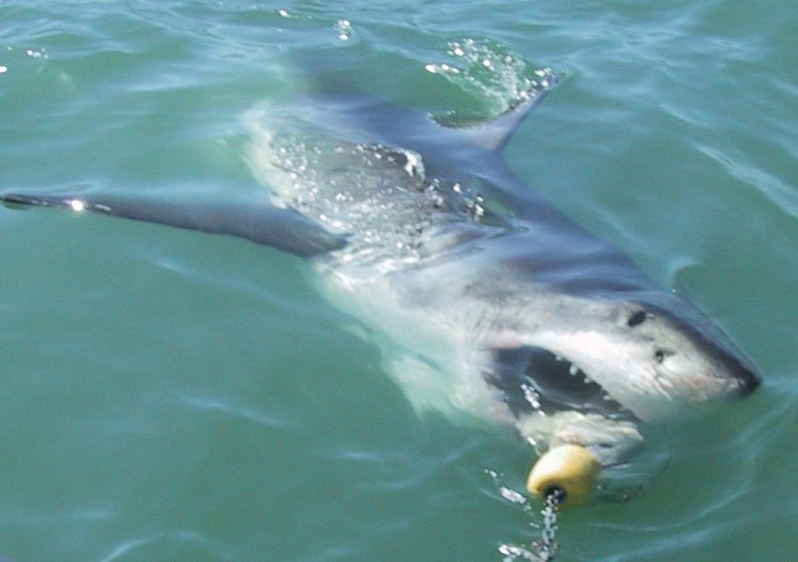 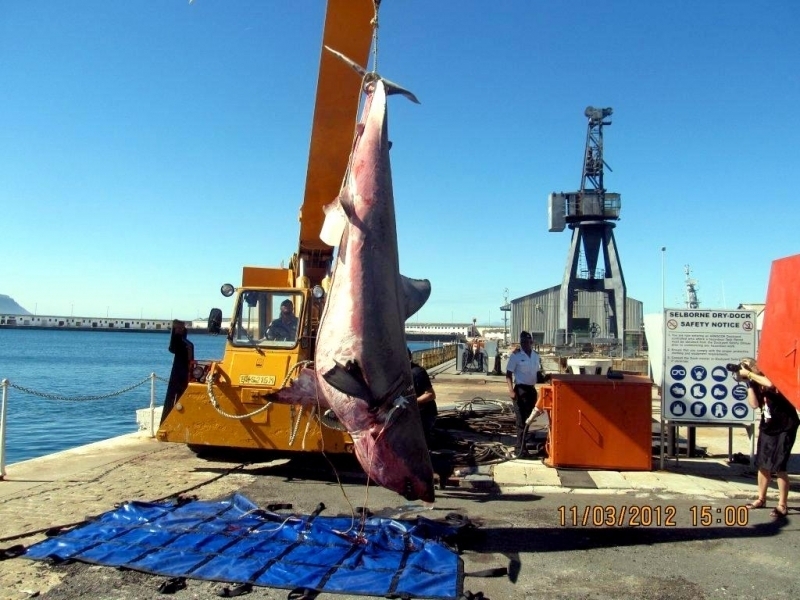 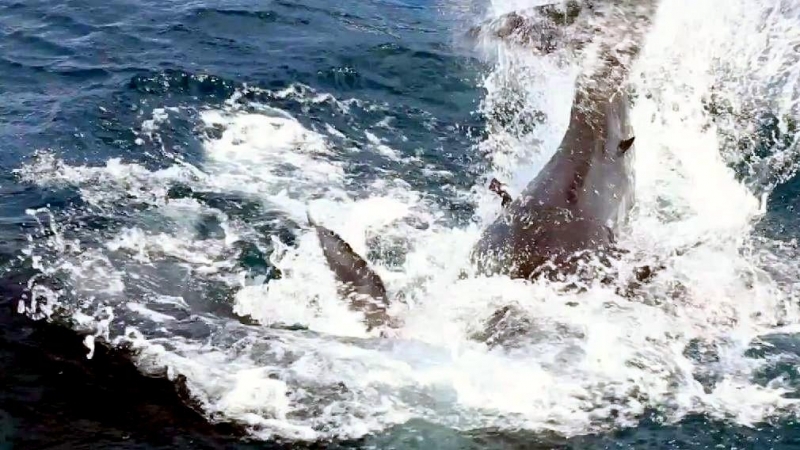 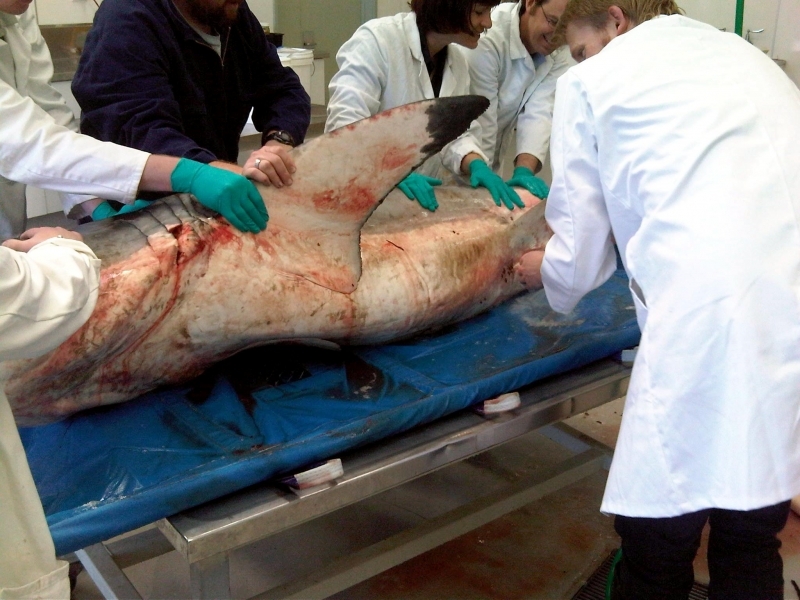 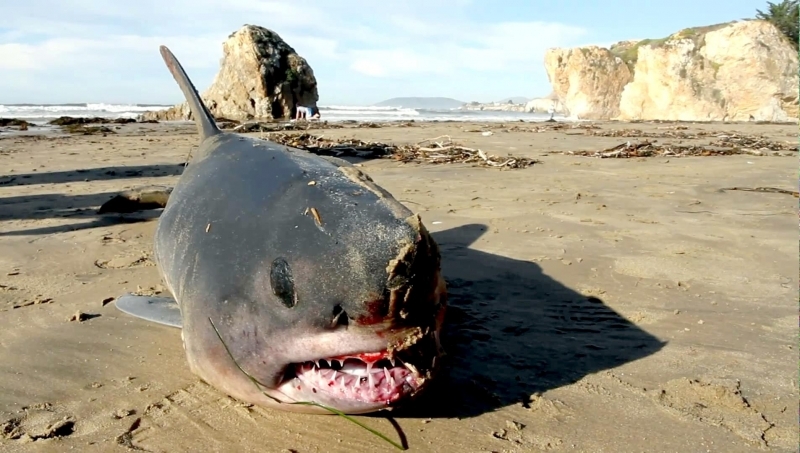 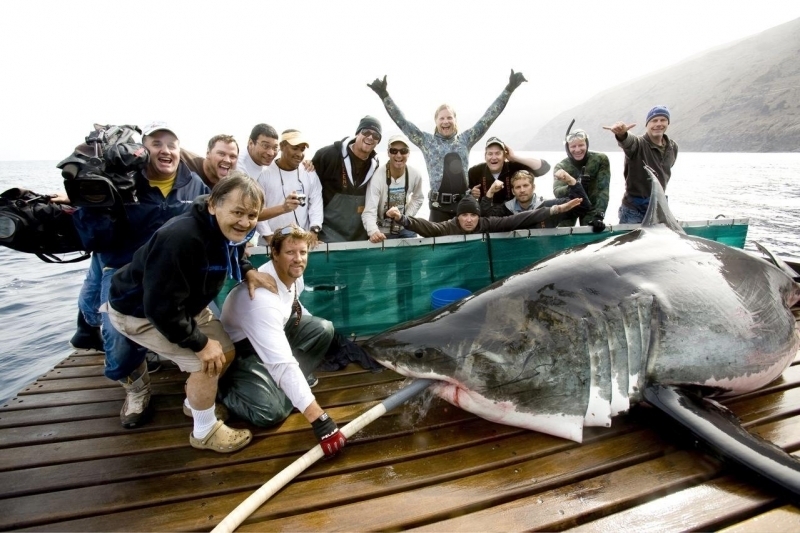 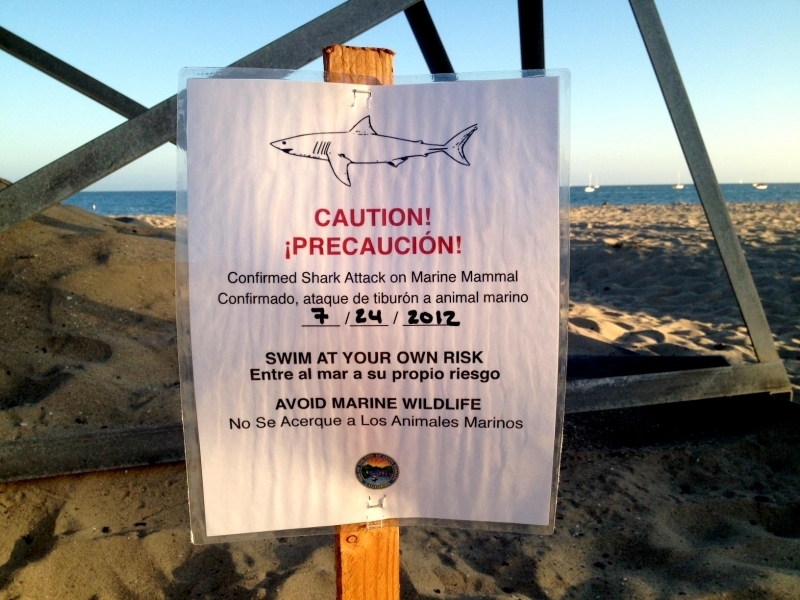 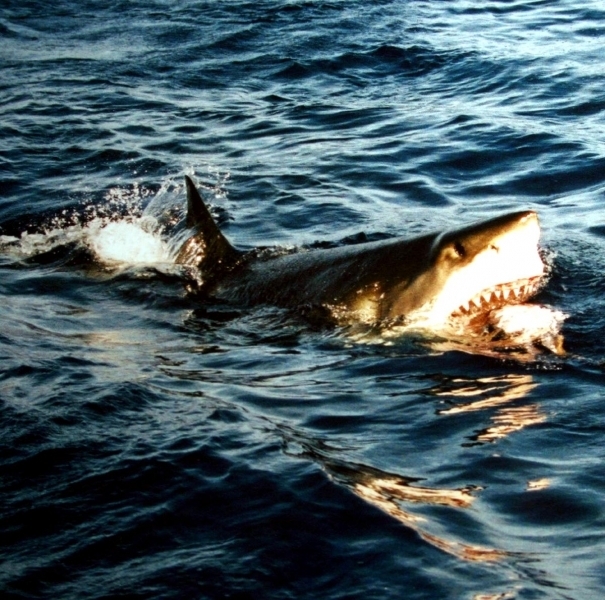 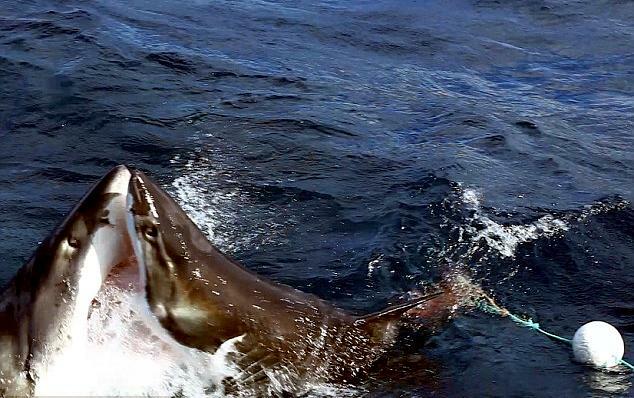 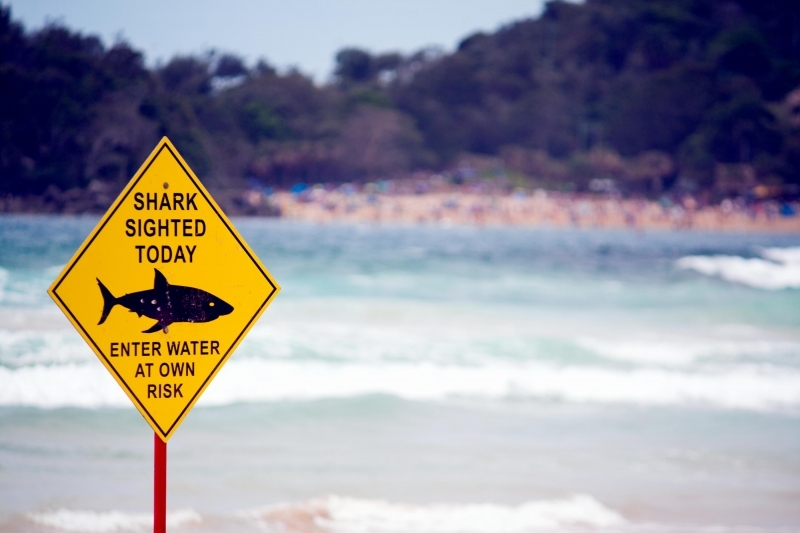 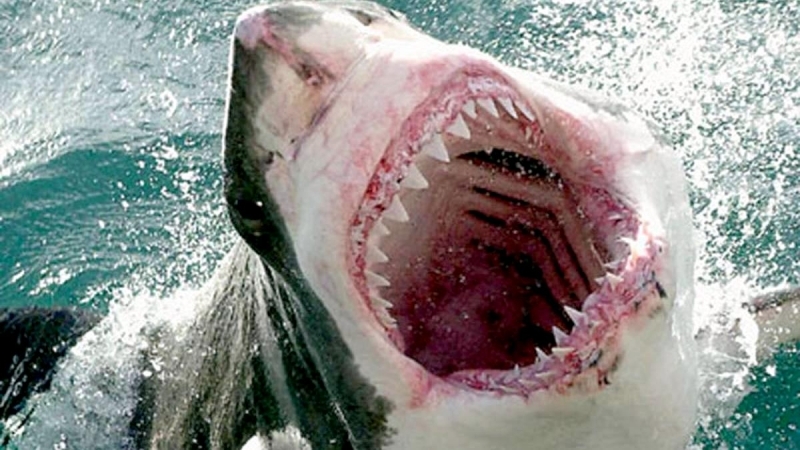 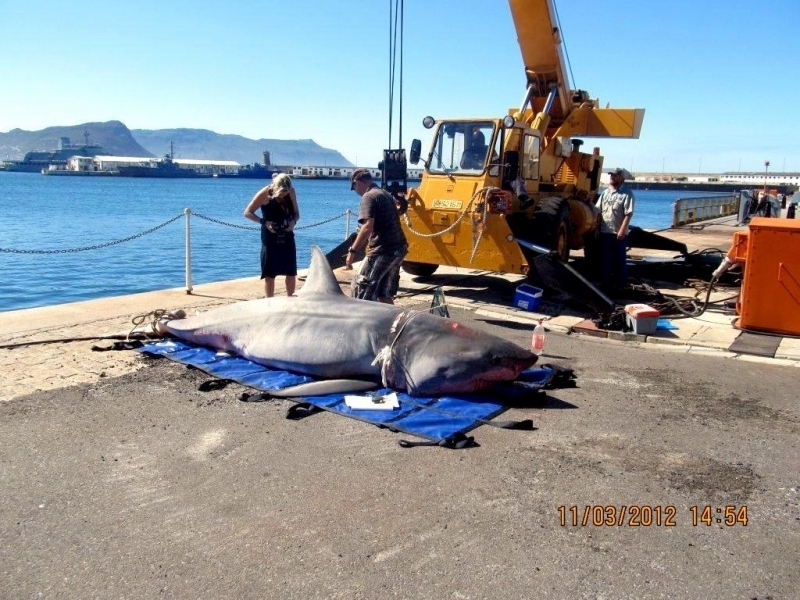 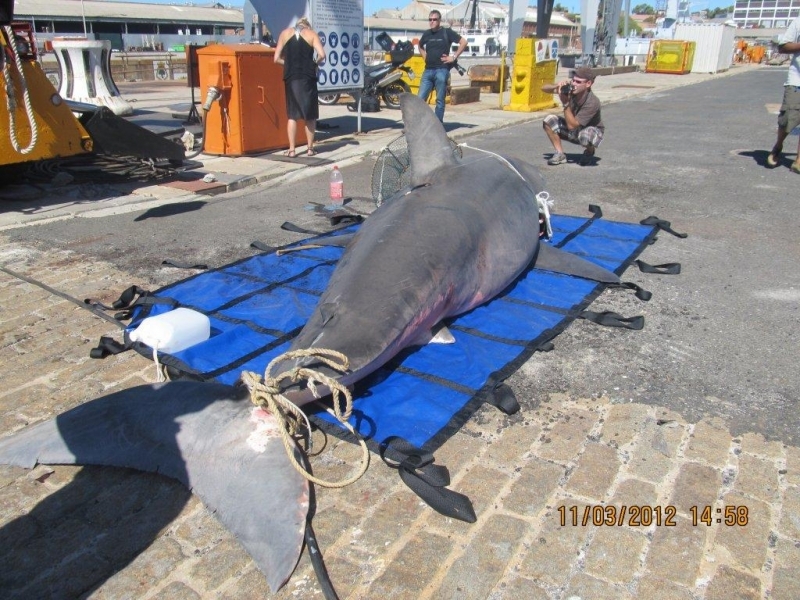 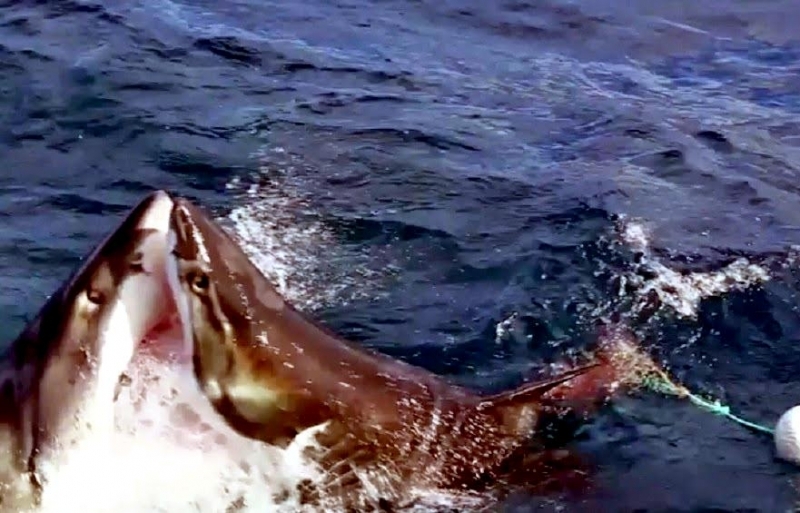 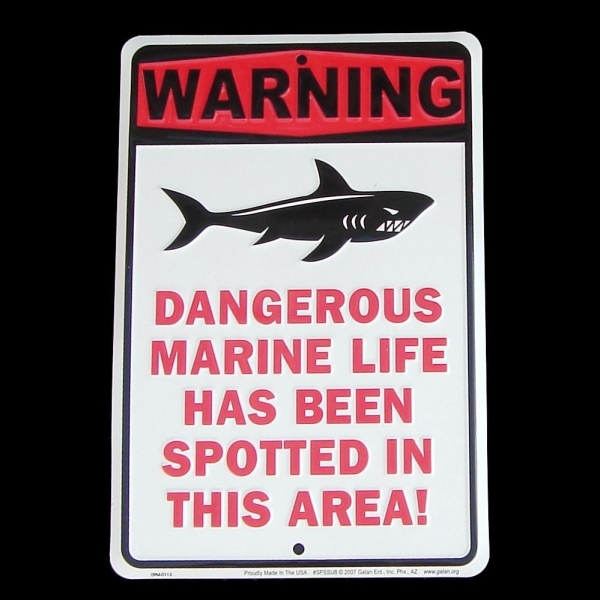 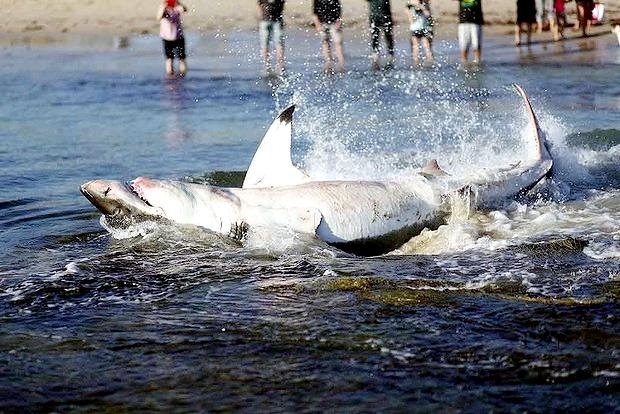 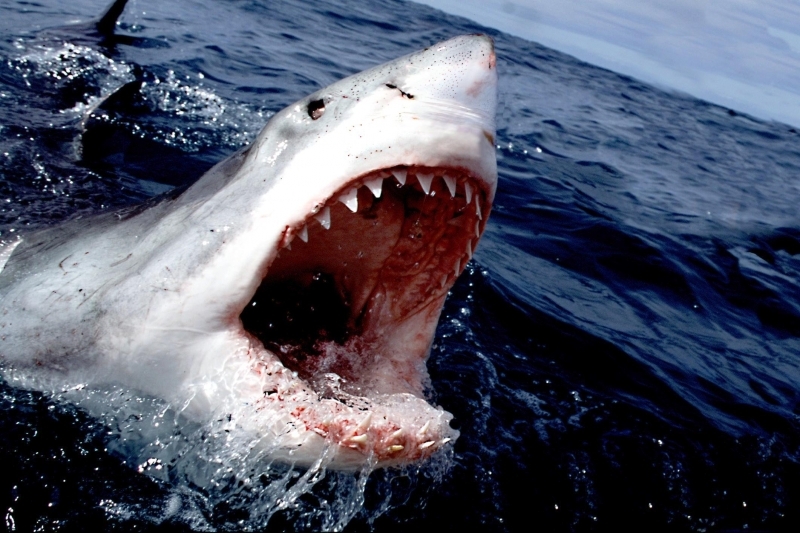 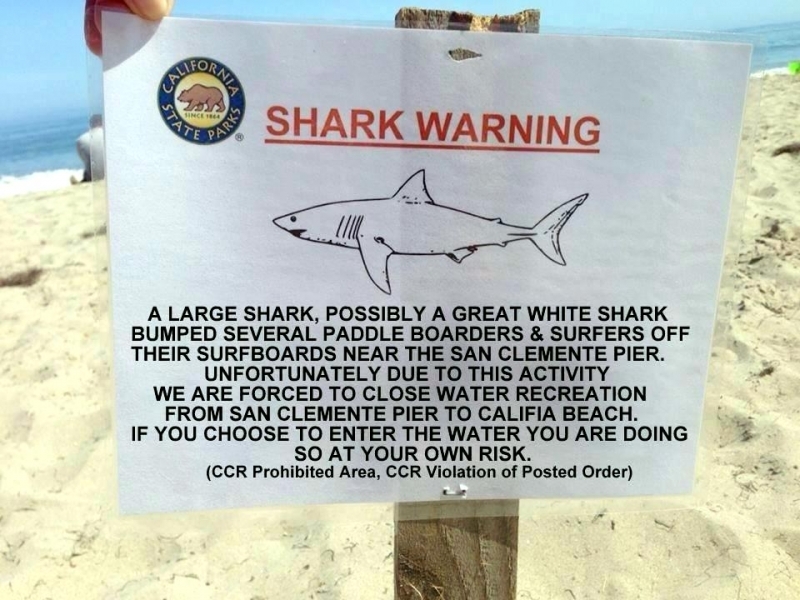 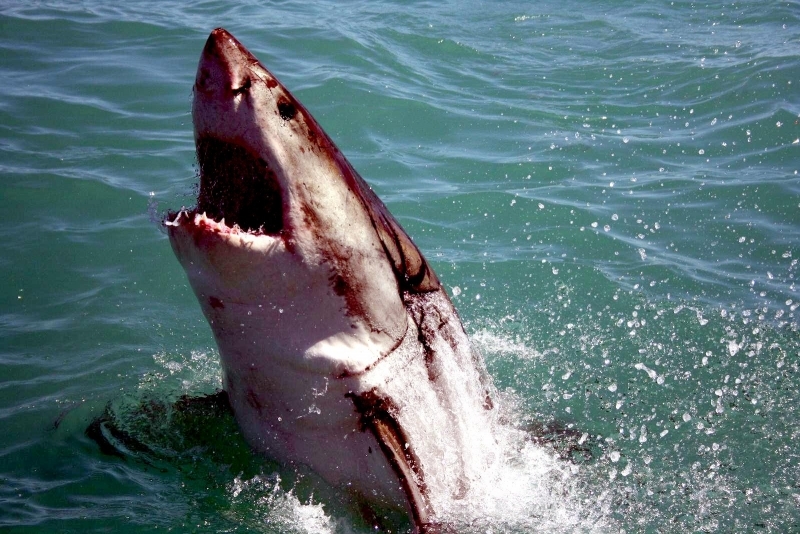 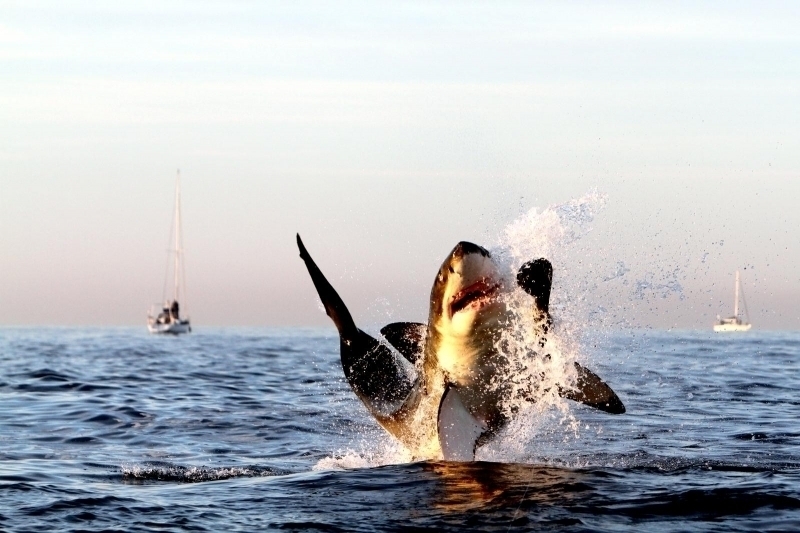 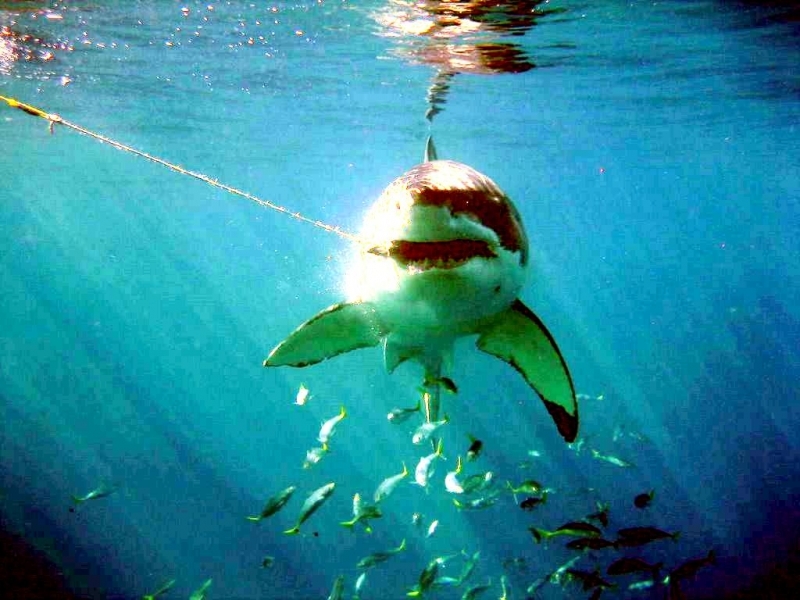 In reality, Great White attacks on humans are rare and it is even rarer for one of these attacks to be fatal. 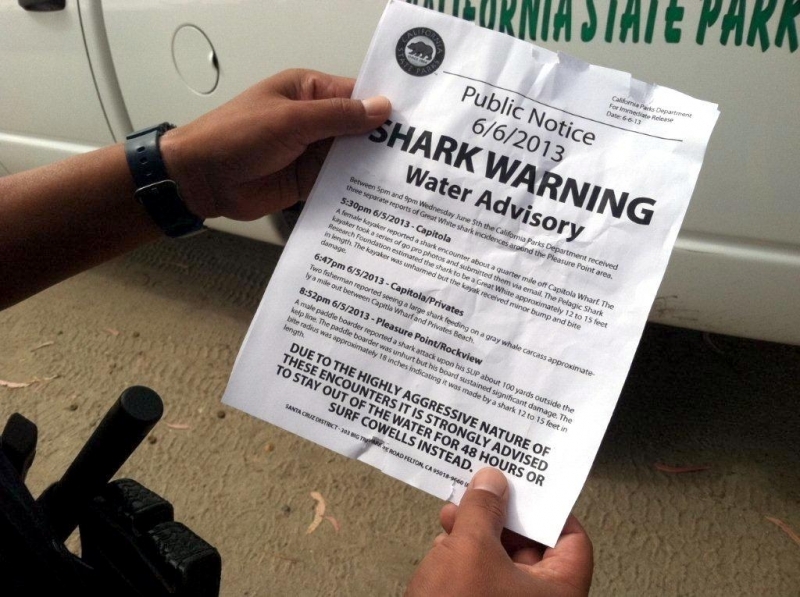 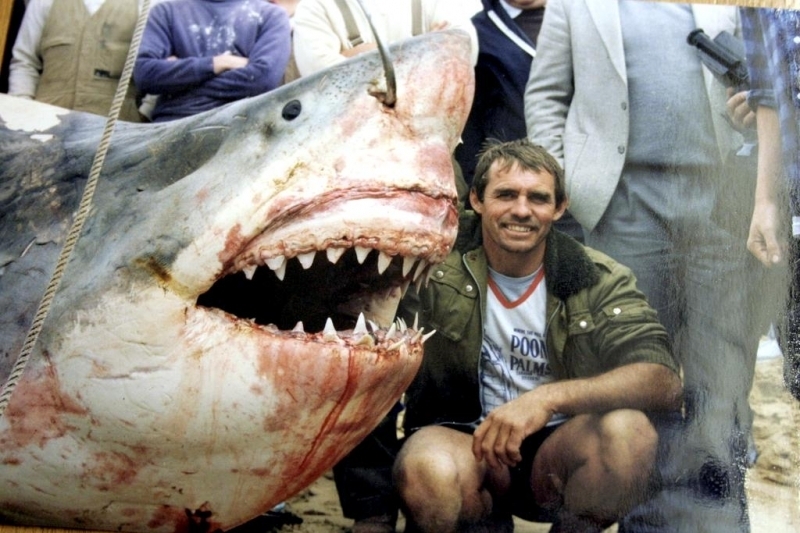 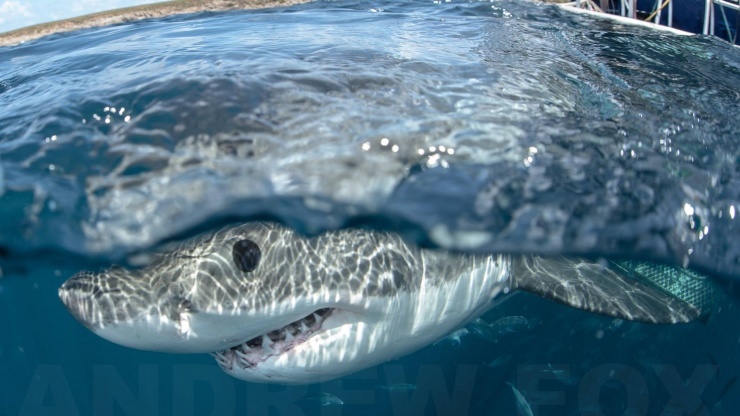 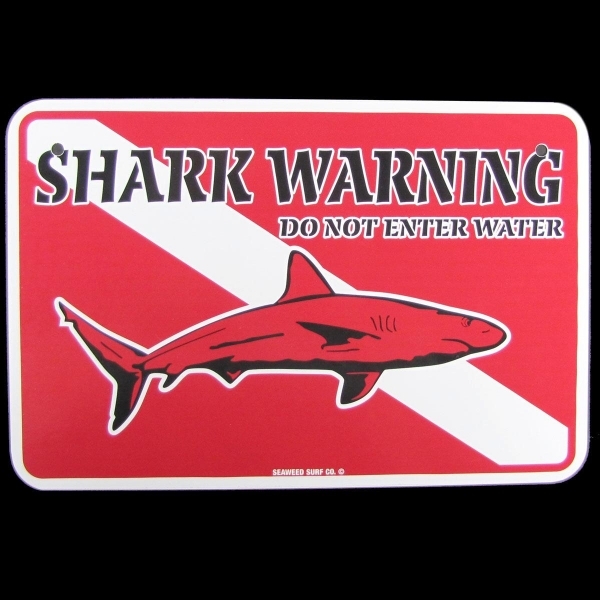 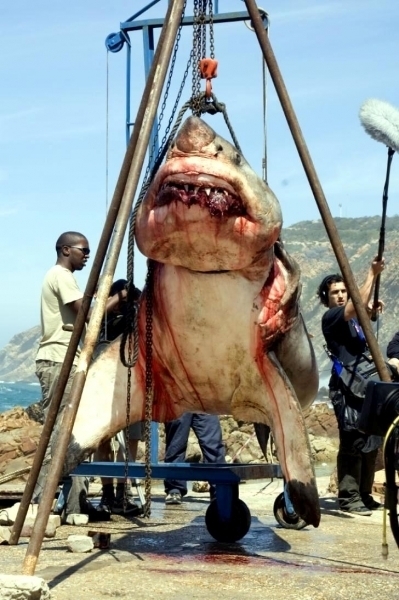 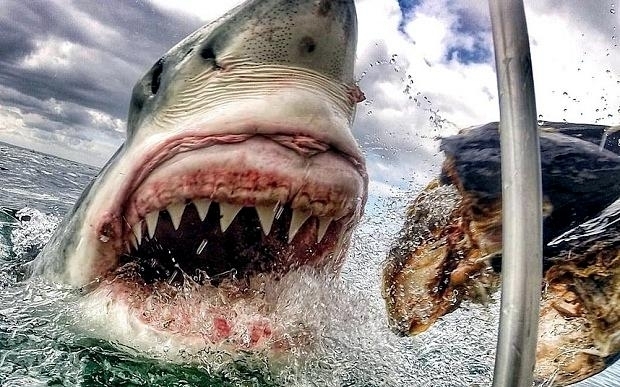 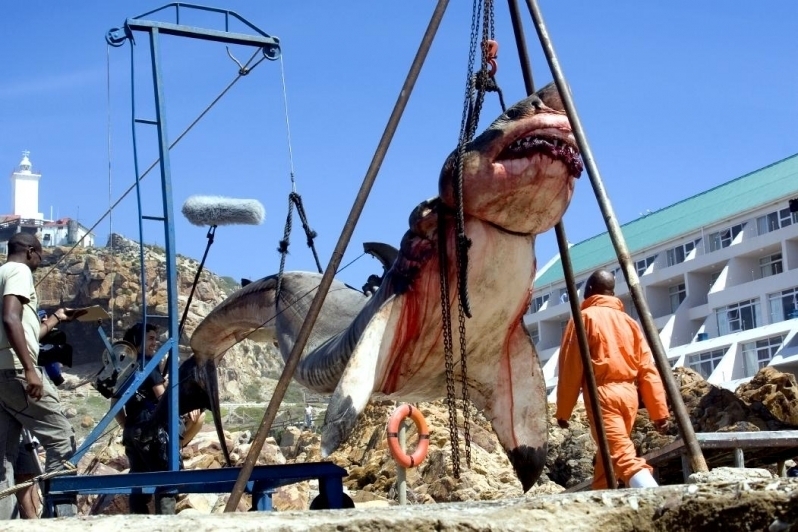 However the size of the Great White Shark, its efficiency as a predator and movies such as “Jaws”, add to the perpetuation of this unnecessary fear. 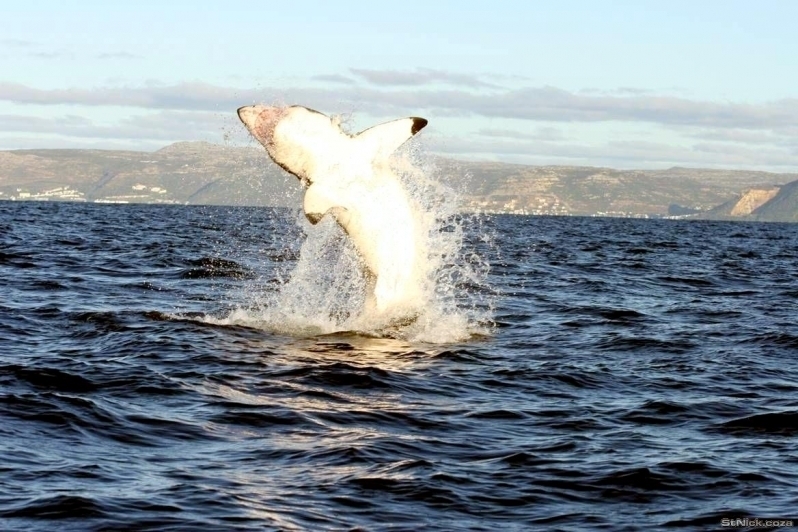 The Great White averages 15 feet in length, but some have been recorded as large as 20+ foot long and generally weigh up to 5,000 pounds. 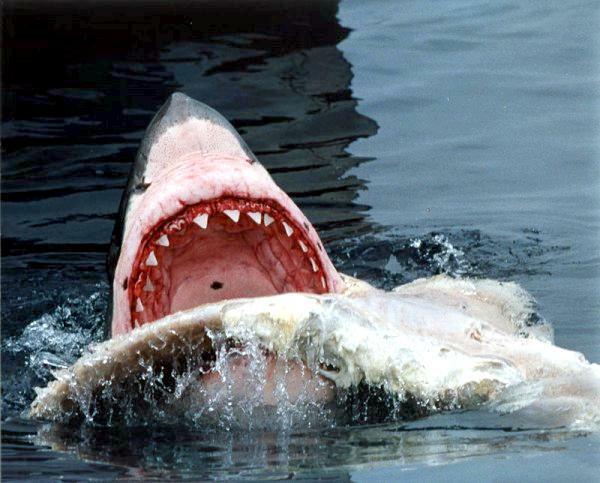 Great Whites also known as the “White Pointer”, are blue-gray on the dorsal or top part of their bodies. 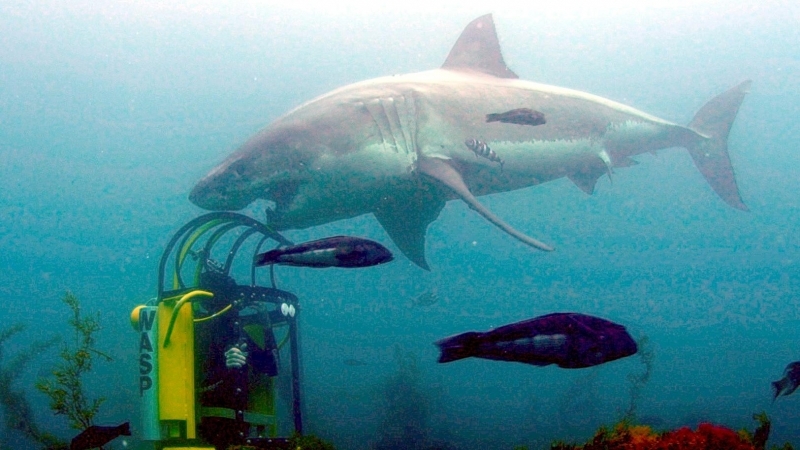 This helps them blend in with the bottom of the ocean when viewed from above. 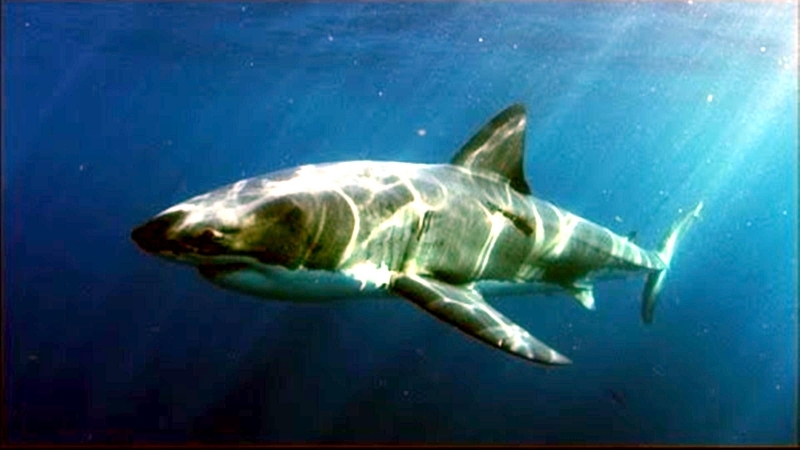 The belly or ventral part of the body is white. 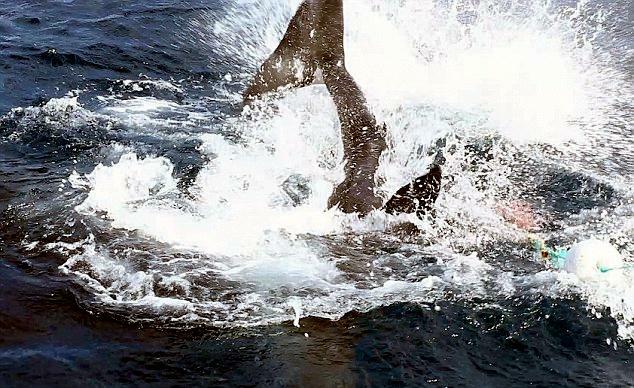 This makes it difficult to see the sharks from below, with sunlight shining in around them. 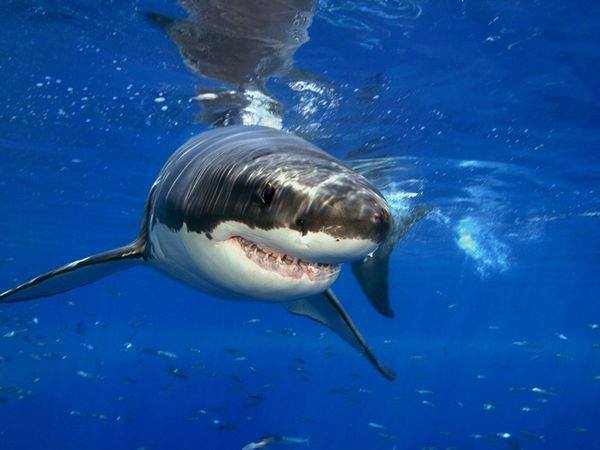 They have strong, torpedo-shaped bodies and powerful tails that help them swim. 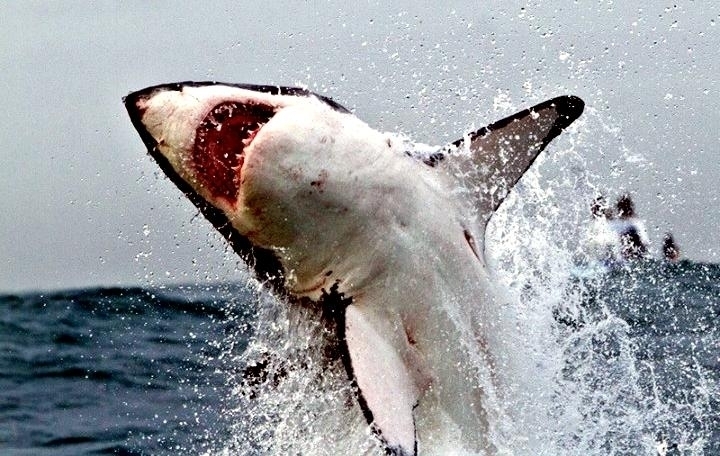 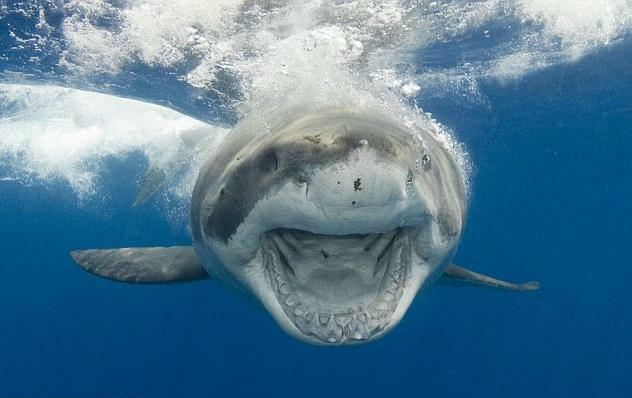 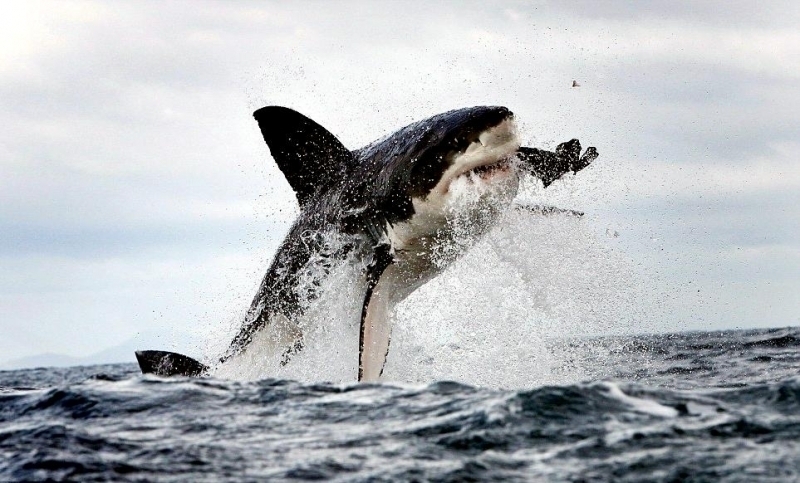 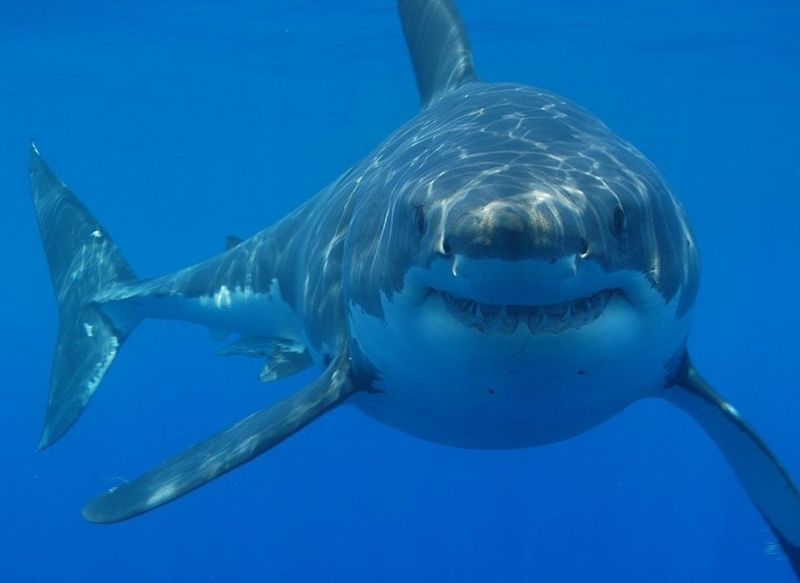 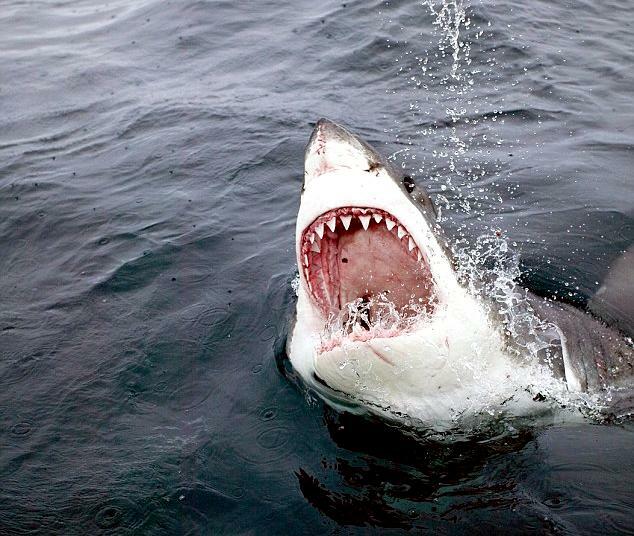 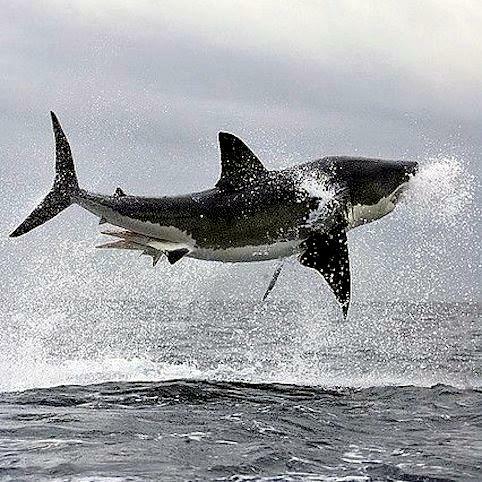 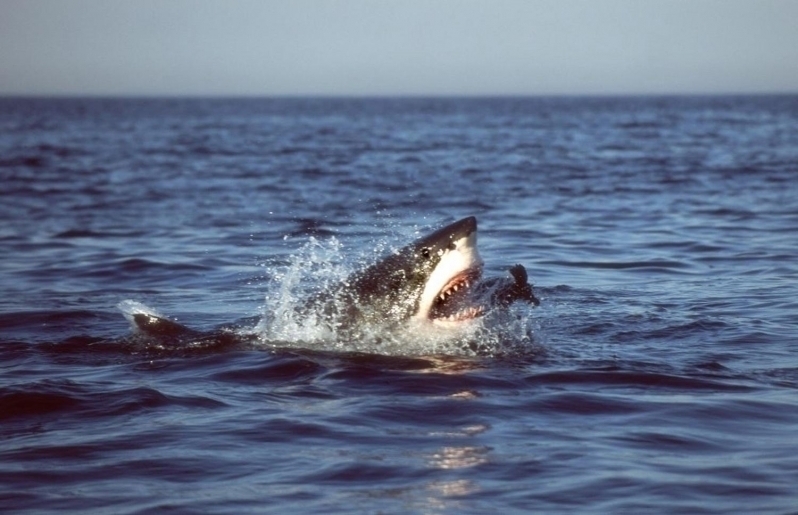 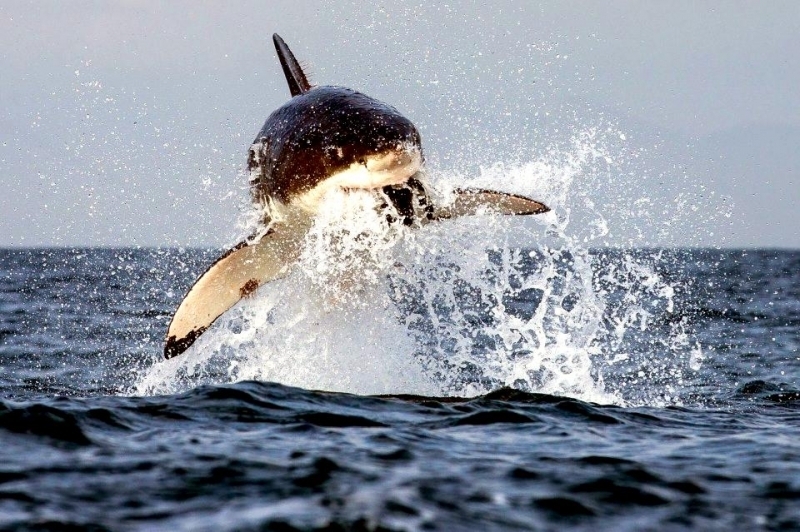 Great White Sharks can reach speeds up to 15 mph. 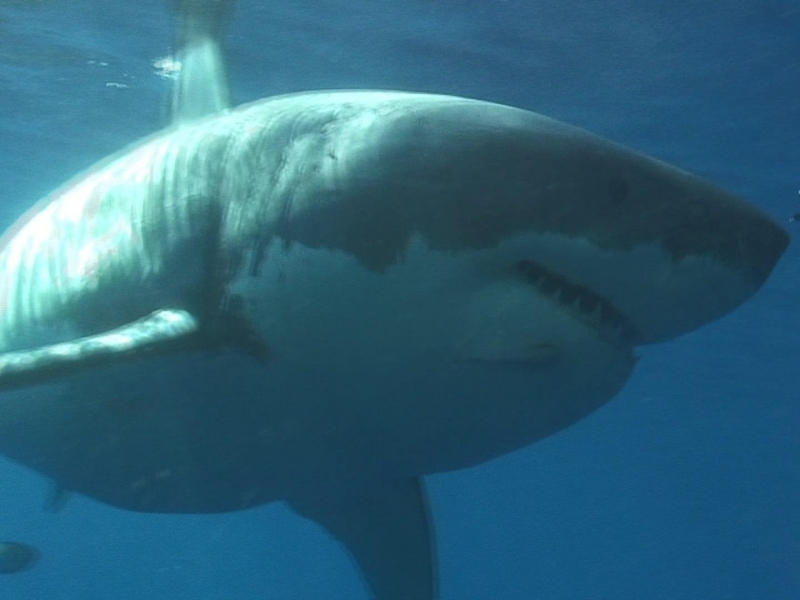 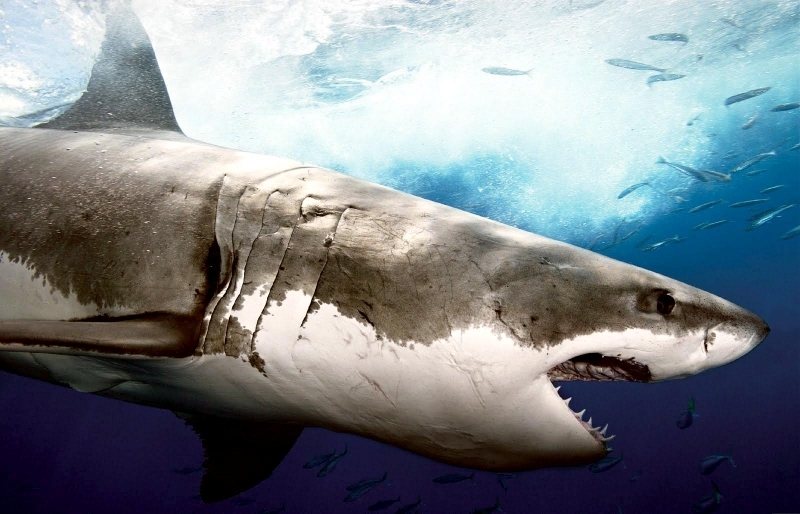 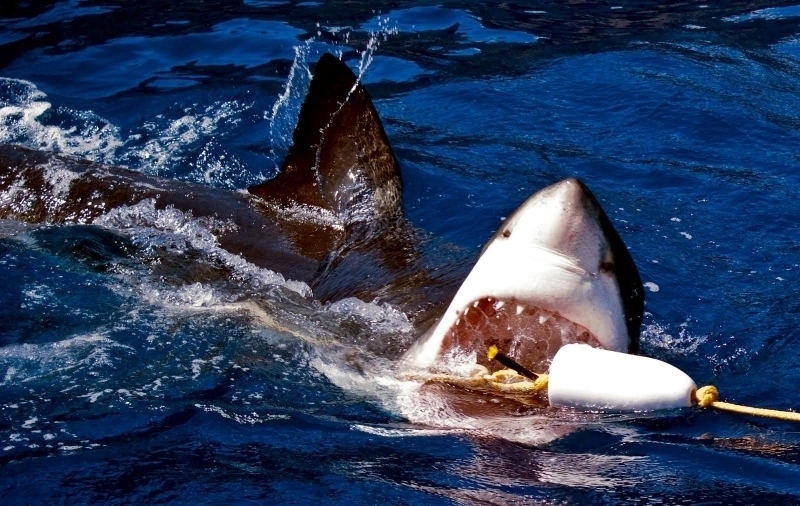 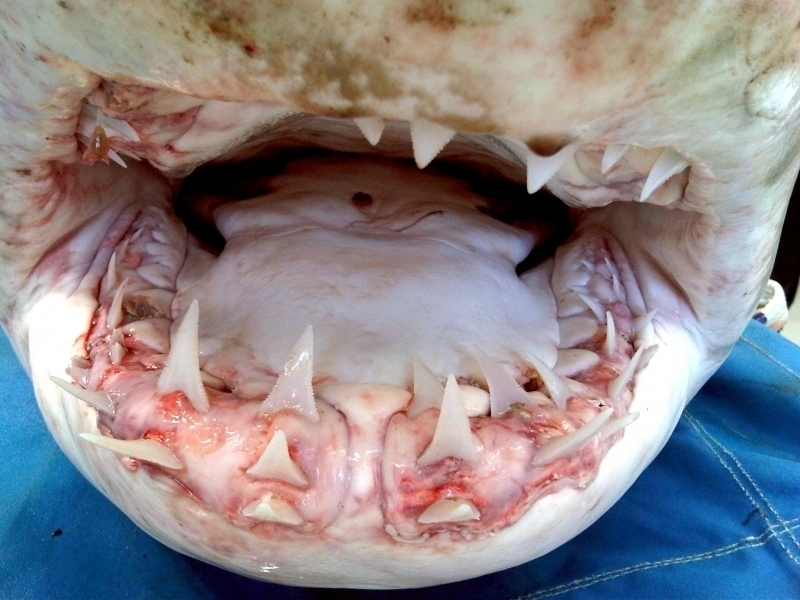 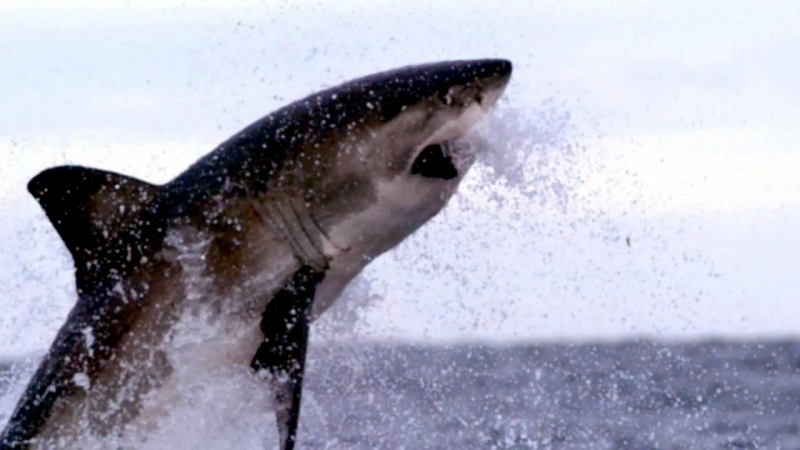 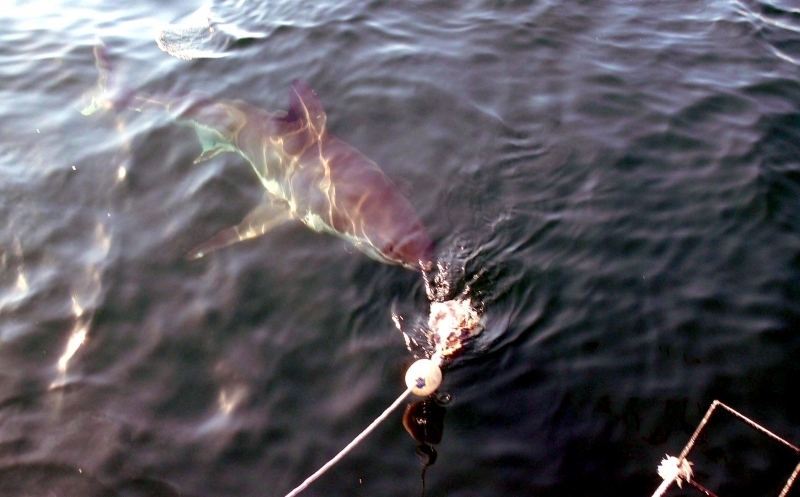 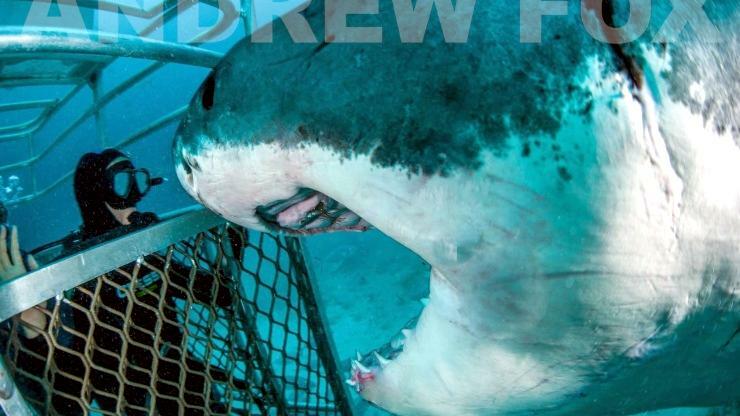 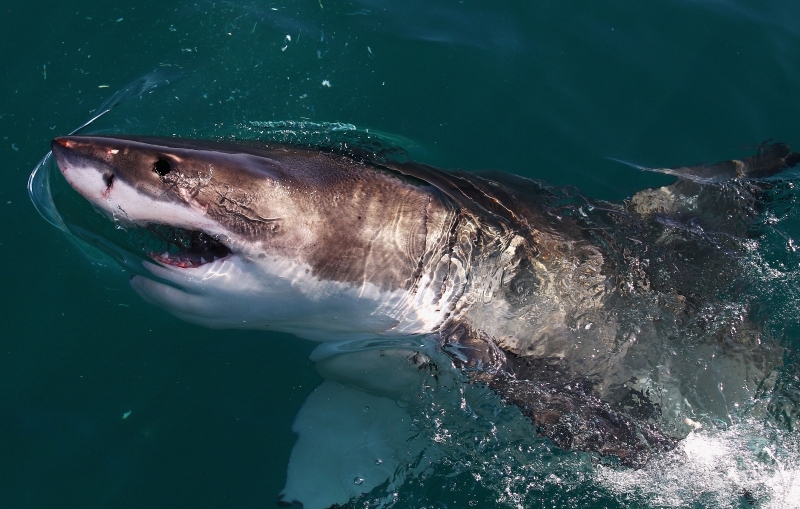 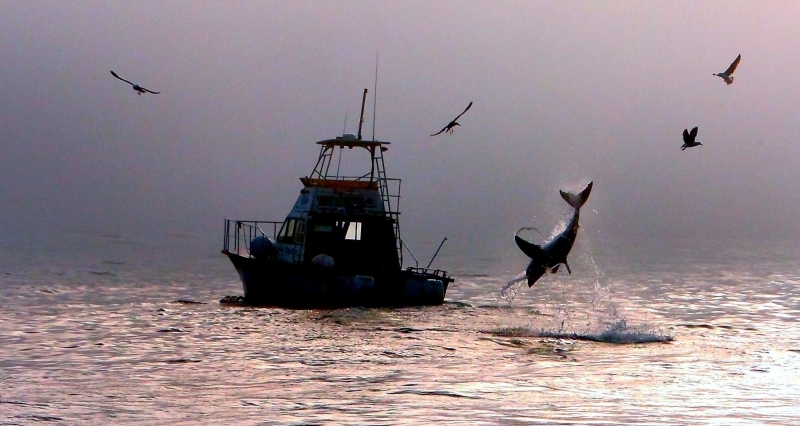 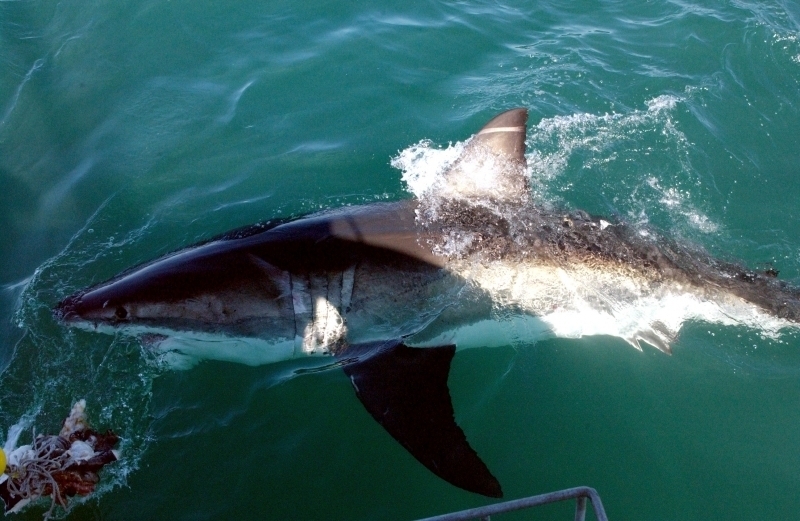 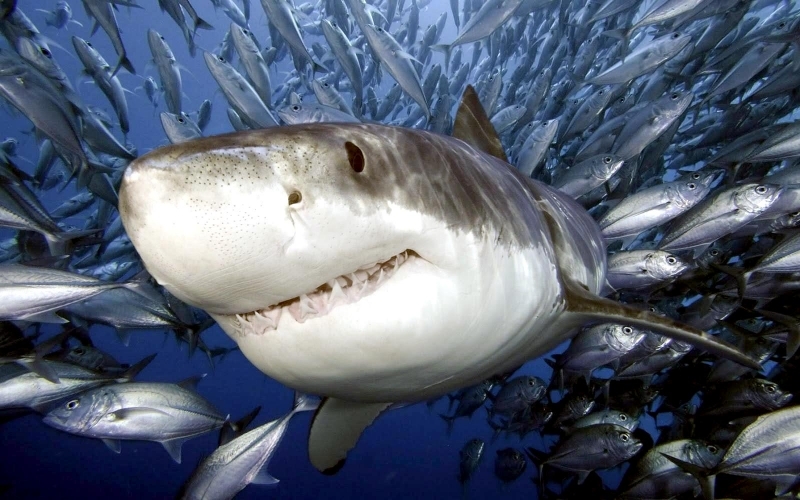 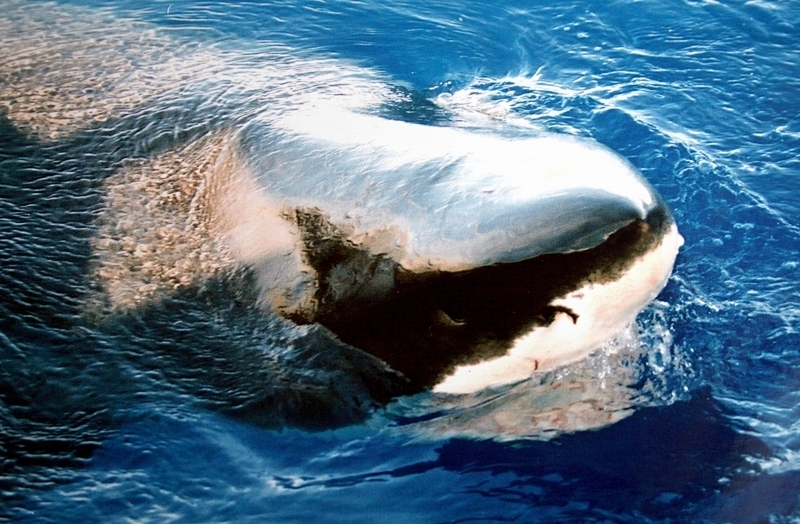 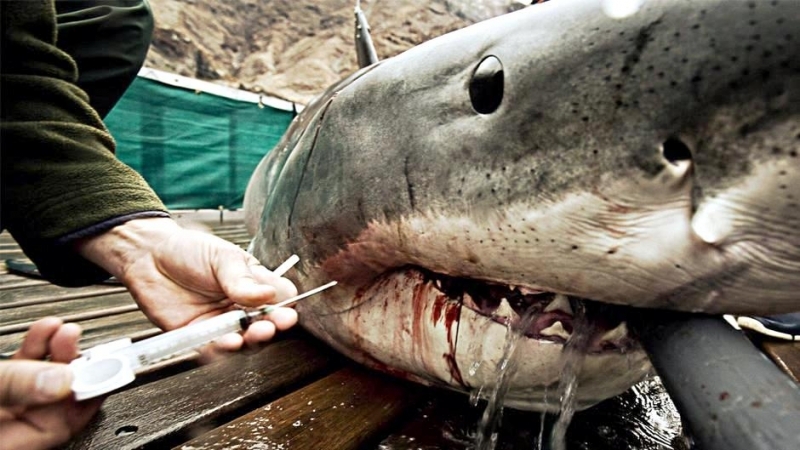 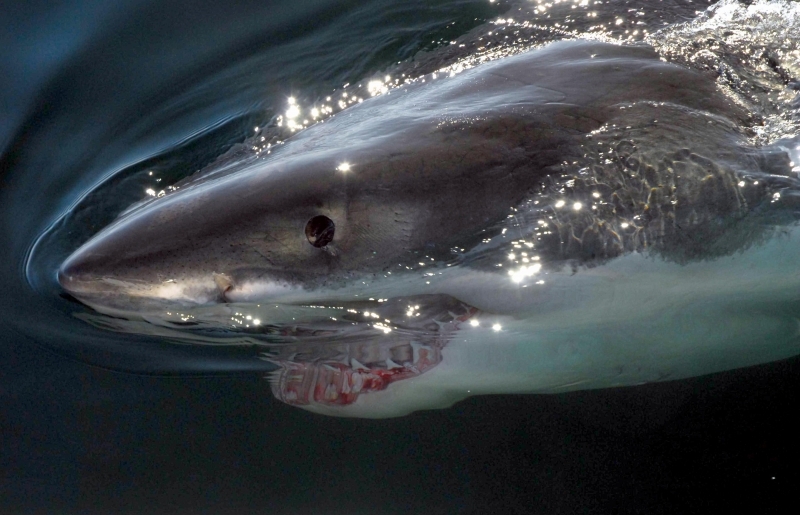 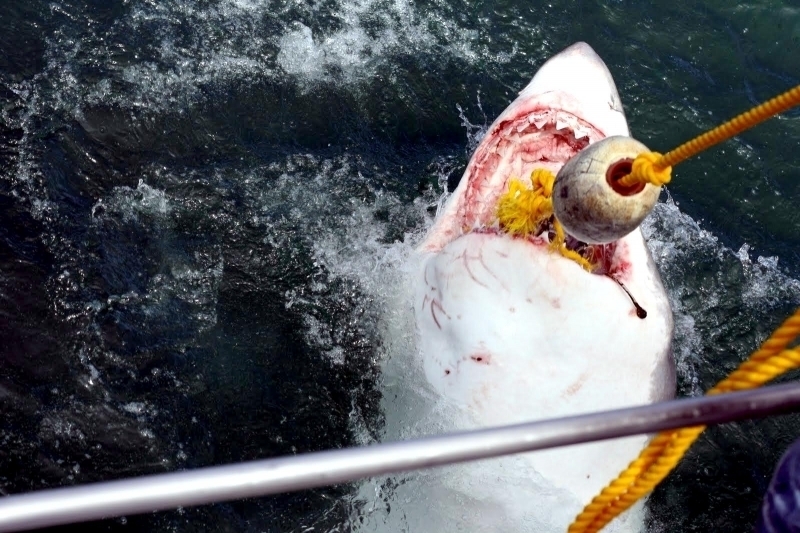 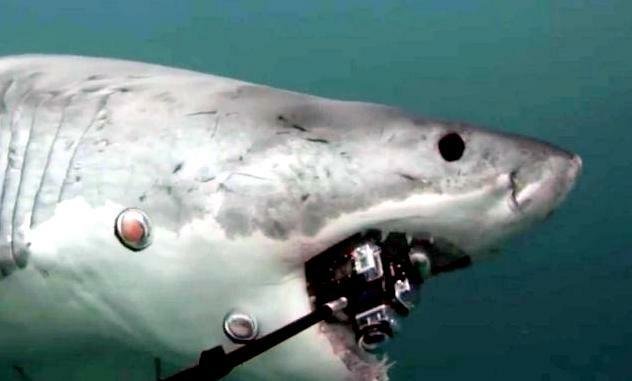 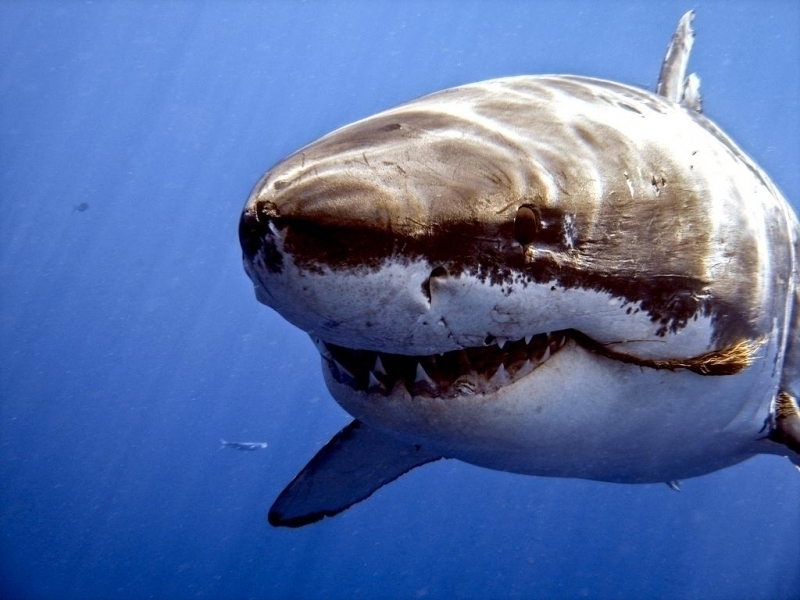 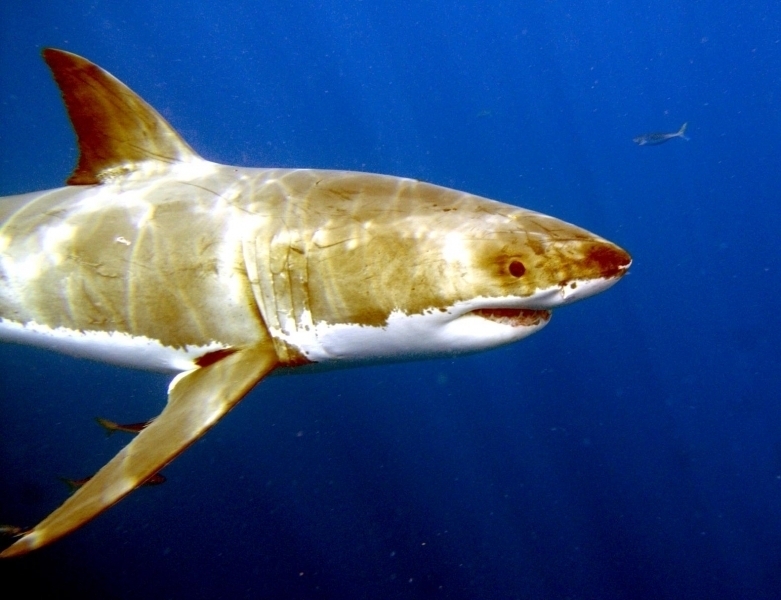 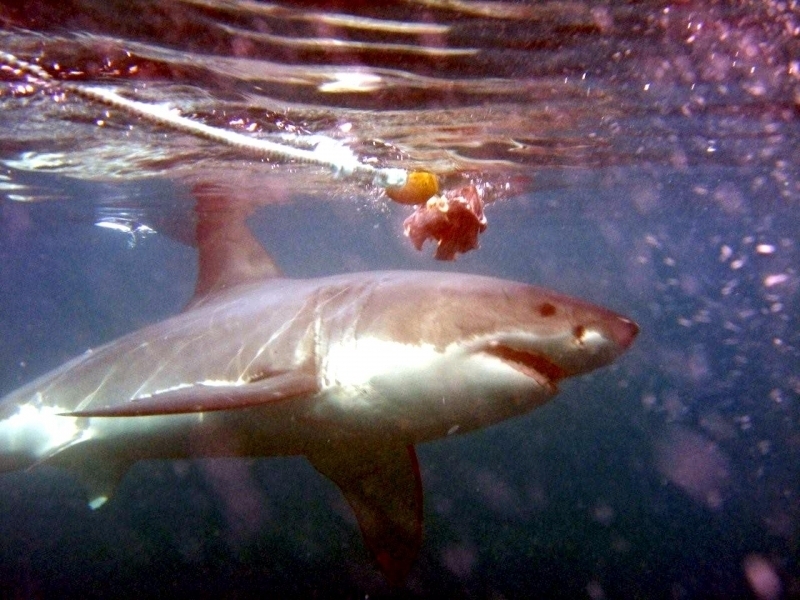 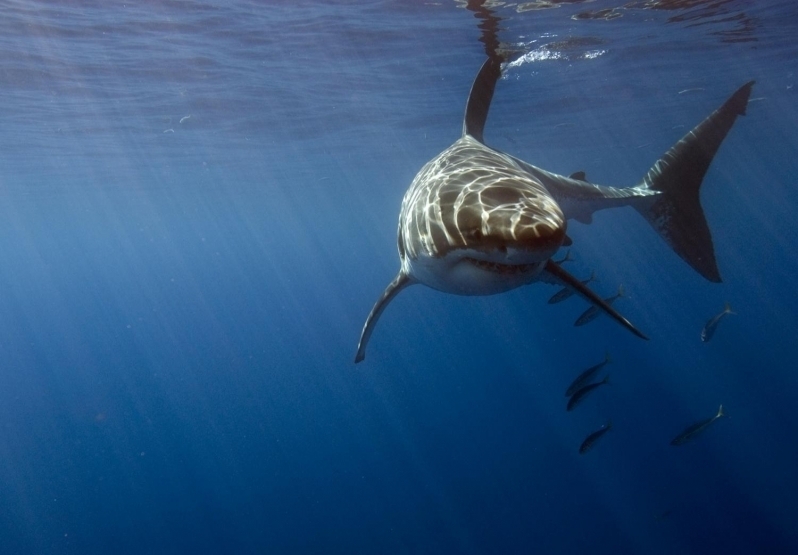 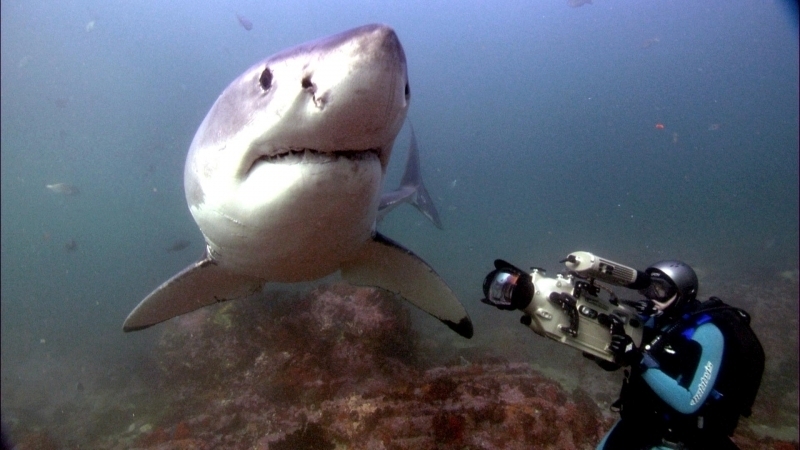 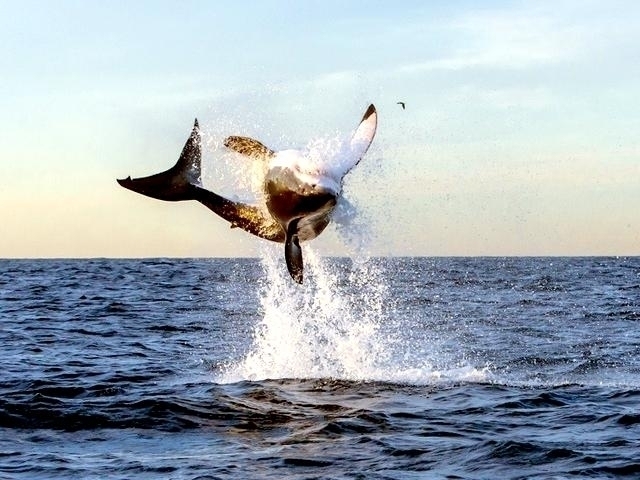 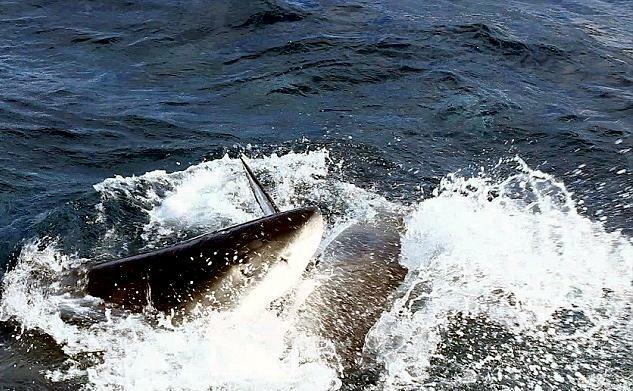 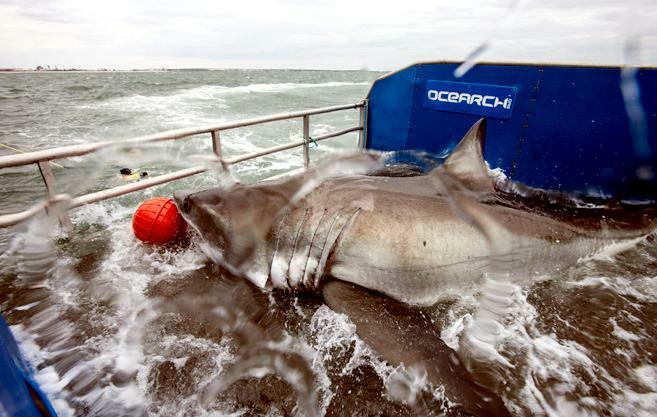 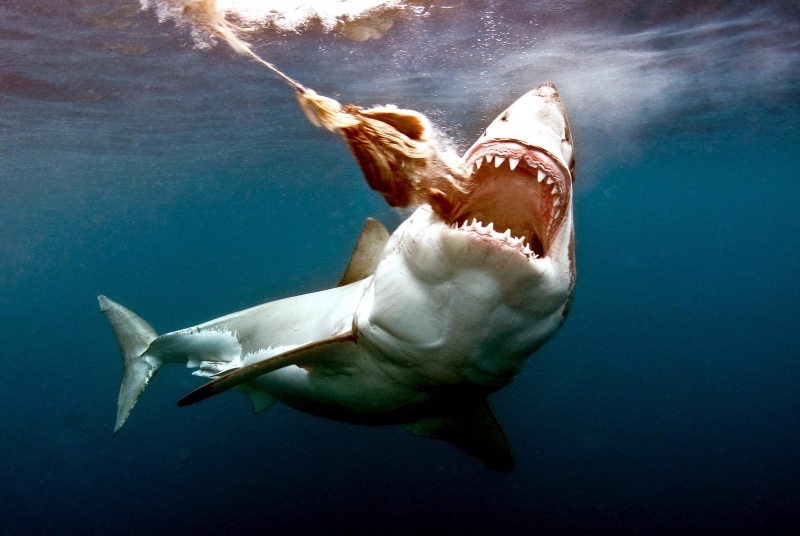 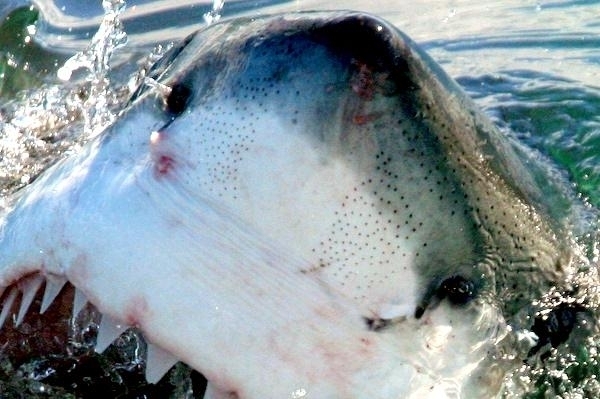 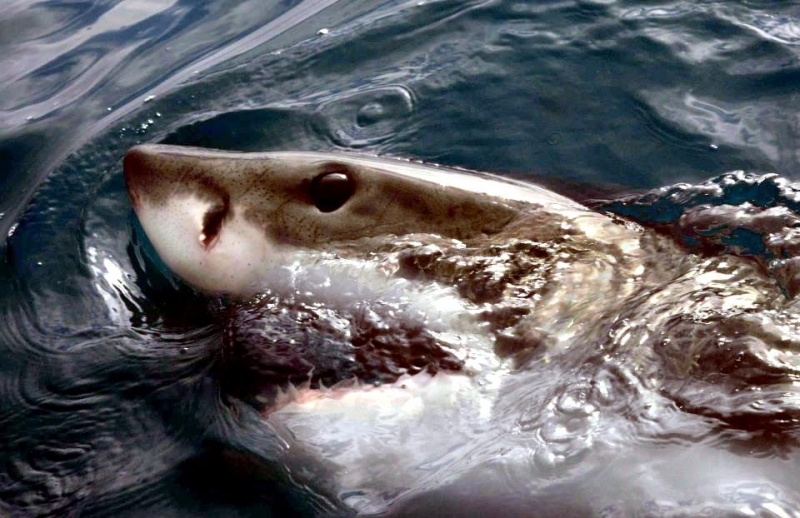 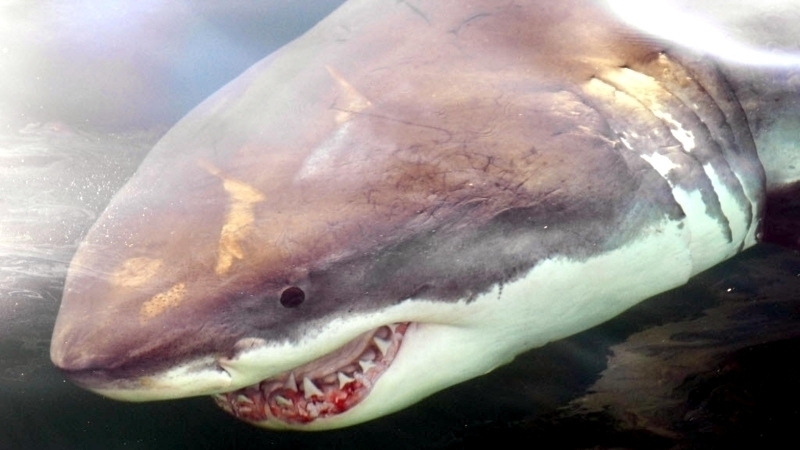 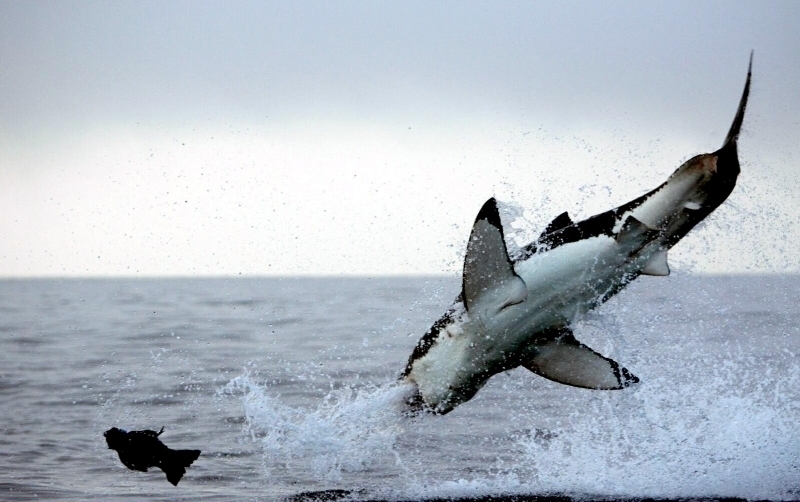 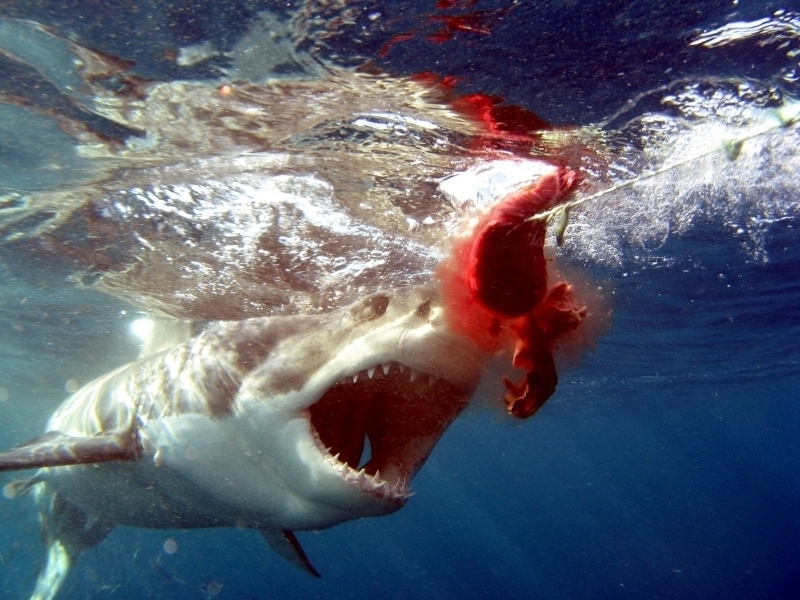 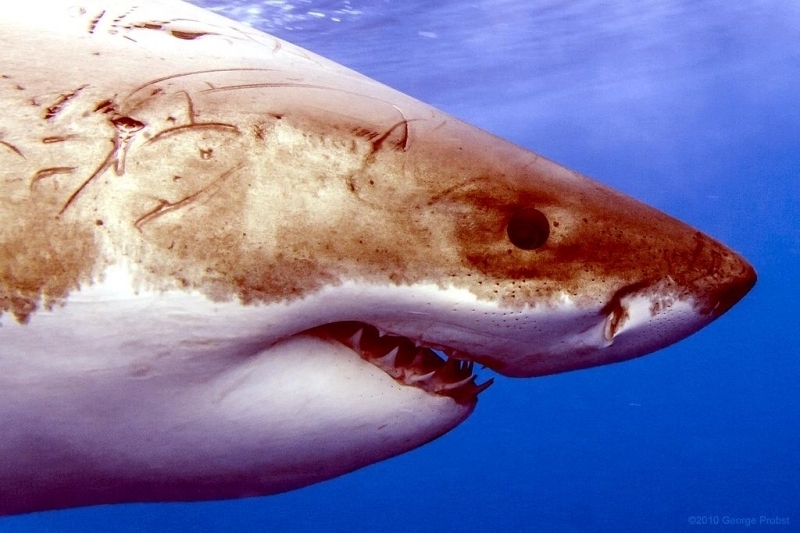 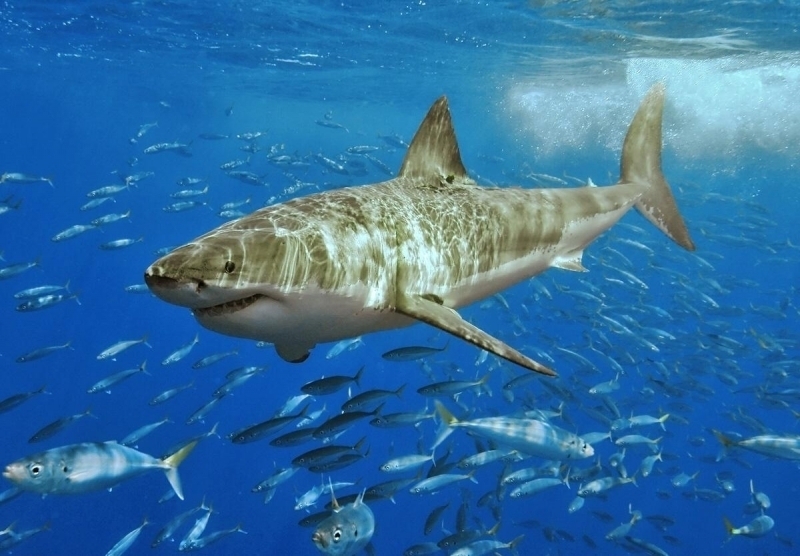 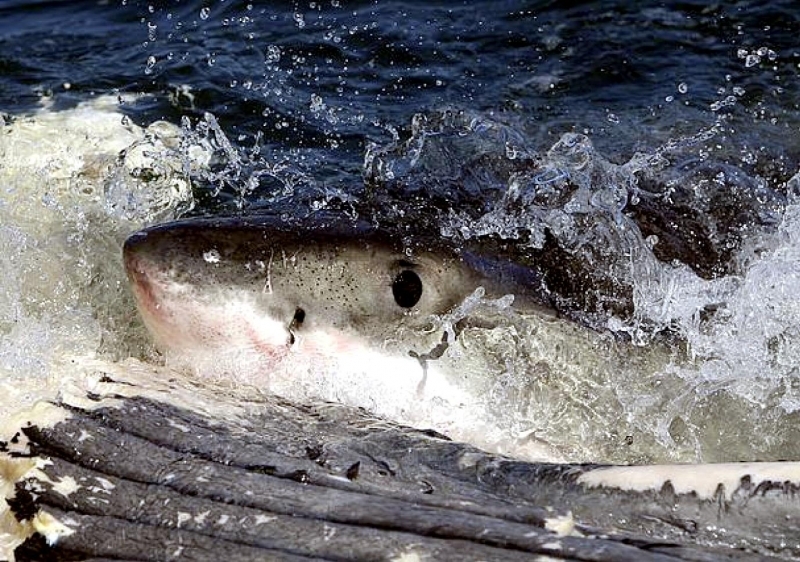 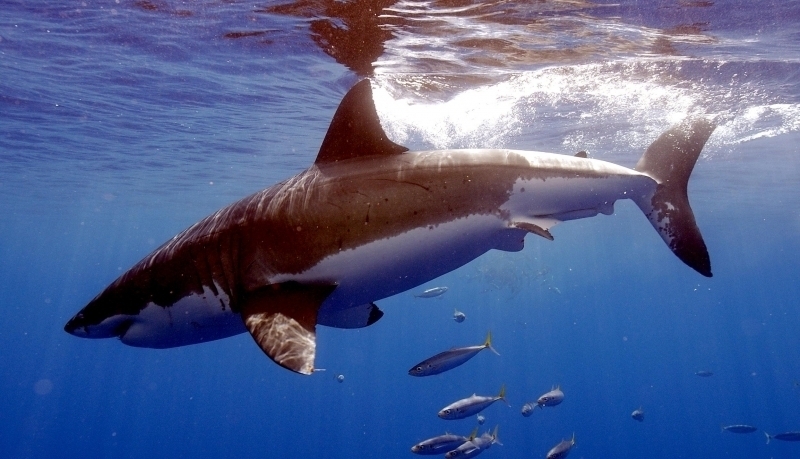 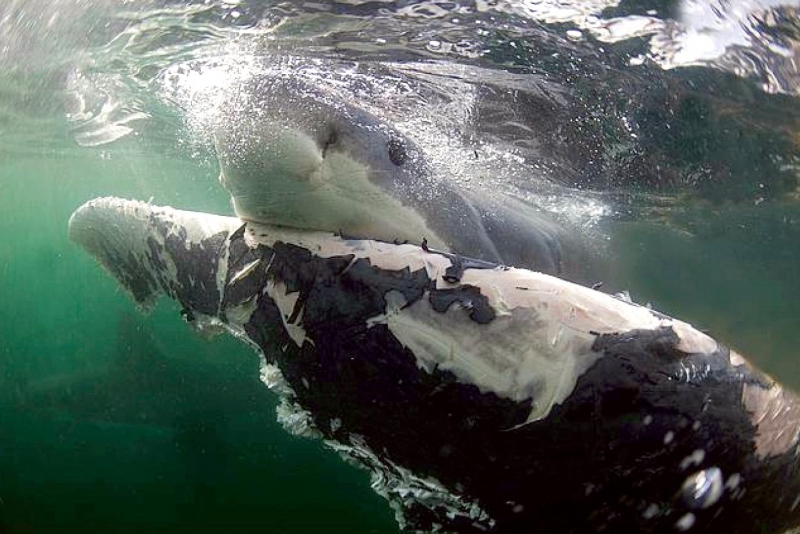 Great Whites use their speed & coloring to help them hunt. 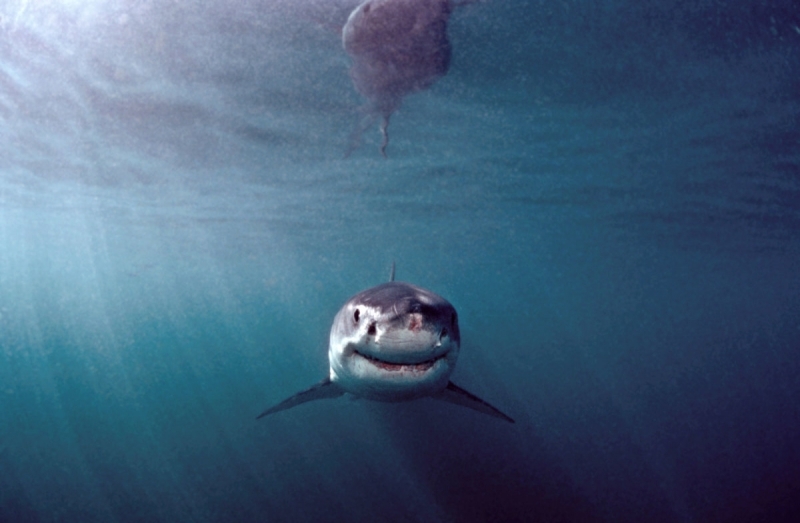 They search for prey at the surface of the ocean while swimming below. 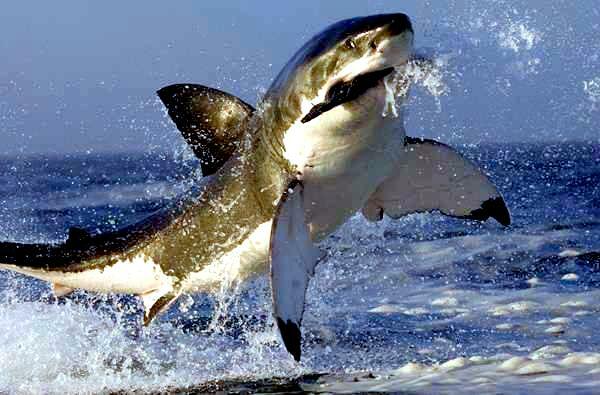 Once they spot a target, they use a burst of speed to bump their prey while simultaneously biting it. 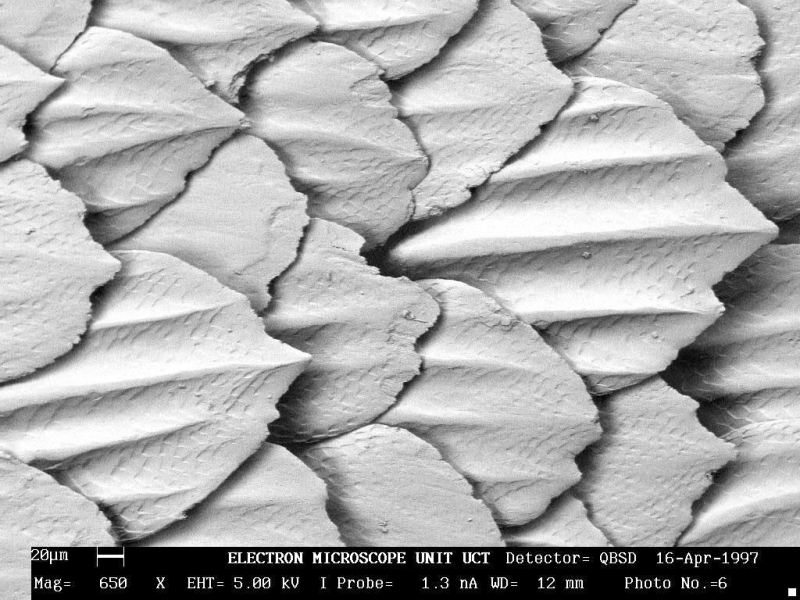 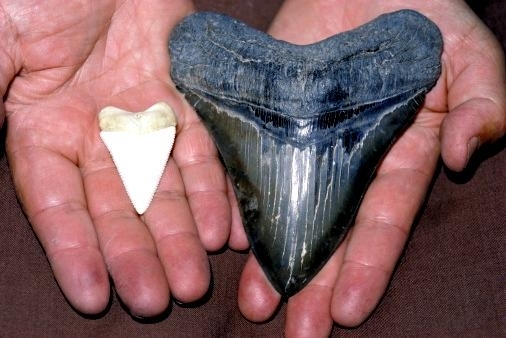 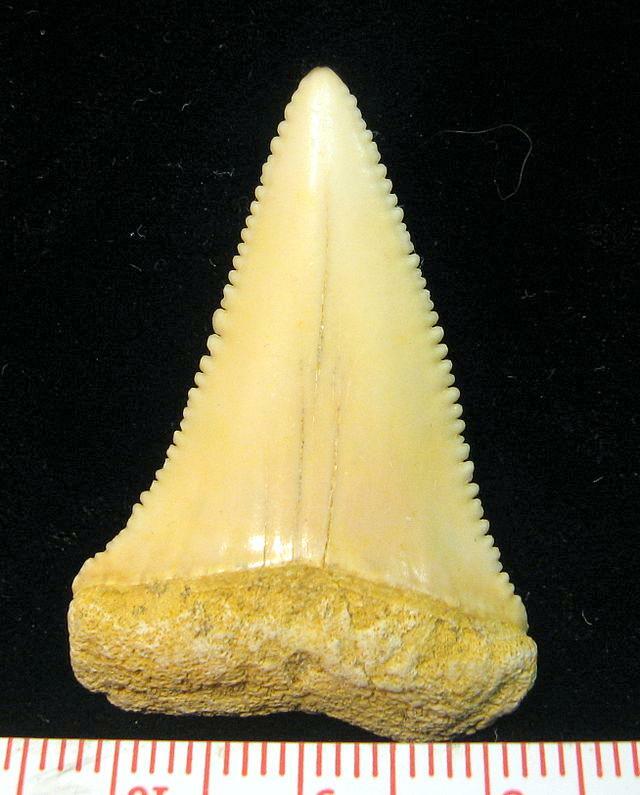 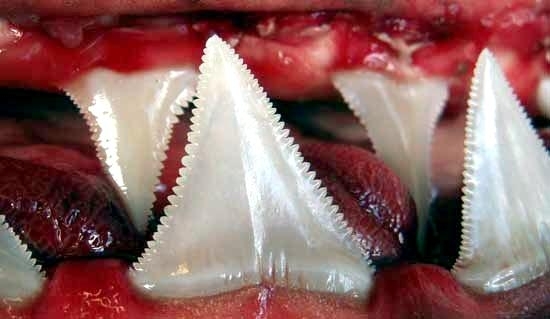 They have several rows of teeth that can number into the thousands. 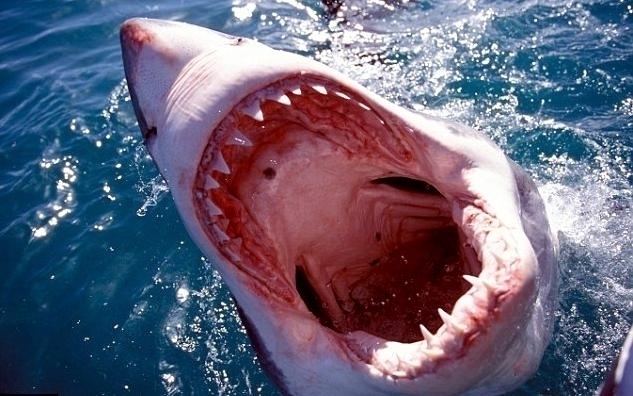 As teeth fall out, they are rapidly replaced by those in the row behind them. 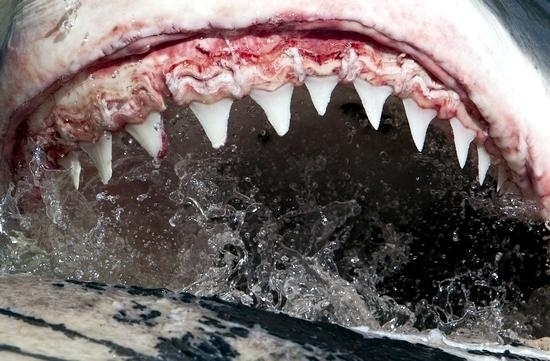 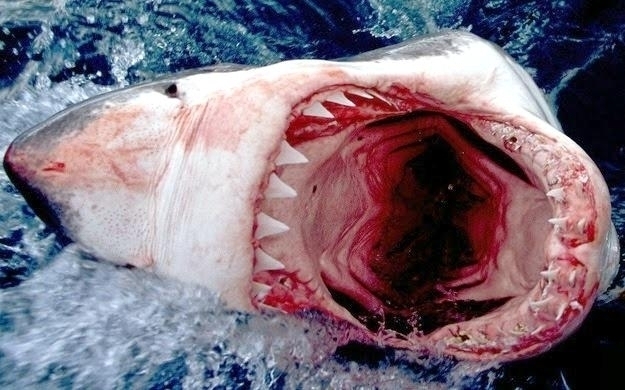 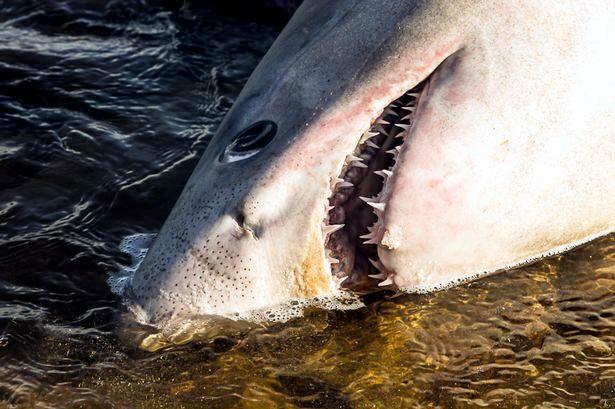 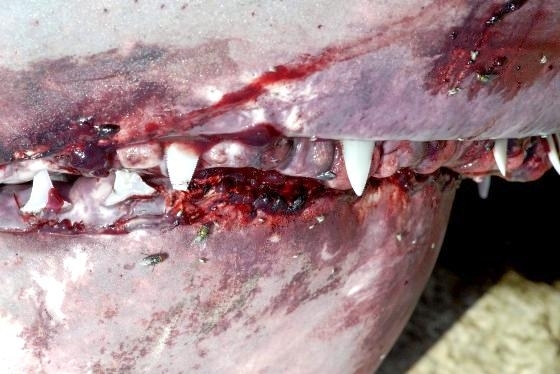 These sharp, serrated teeth can be devastating. 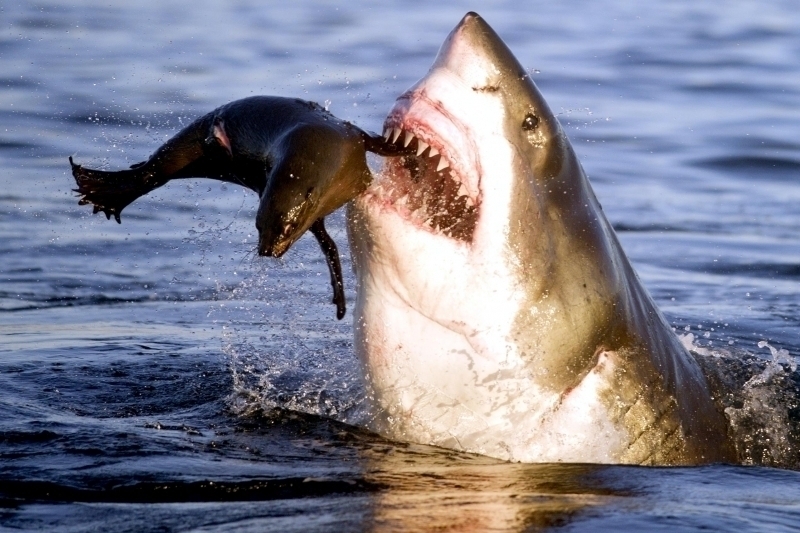 A single, large bite can be fatal. 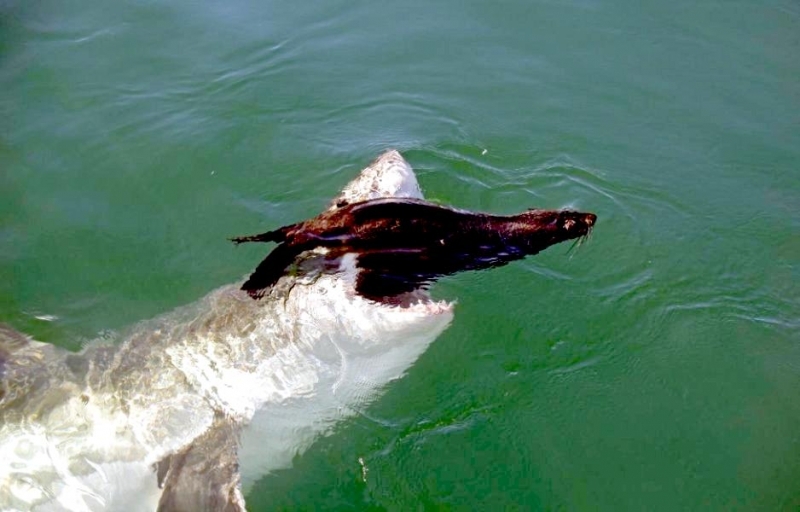 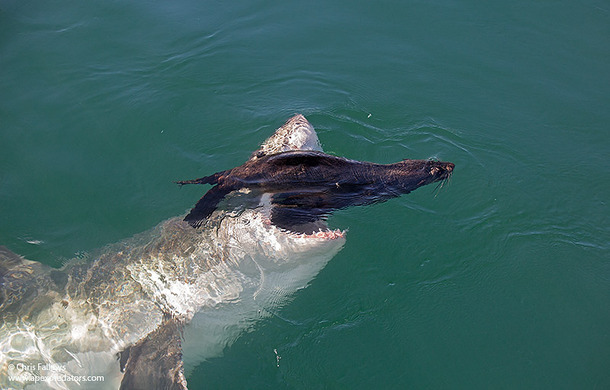 When Great White Sharks are young, they feed on smaller prey like fish and rays. 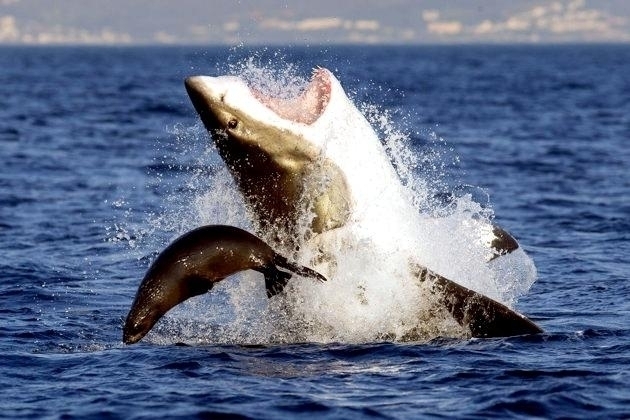 As they grow larger, they feed more exclusively on marine mammals such as sea lions, seals and small whales. 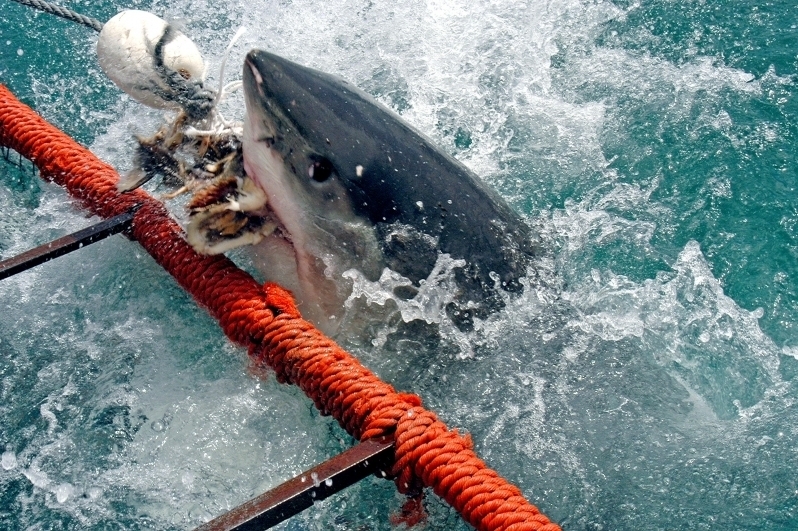 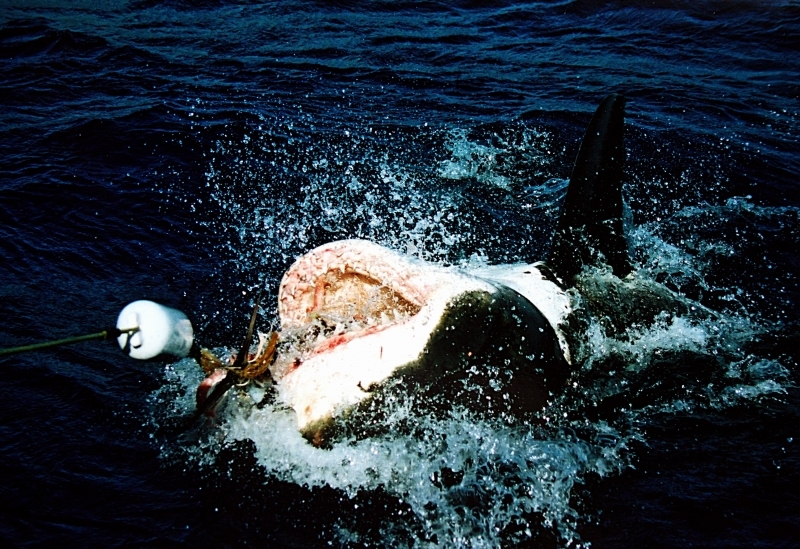 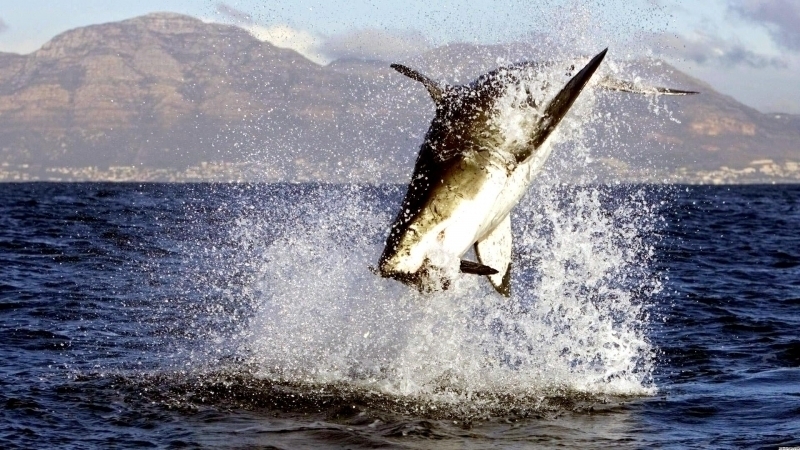 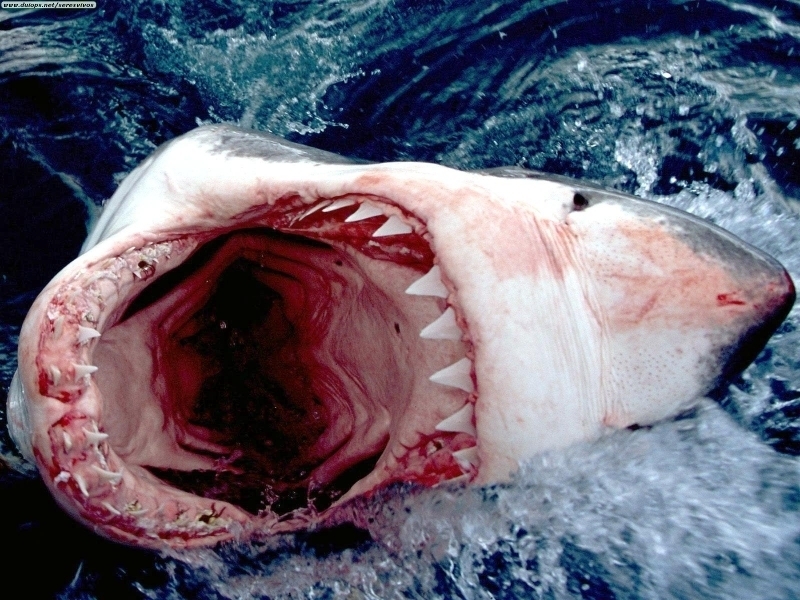 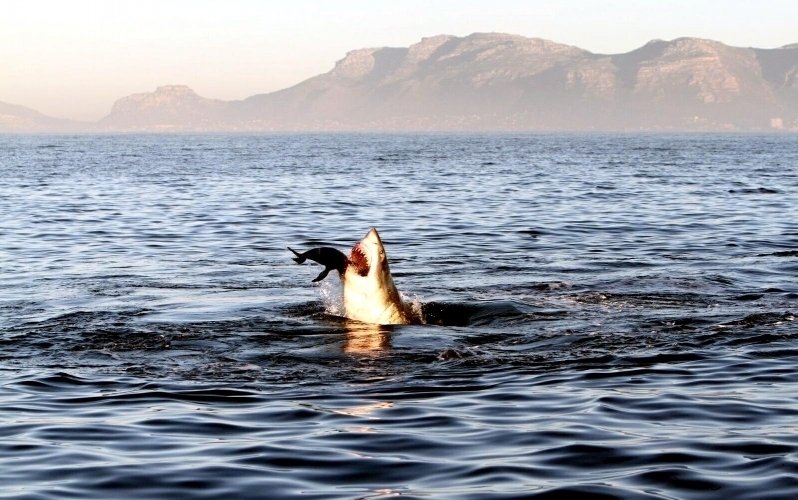 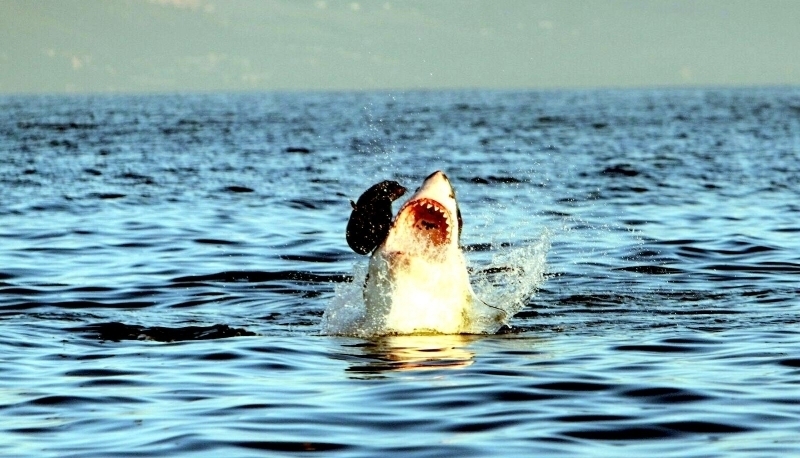 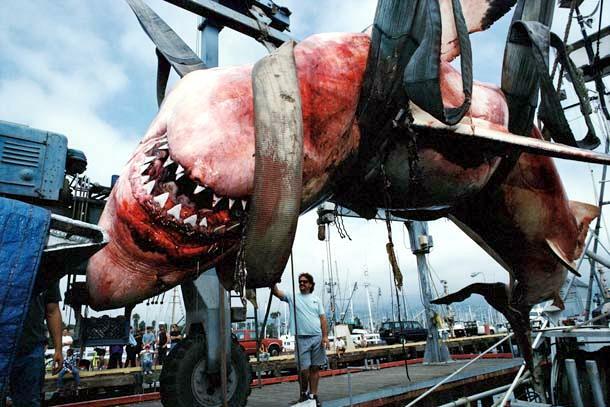 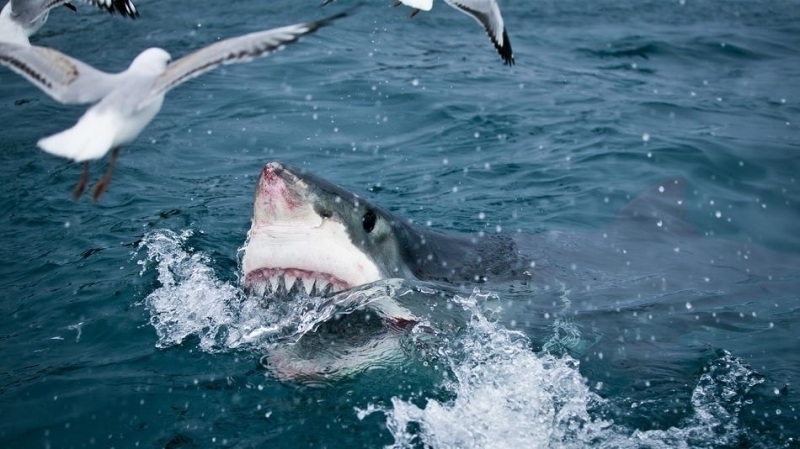 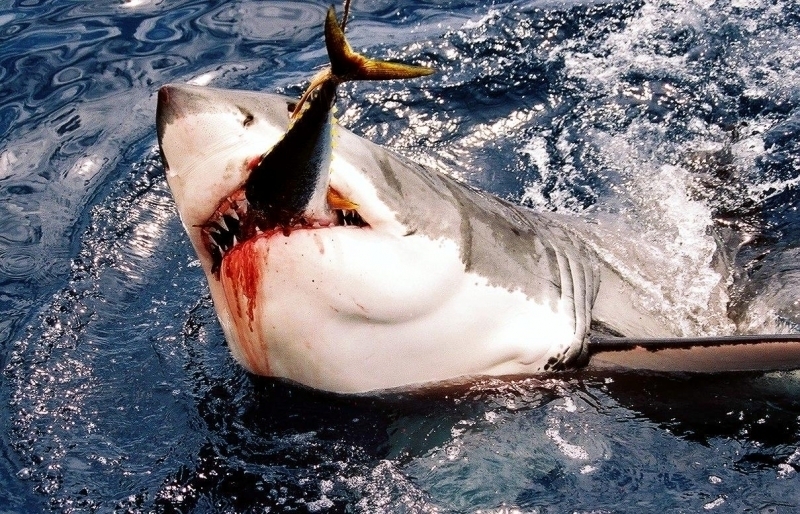 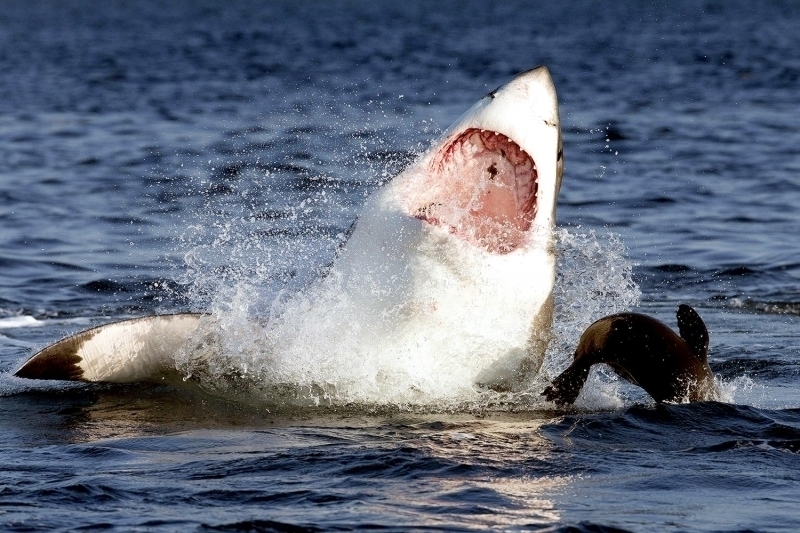 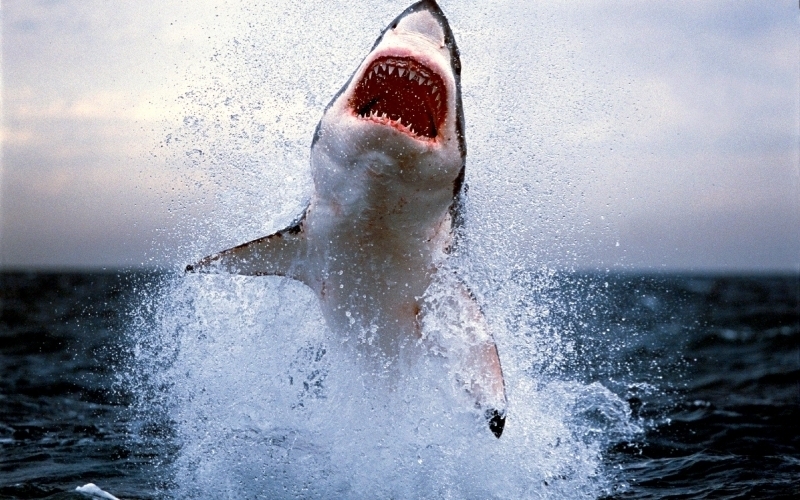 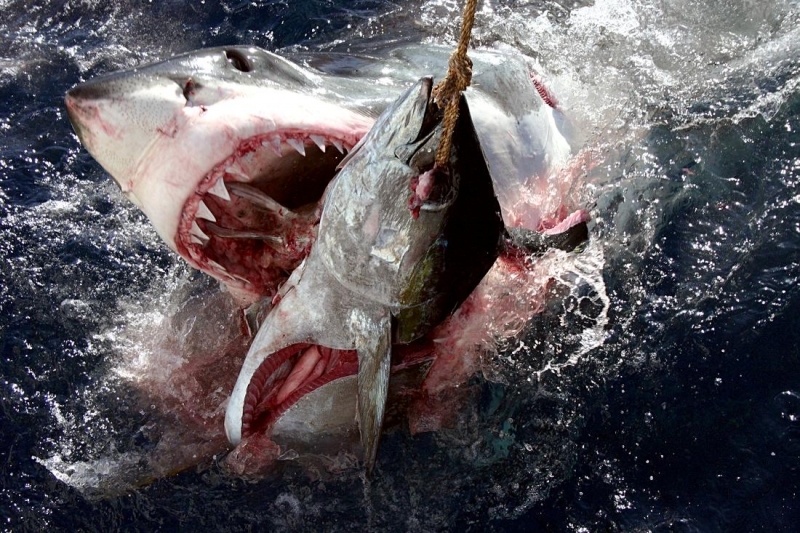 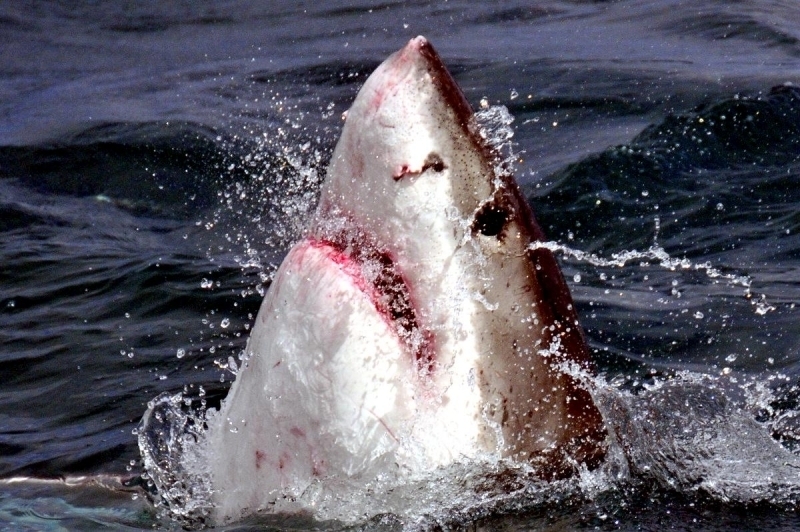 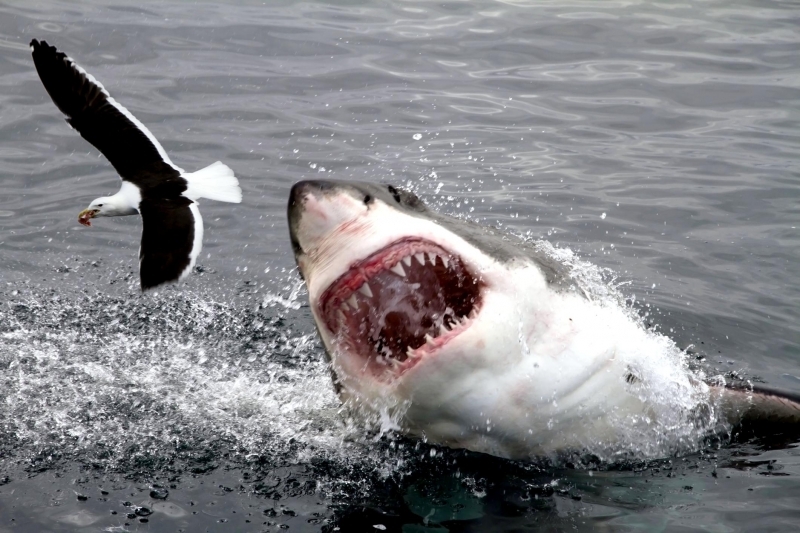 The Great White is at the top of the food chain and has few threats in the ocean. 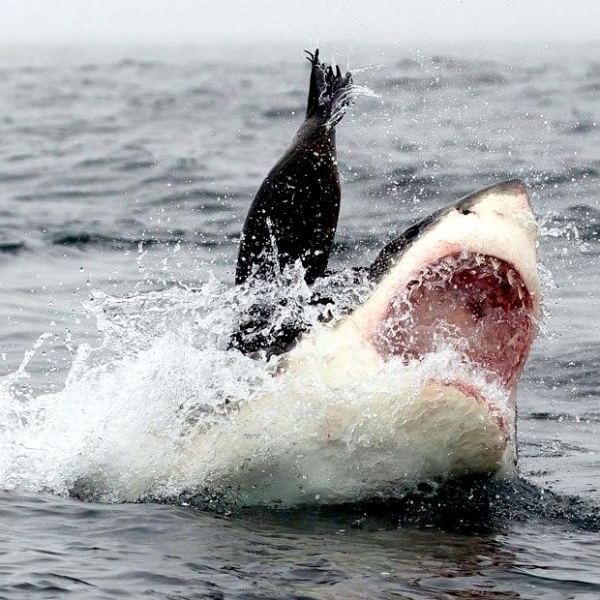 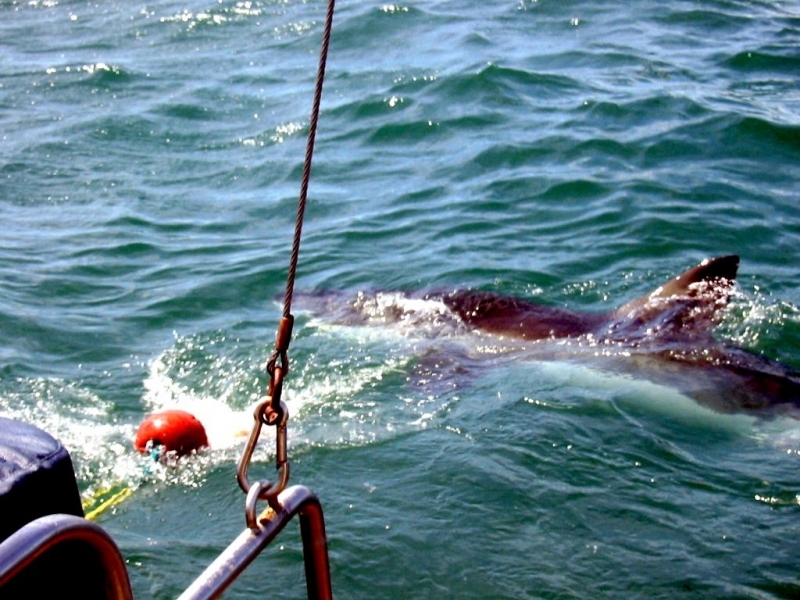 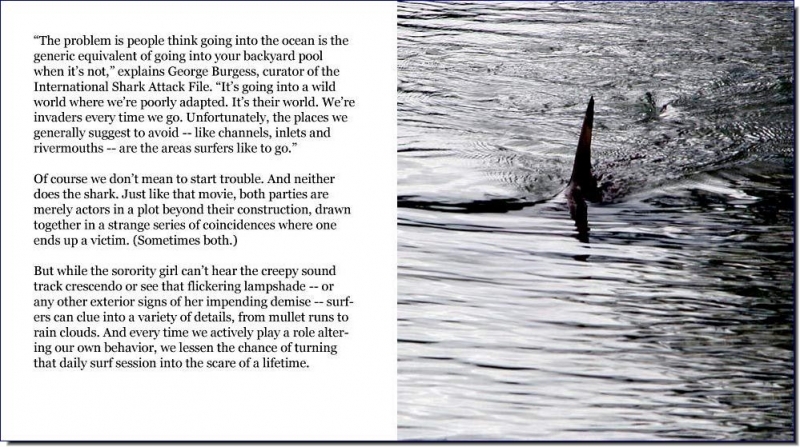 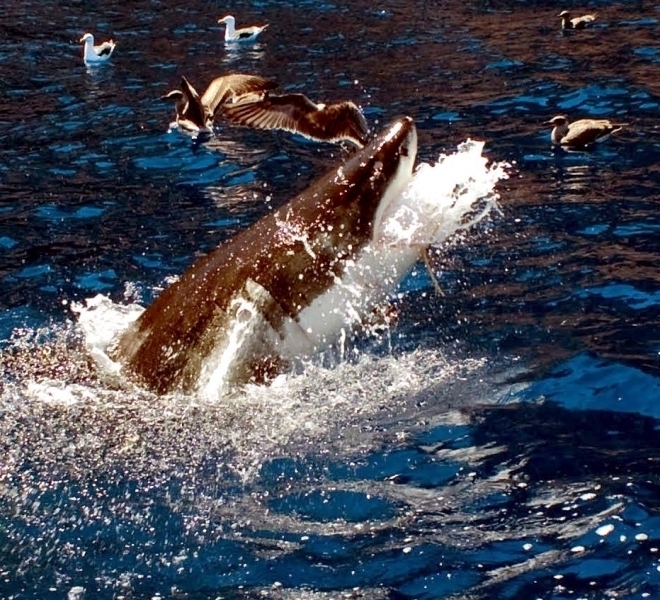 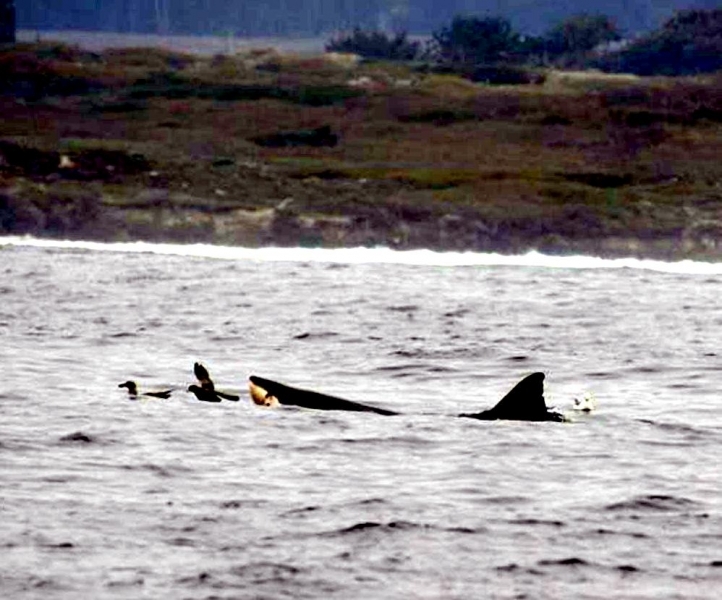 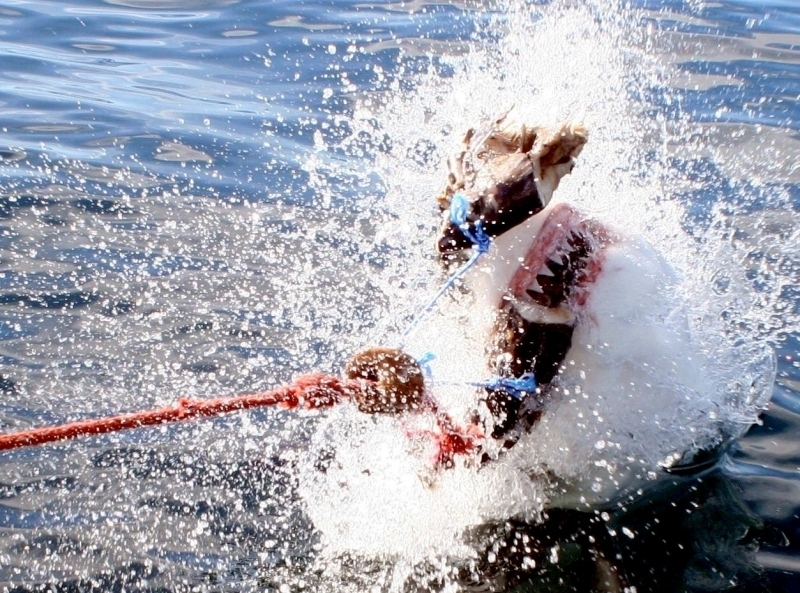 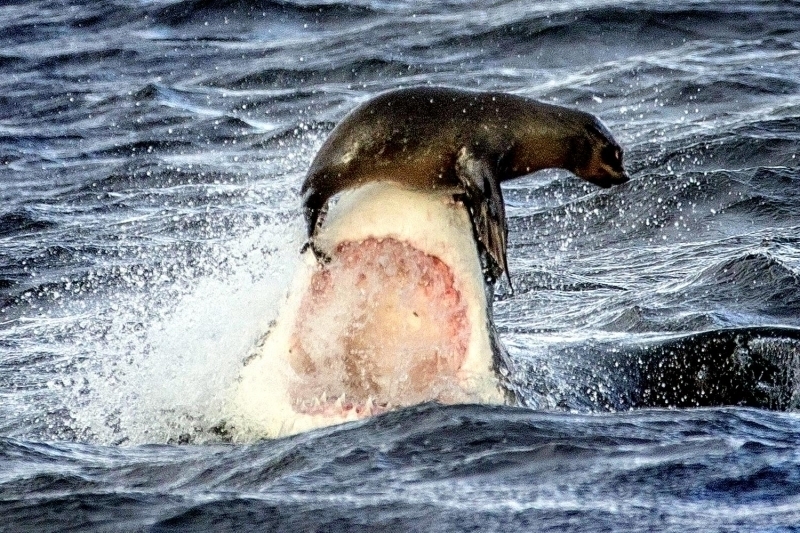 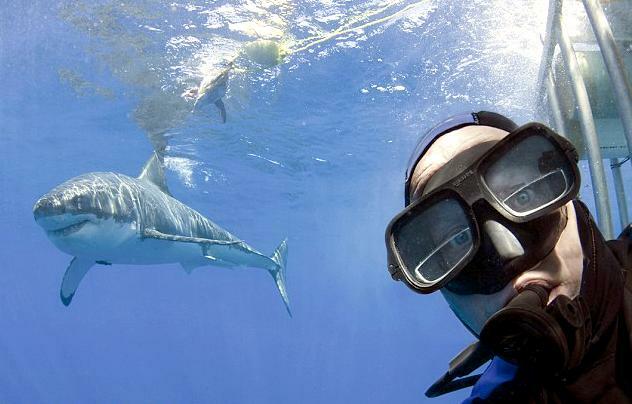 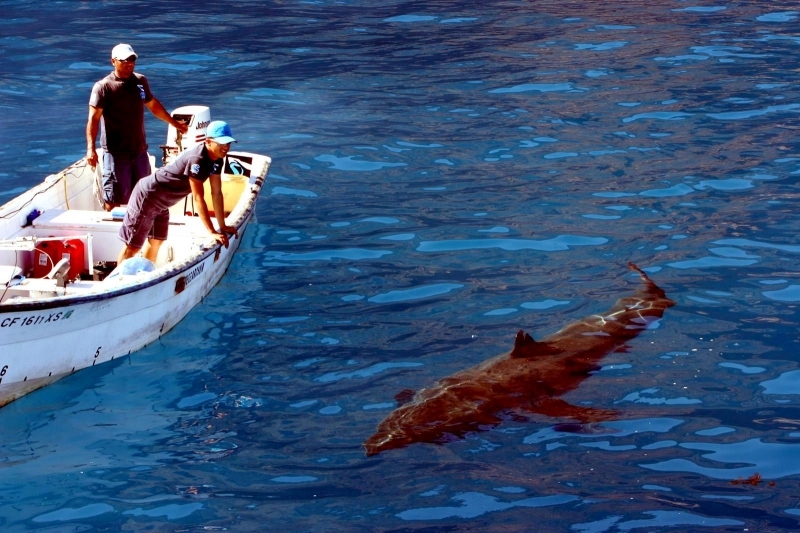 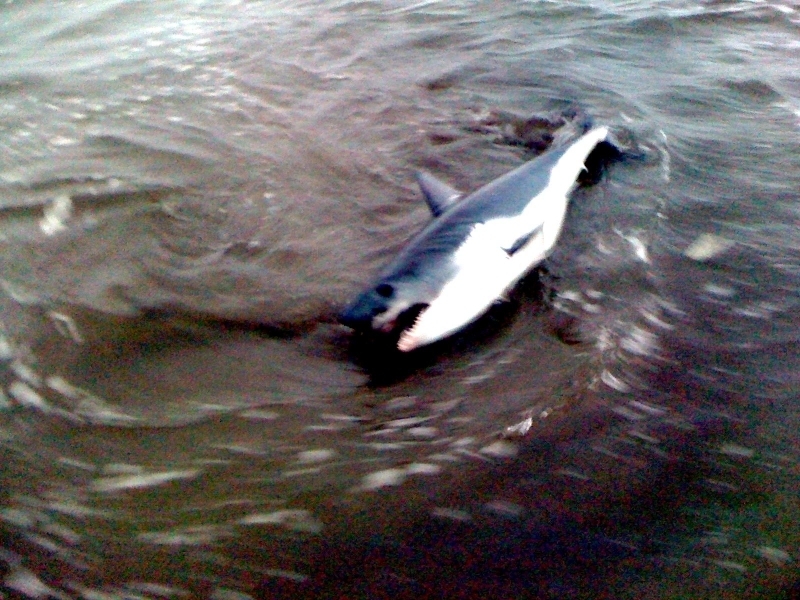 Only Killer Whales and a larger Great White can pose a risk. 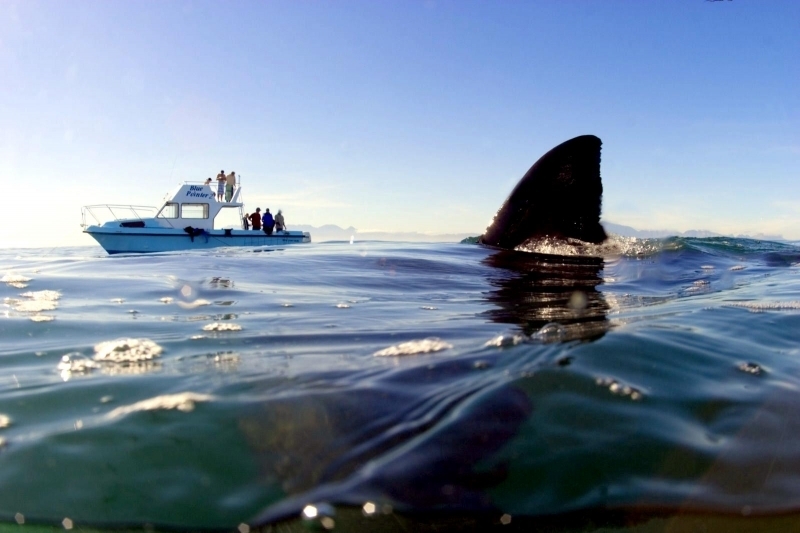 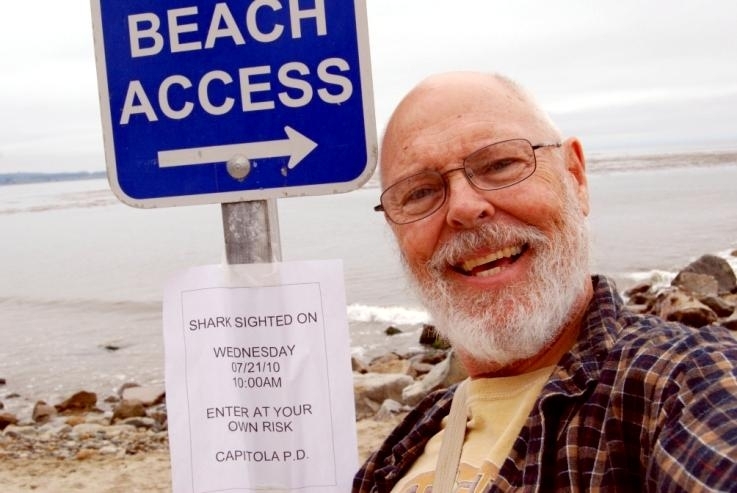 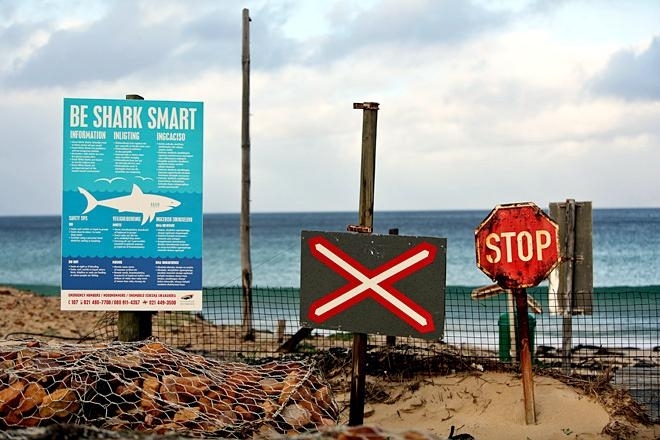 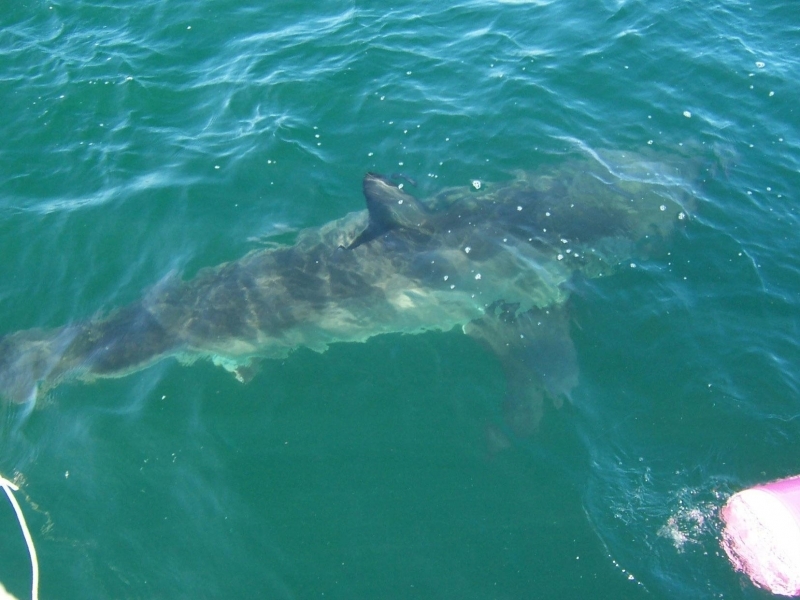 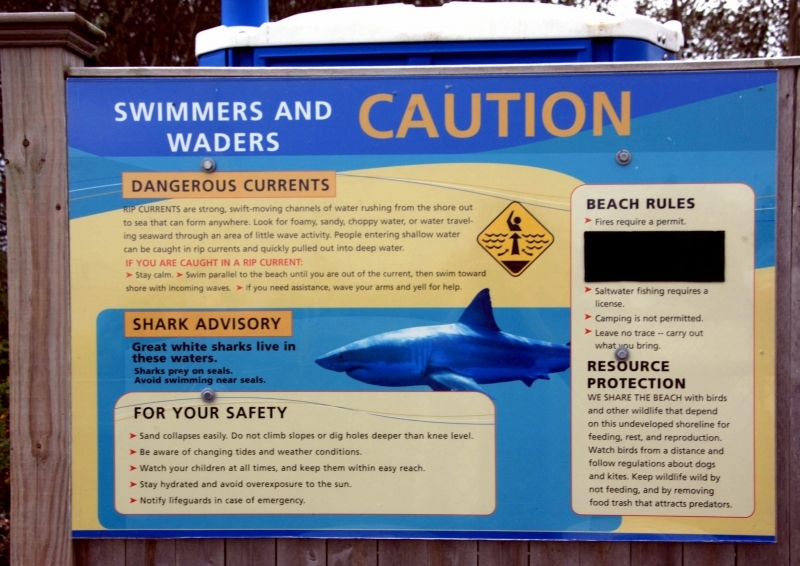 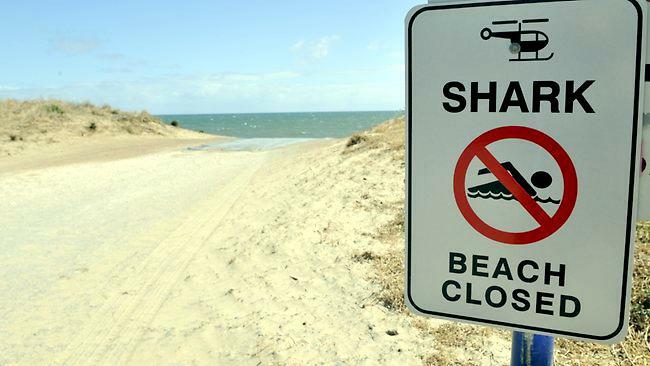 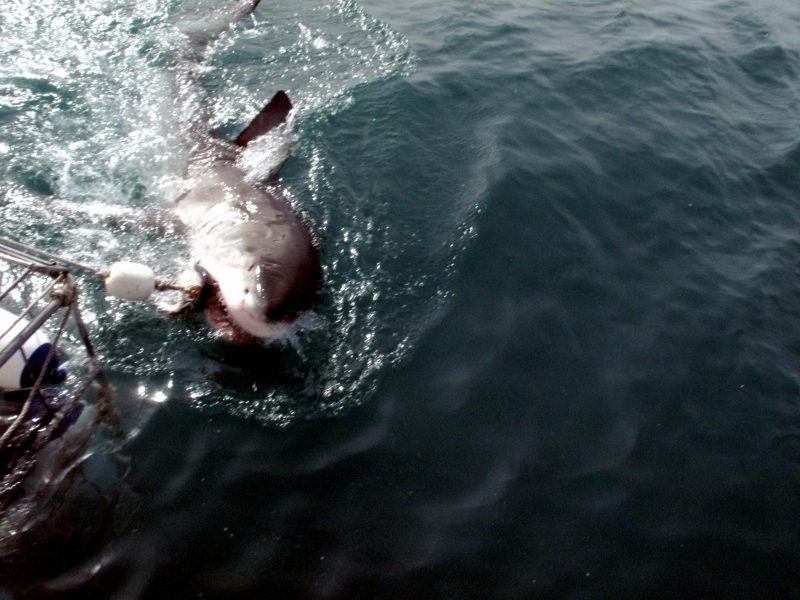 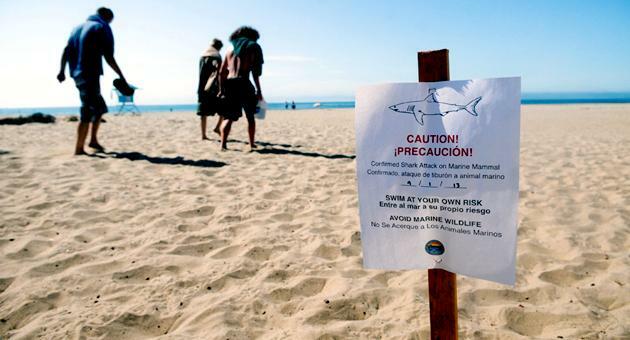 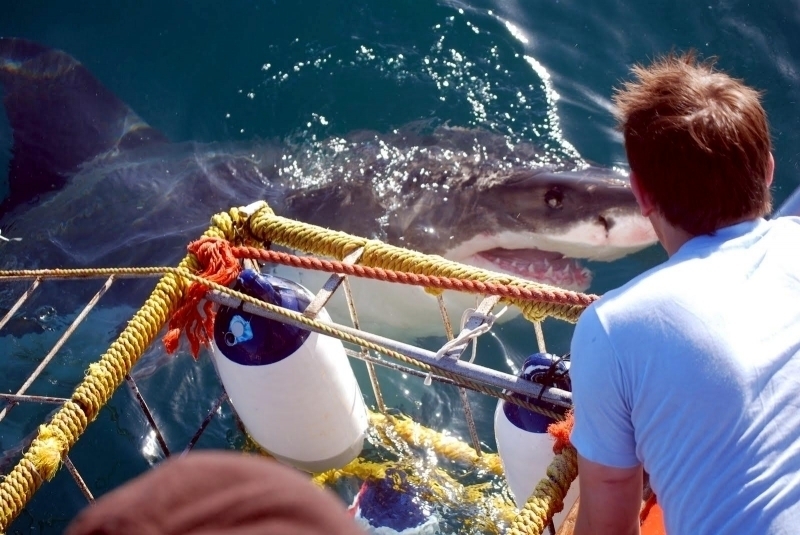 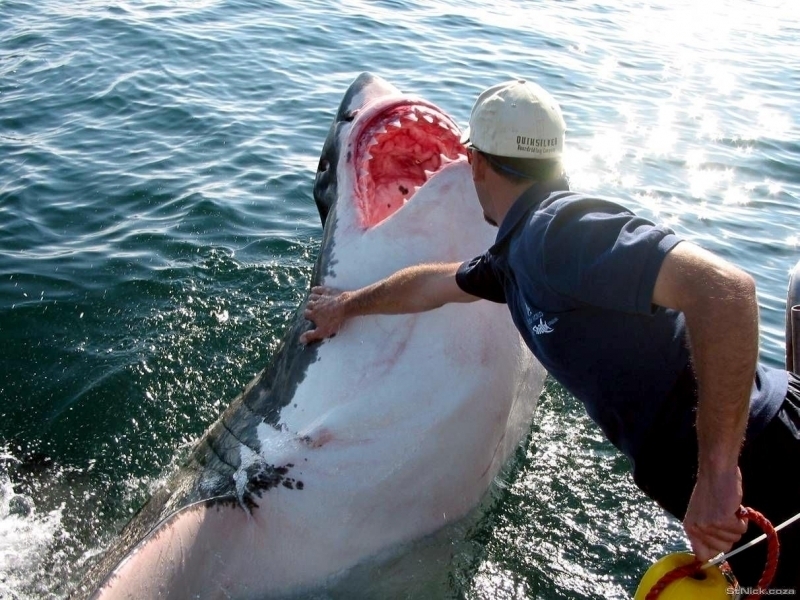 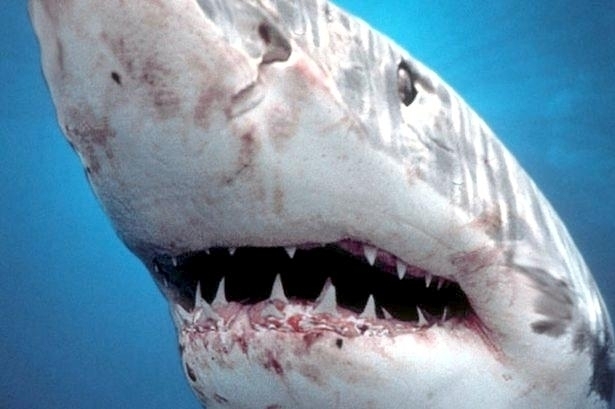 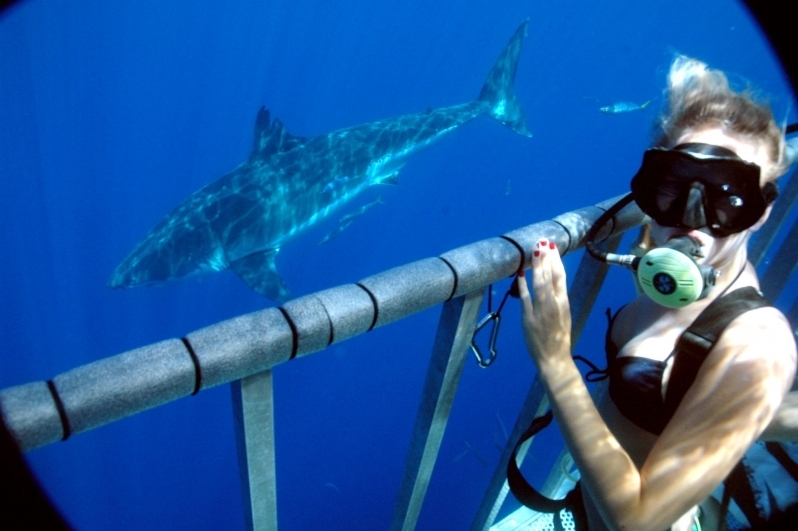 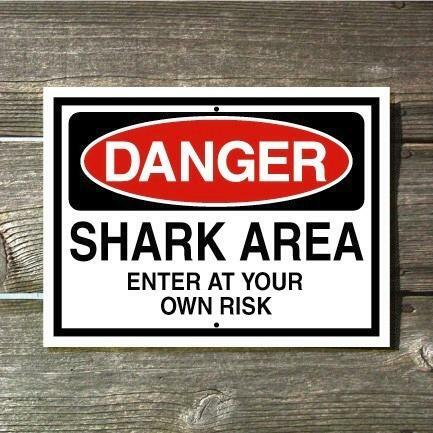 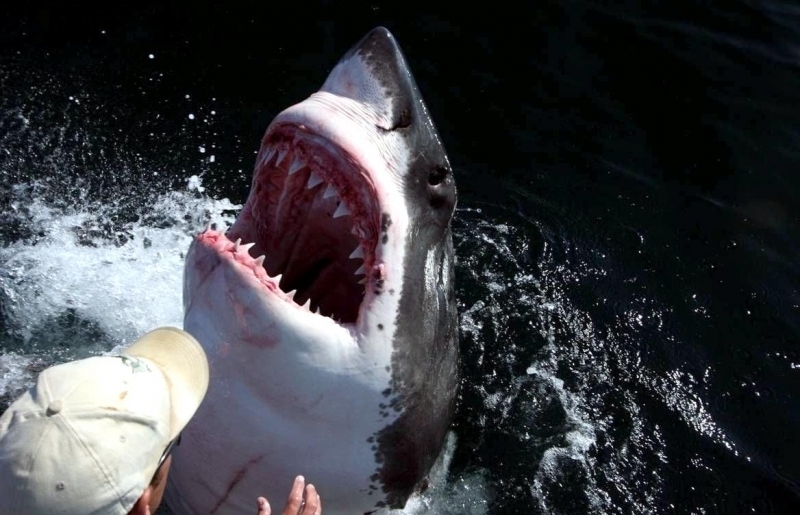 The only other risk to the Great White Shark is human interaction. 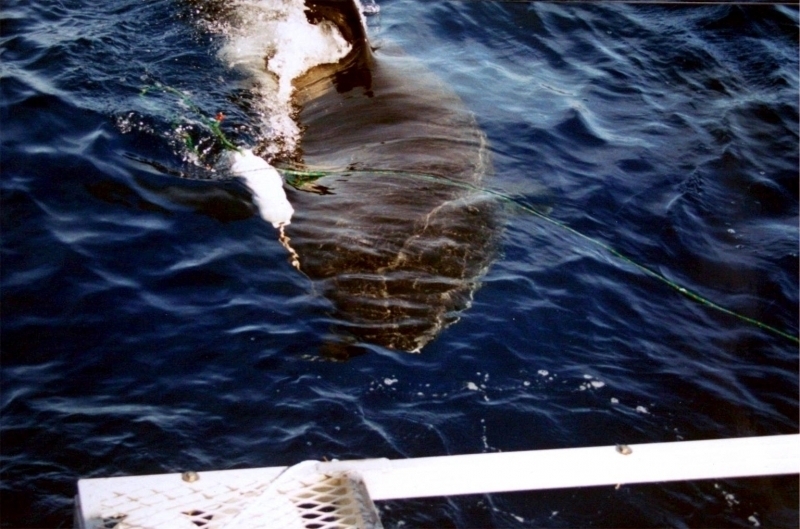 They are sometimes caught by accident in fishing nets or intentionally sought out by sport fisherman. 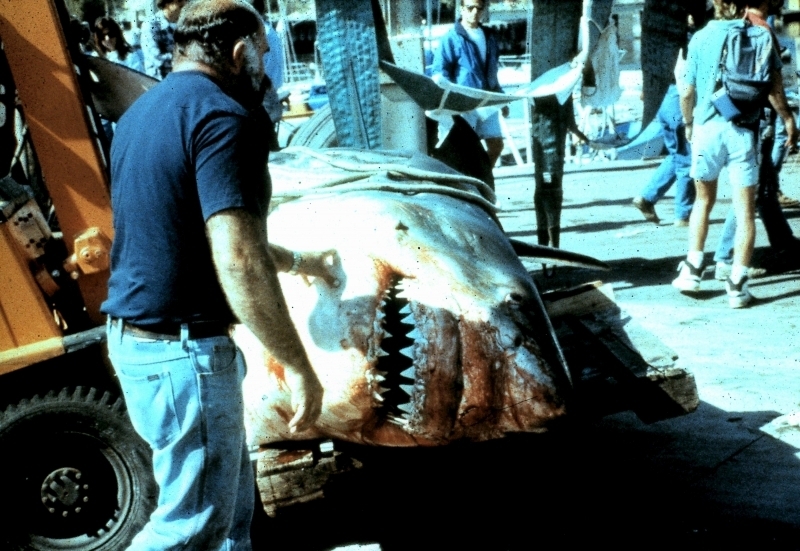 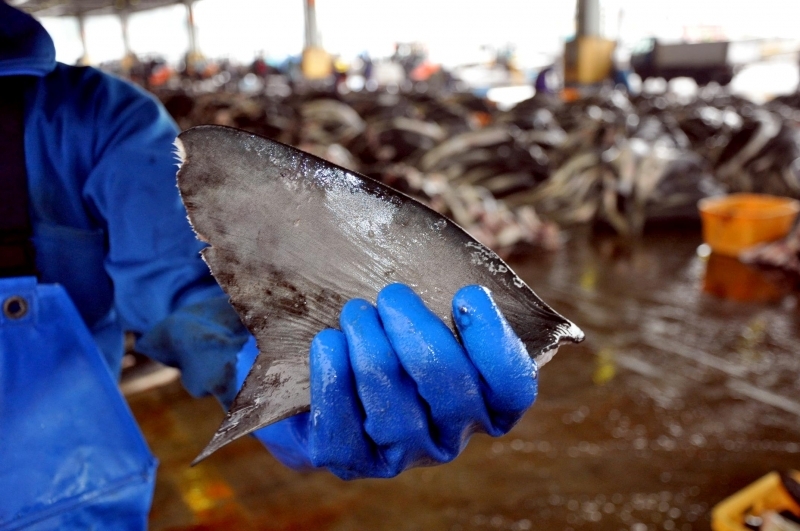 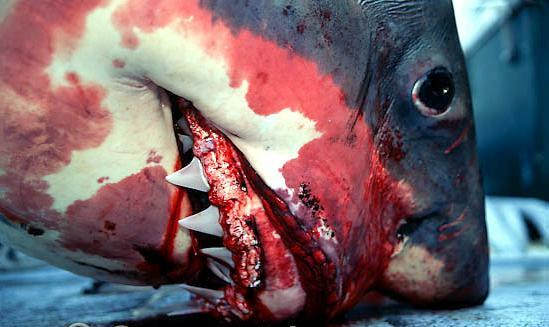 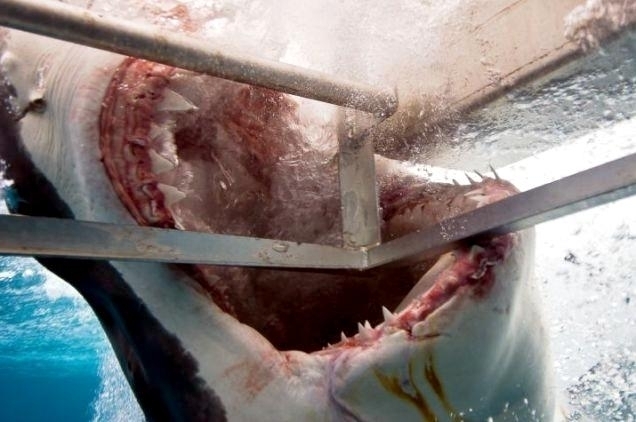 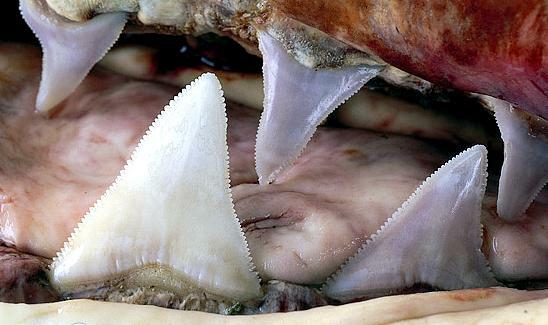 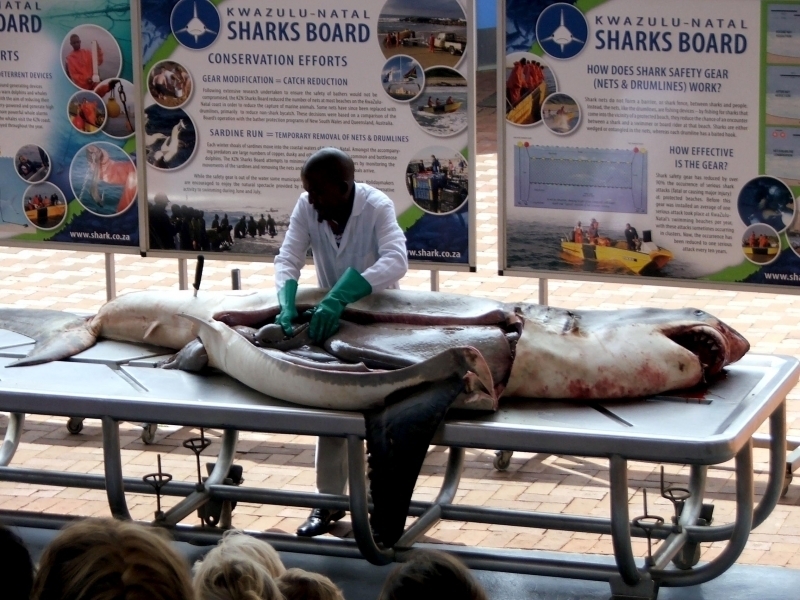 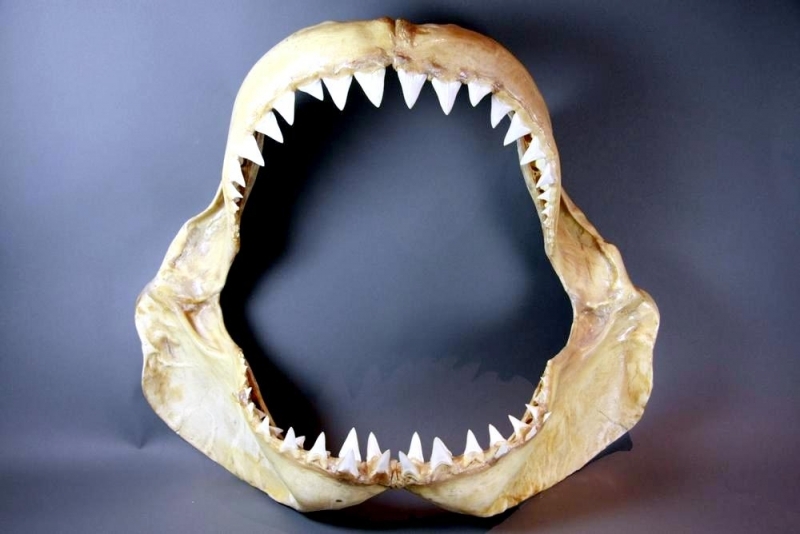 Their jaws & fins are sold for considerable amounts of money. 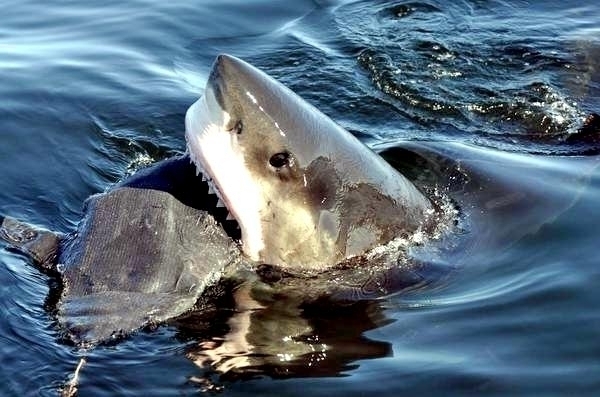 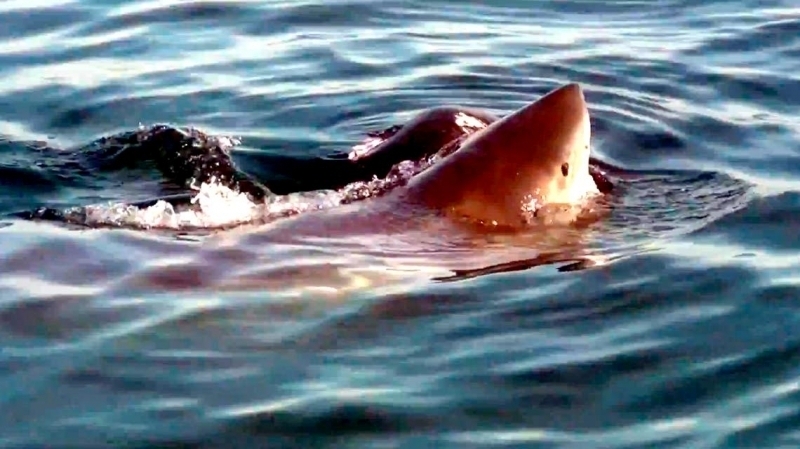 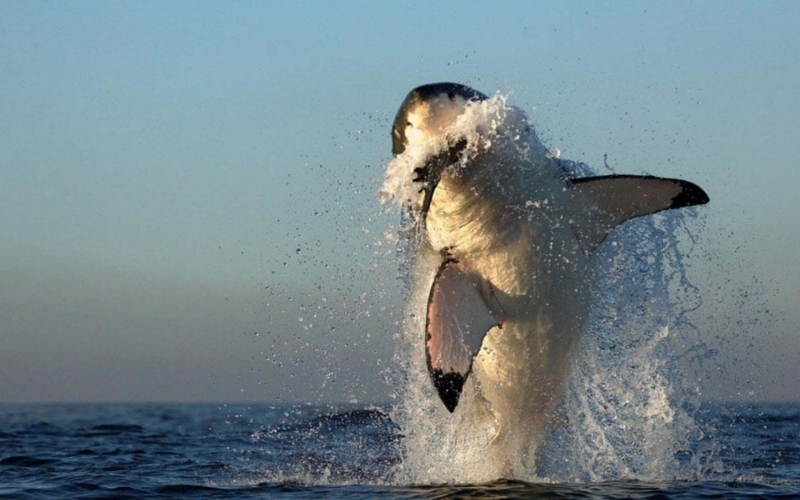 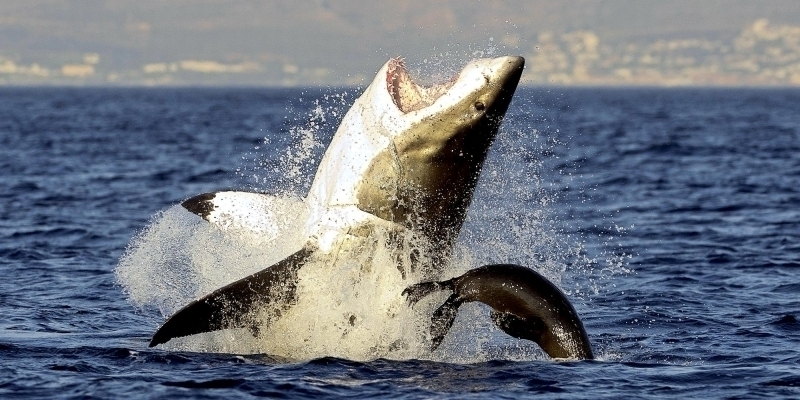 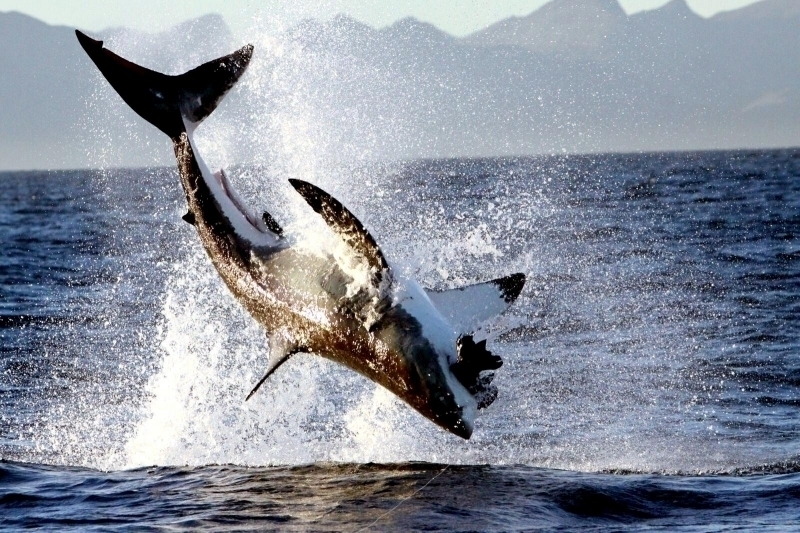 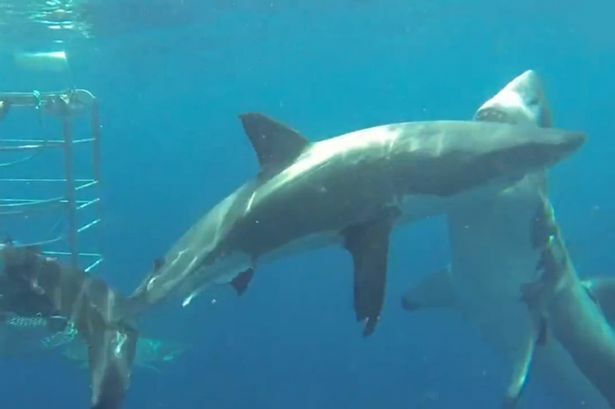 Not much is known about the mating habits of Great White Sharks. 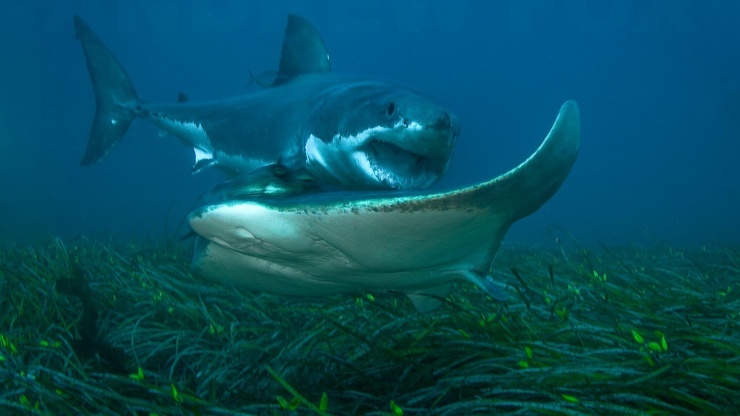 What is known is that after mating the female develops several eggs which hatch in her womb. 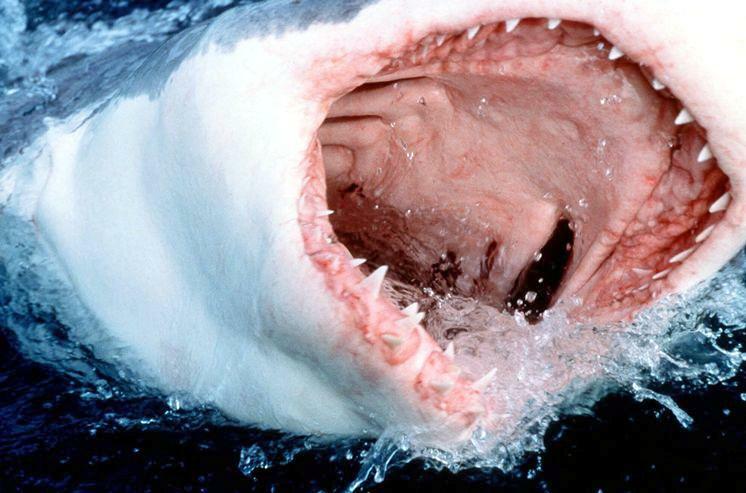 The newly hatched shark pups feed on unfertilized eggs in the womb as they develop before being born. 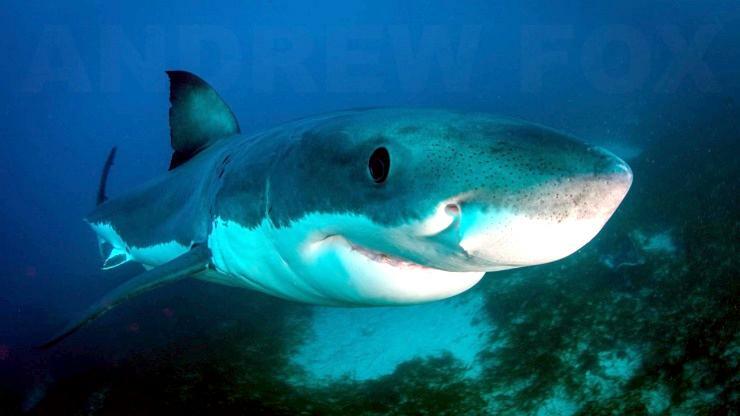 In general, the mother gives birth to a litter of 2 to 10 pups, each of which average 2-3 foot in length. 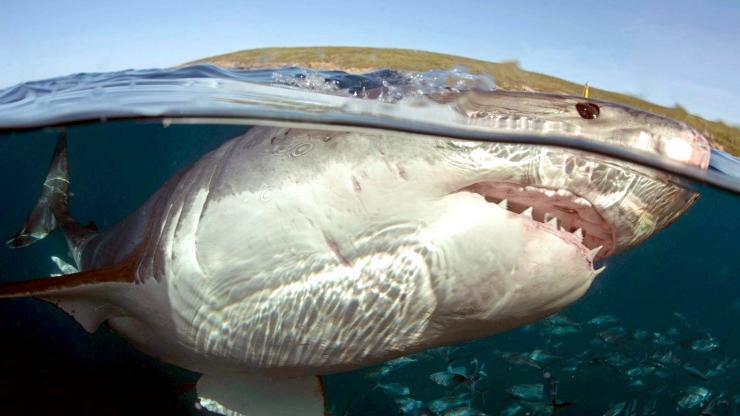 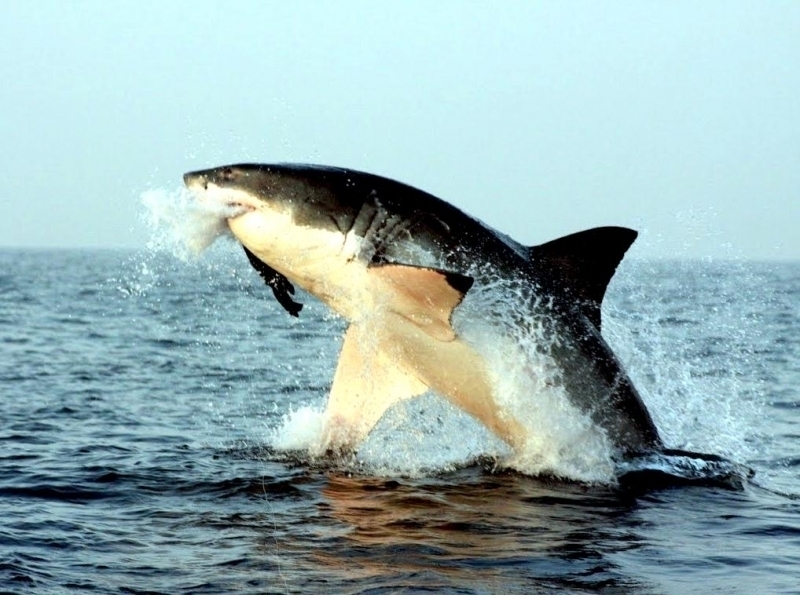 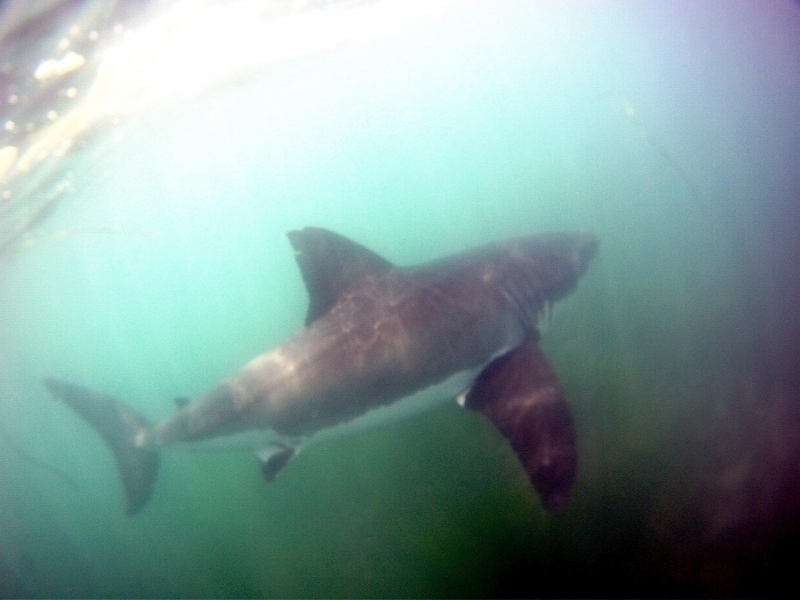 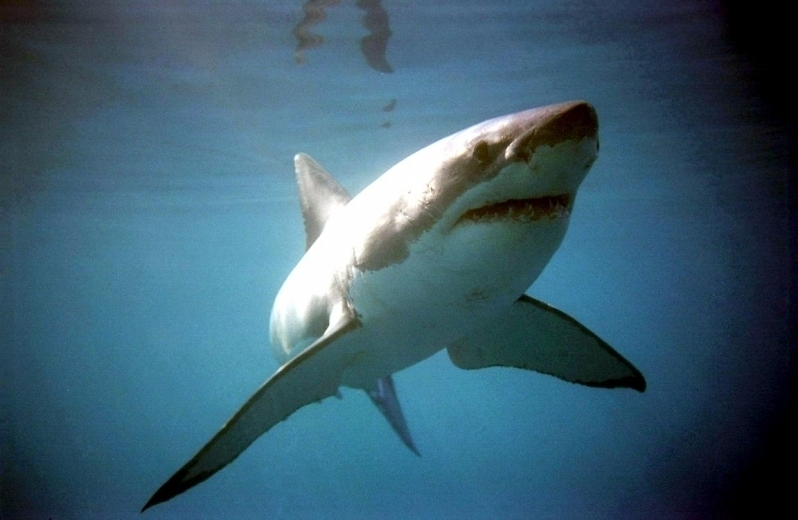 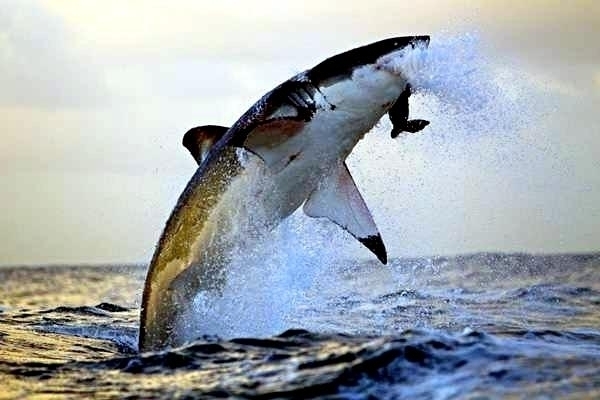 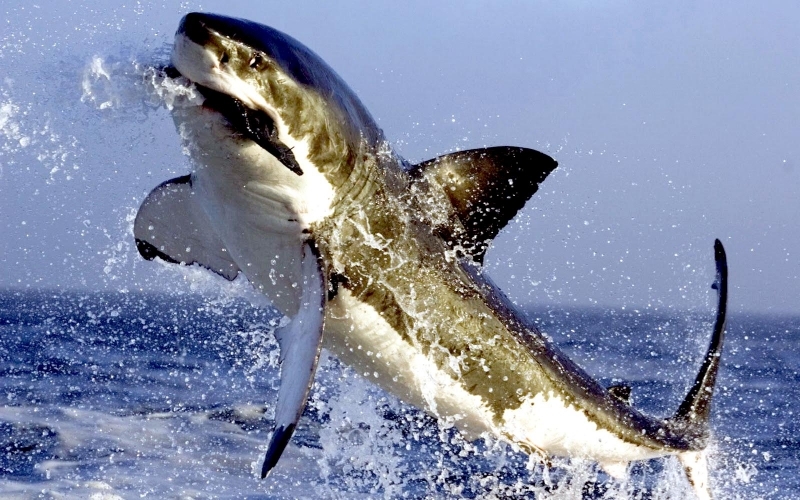 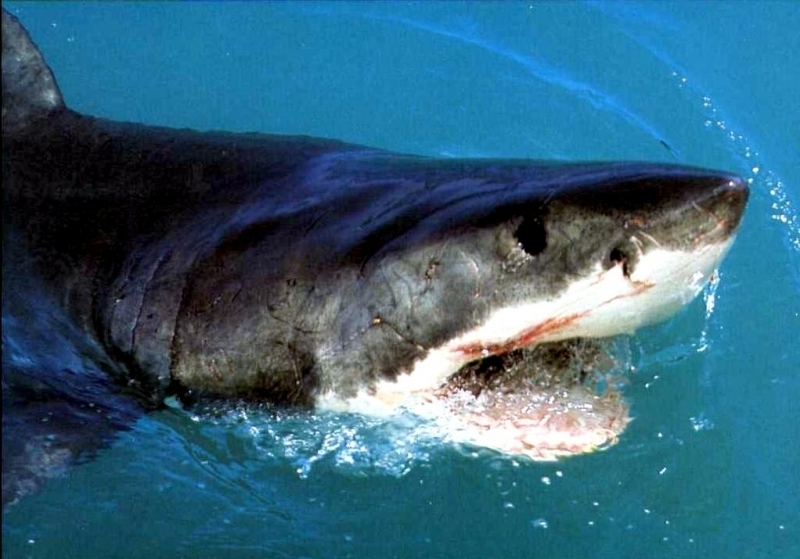 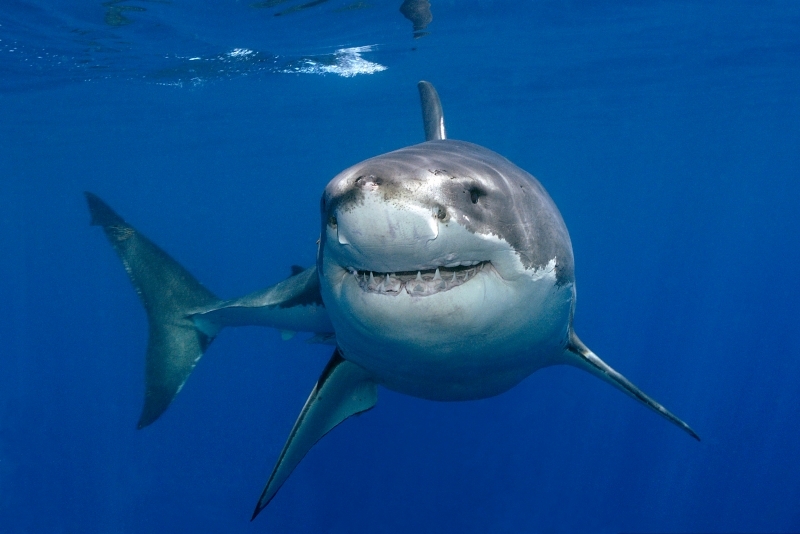 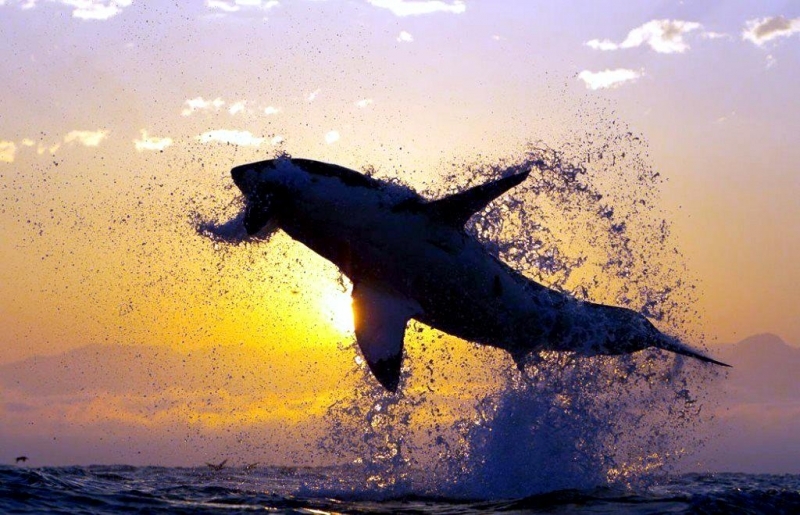 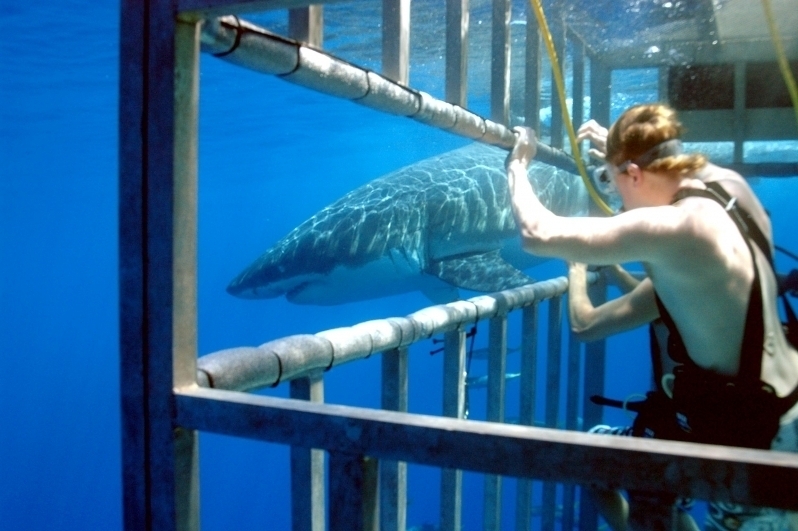 Male Great Whites reach maturity at 9-10 years of age. 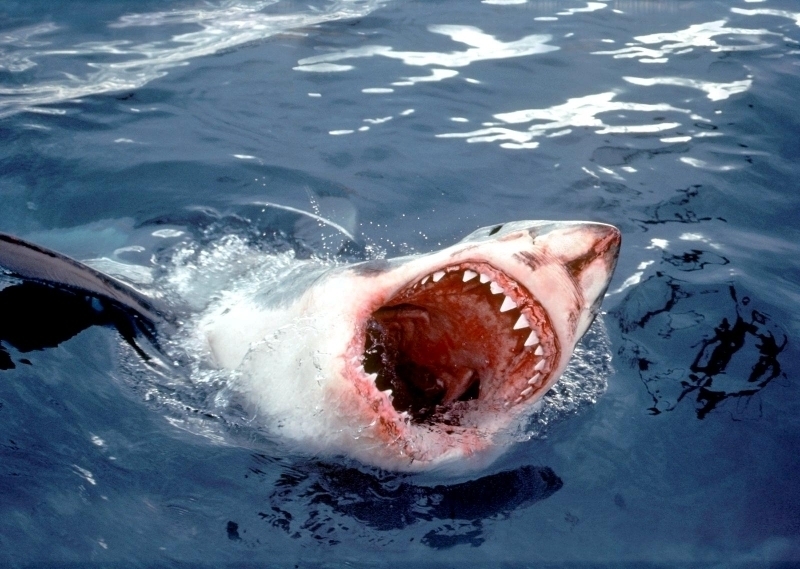 Females mature even later, between 14-16 years of age. 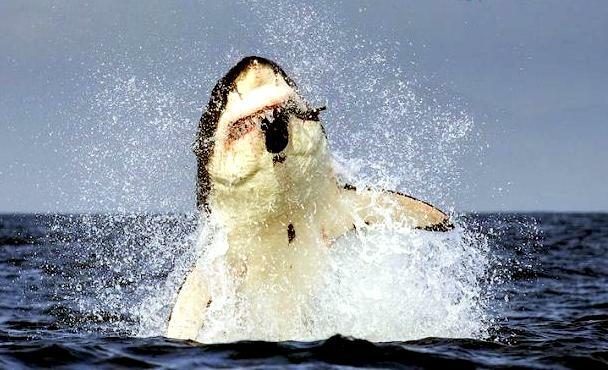 Females are thought to give birth once every couple of years, but even that is uncertain. 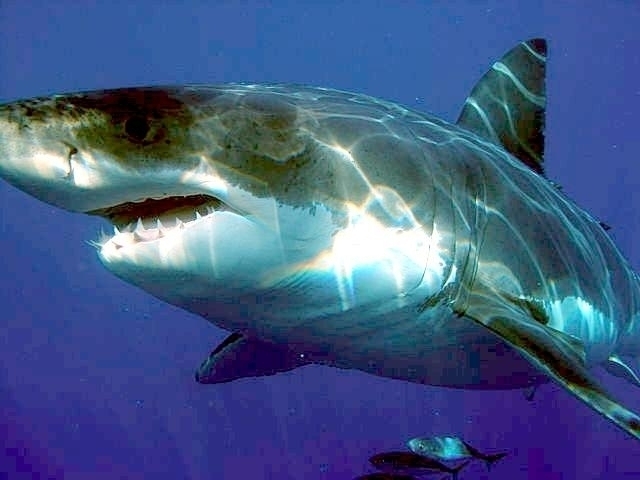 Great White Sharks spend their time in temperate waters all over the world, although they have been known to make brief trips into colder water in the north. 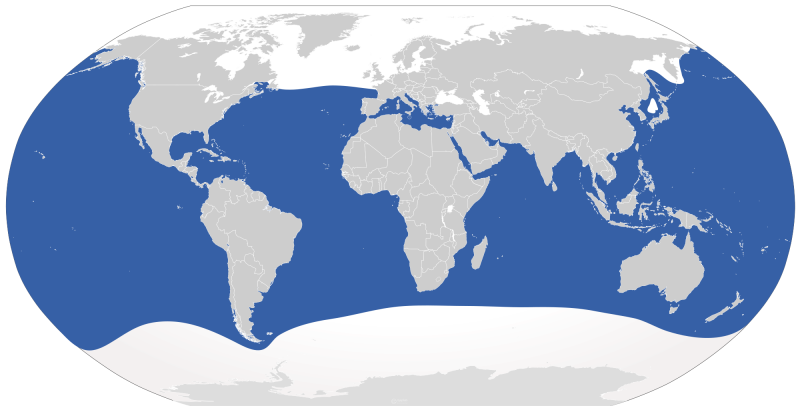 They live in the upper part of the ocean, towards the surface and close to the shore where sunlight shines through and prey is available.